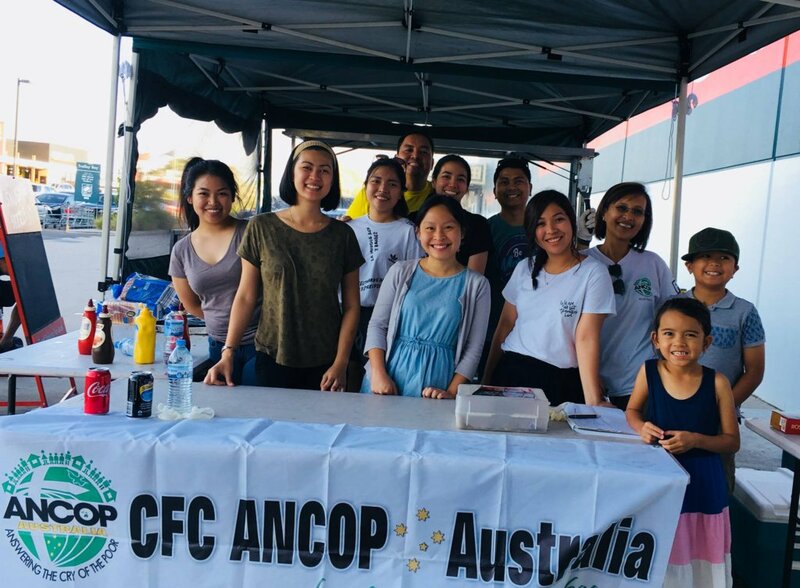 Happy New Year to all our ANCOP partners, donors, supporters and volunteers, and to our brothers and sisters in the CFC community! 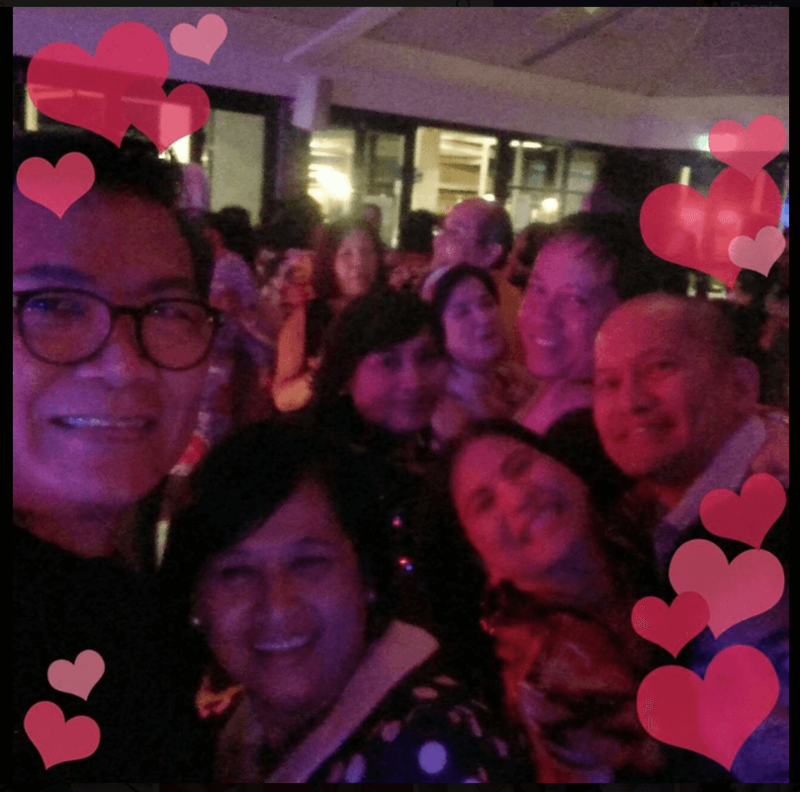 May you have a blessed year. 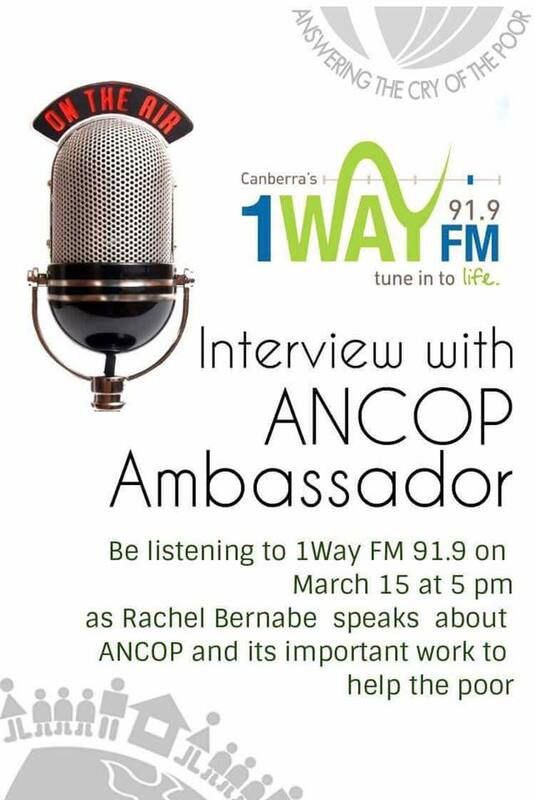 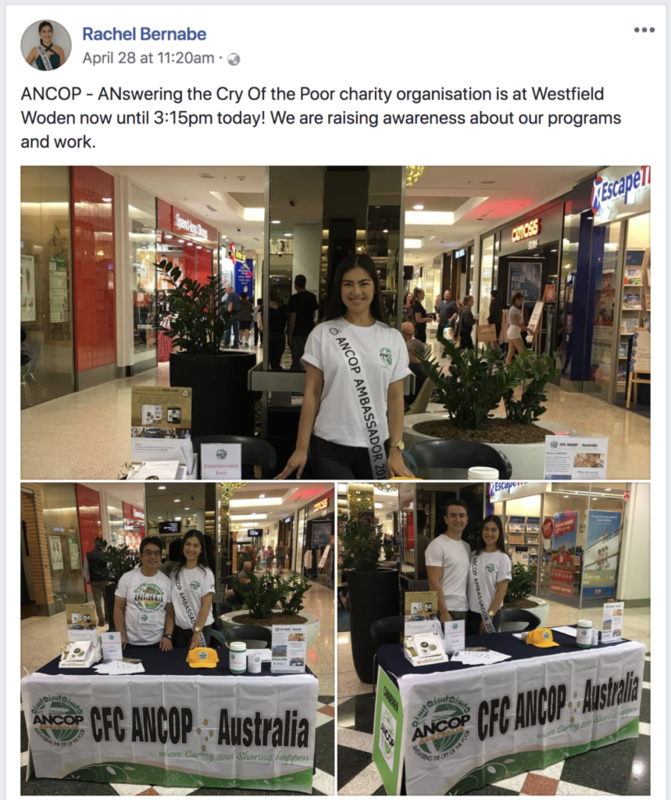 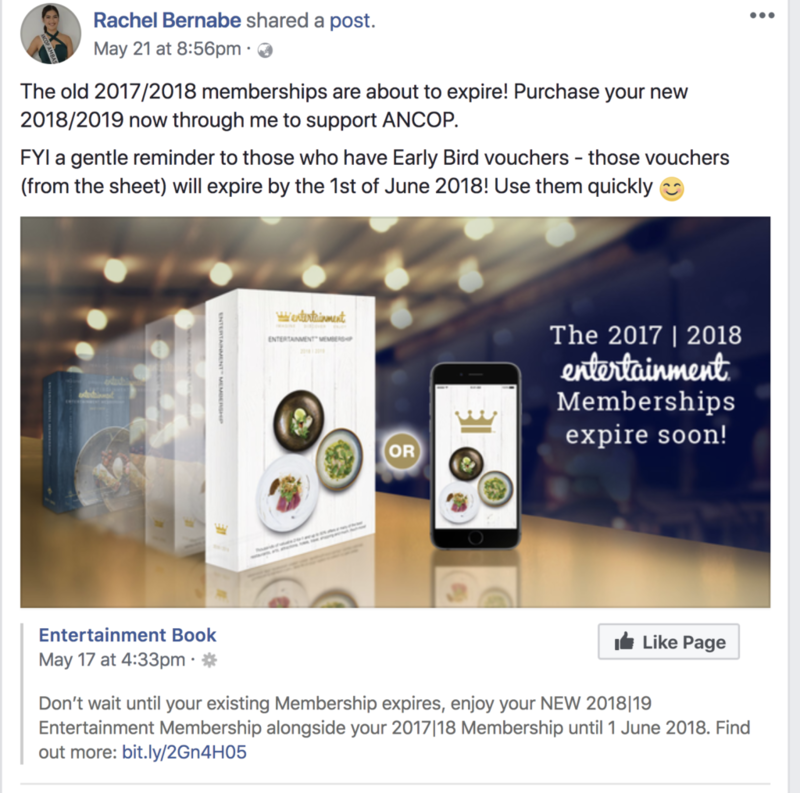 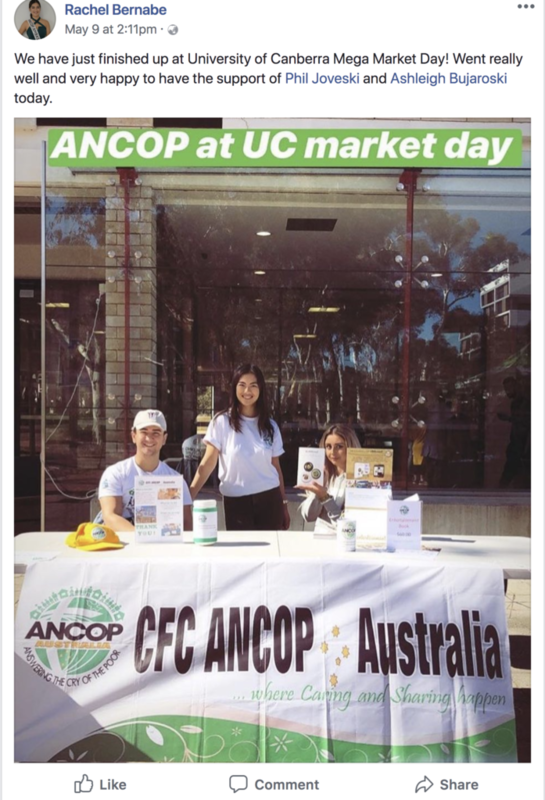 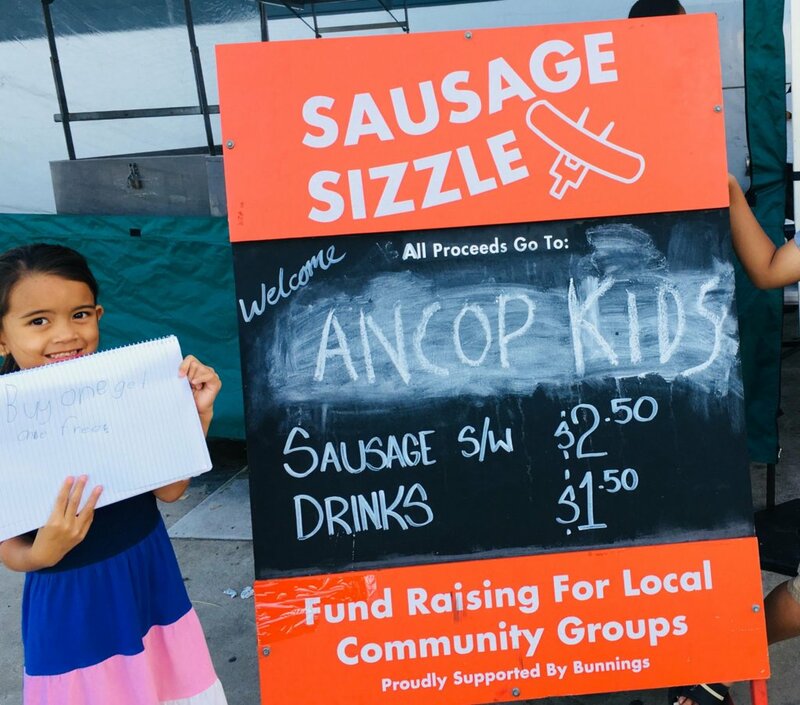 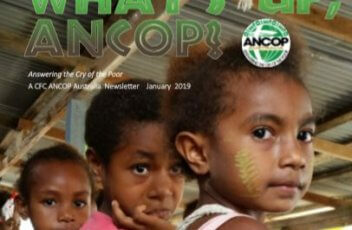 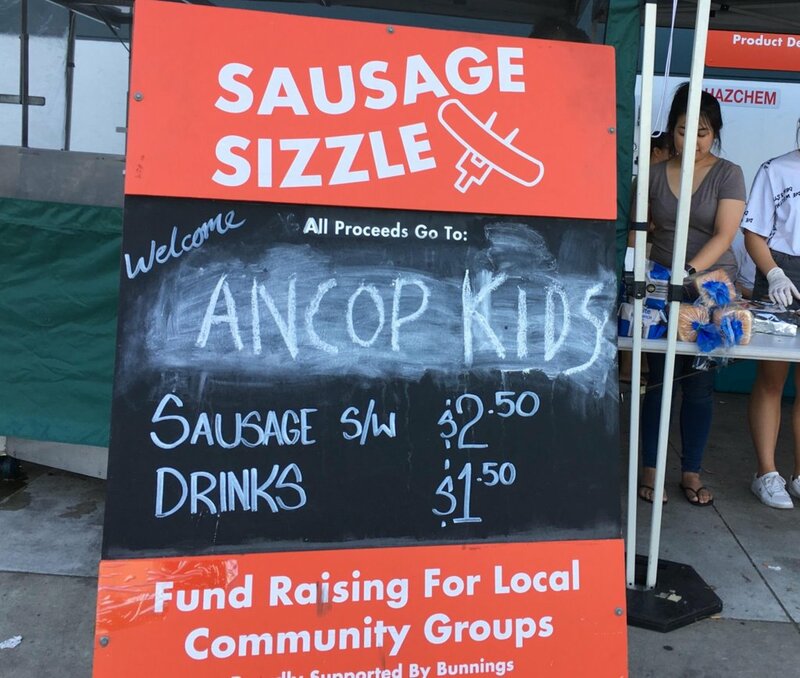 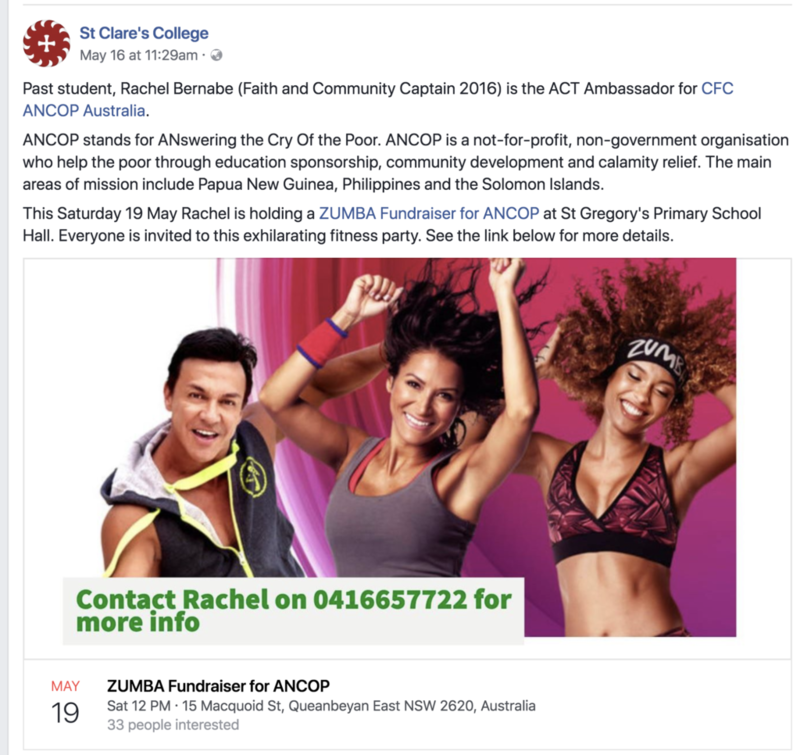 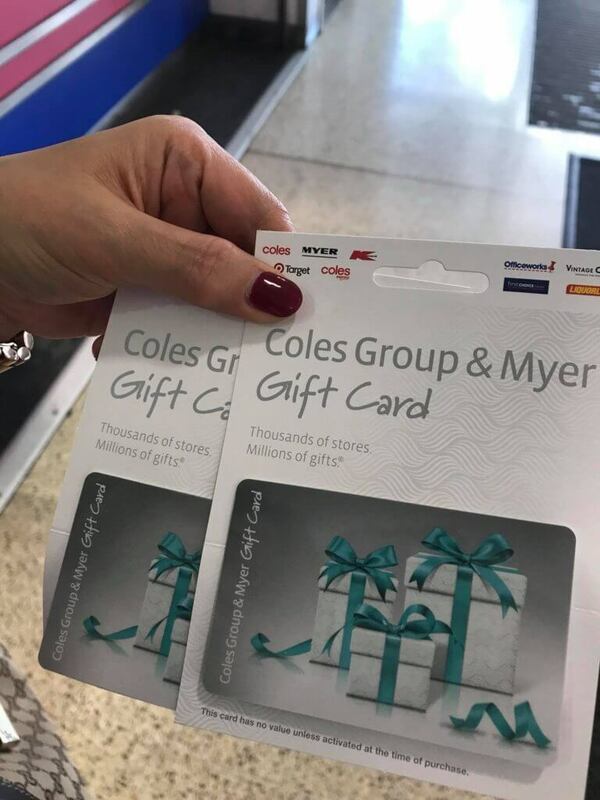 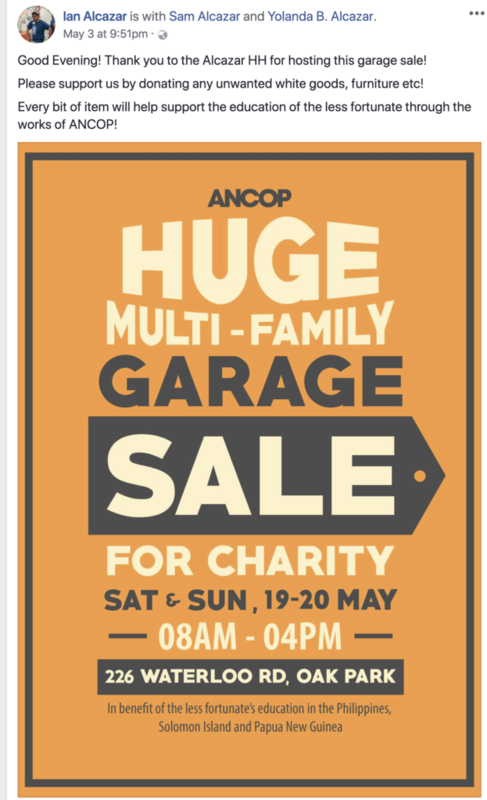 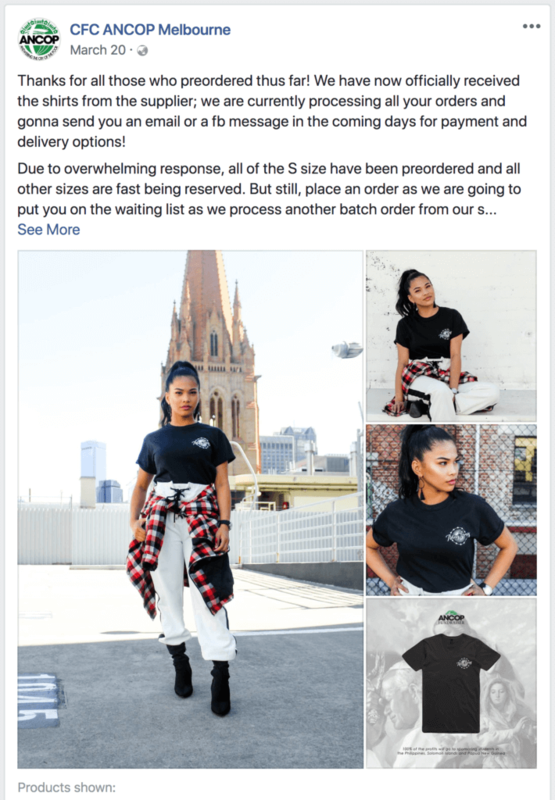 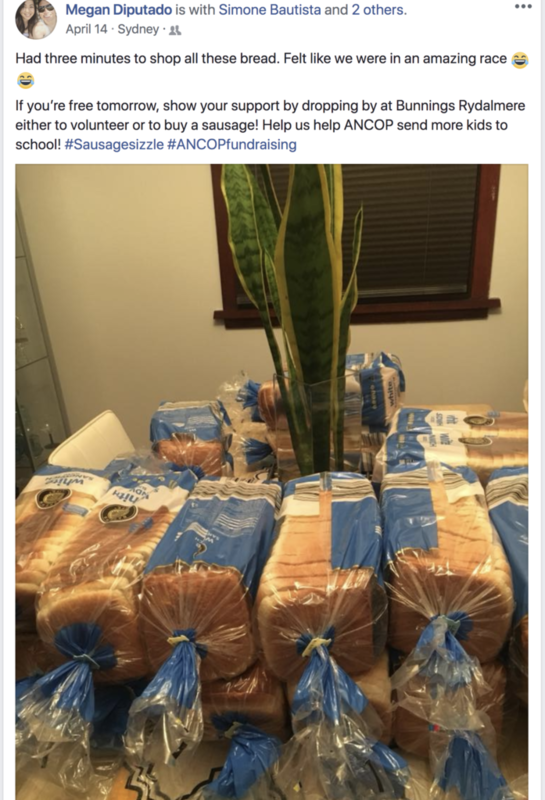 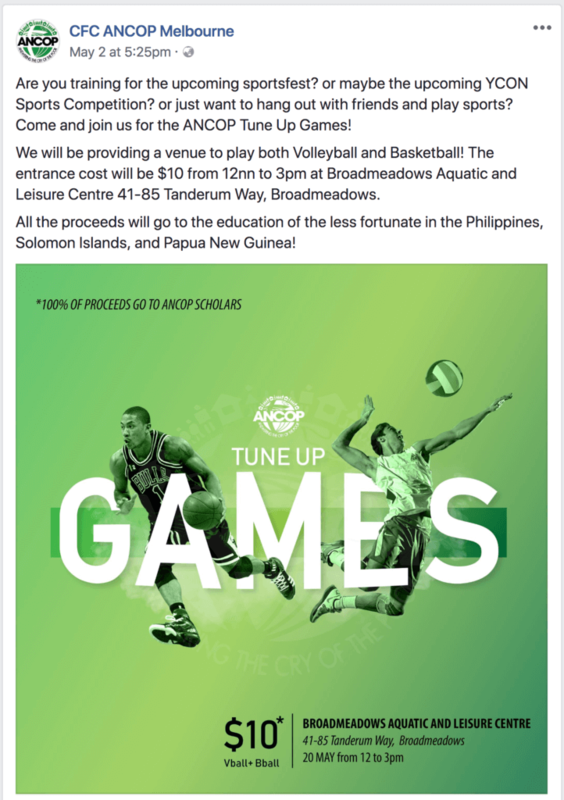 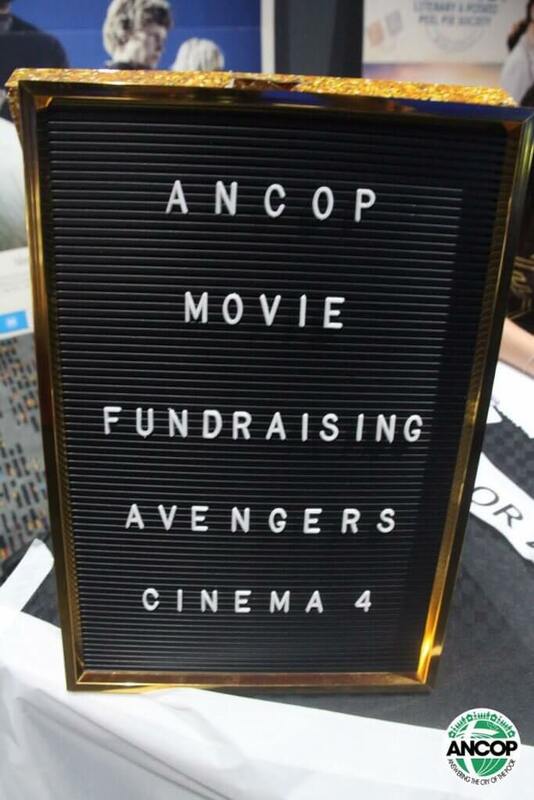 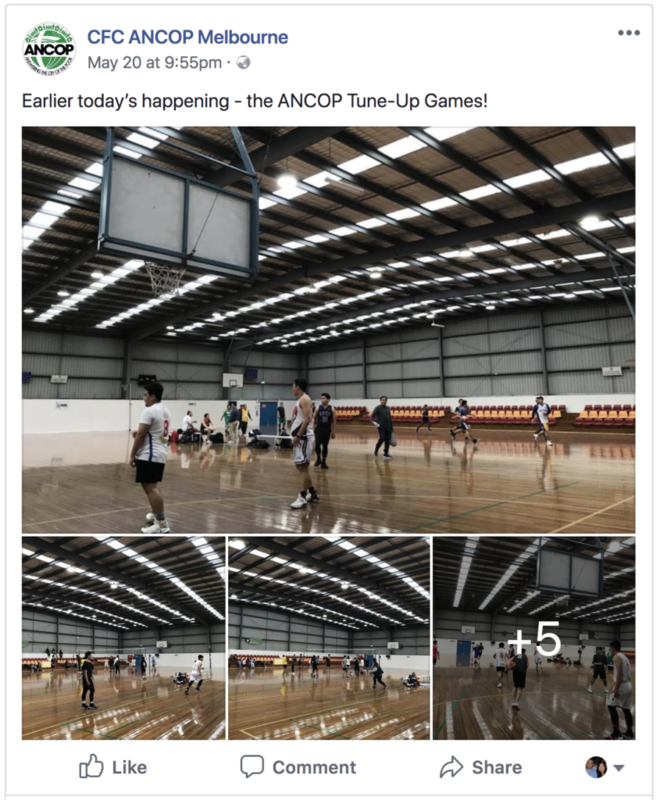 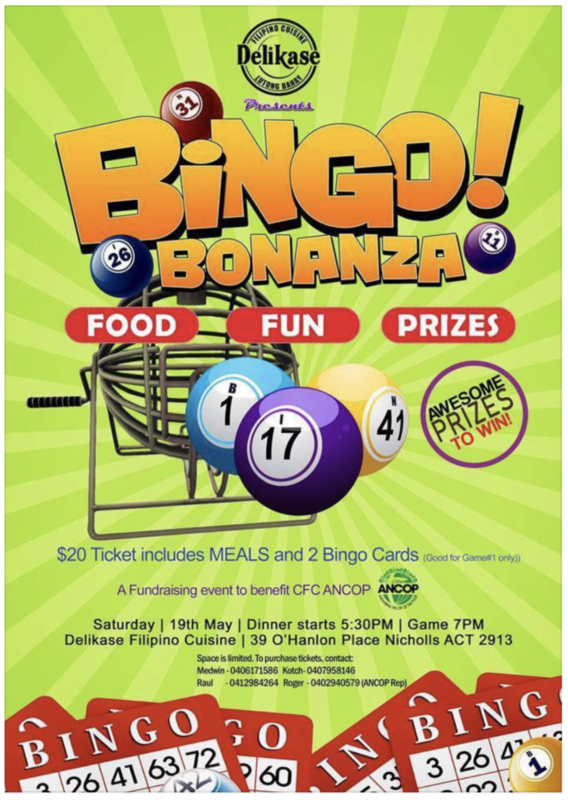 See below ANCOP Australia's latest edition of the What's Up, ANCOP? 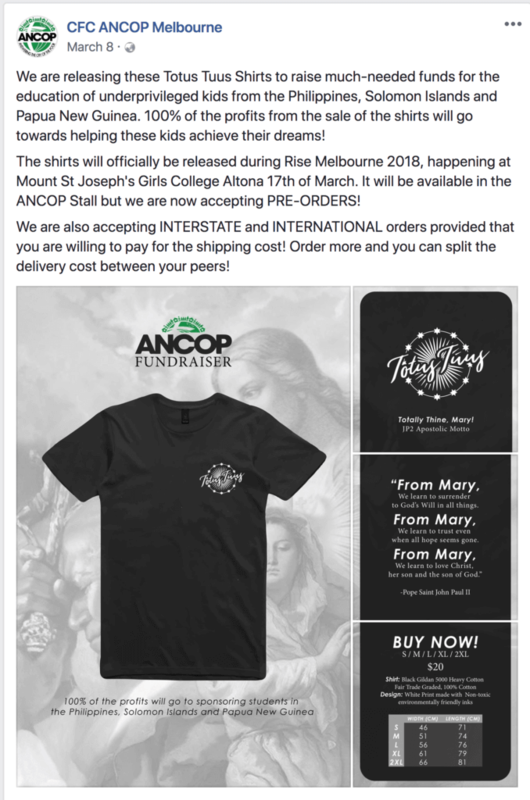 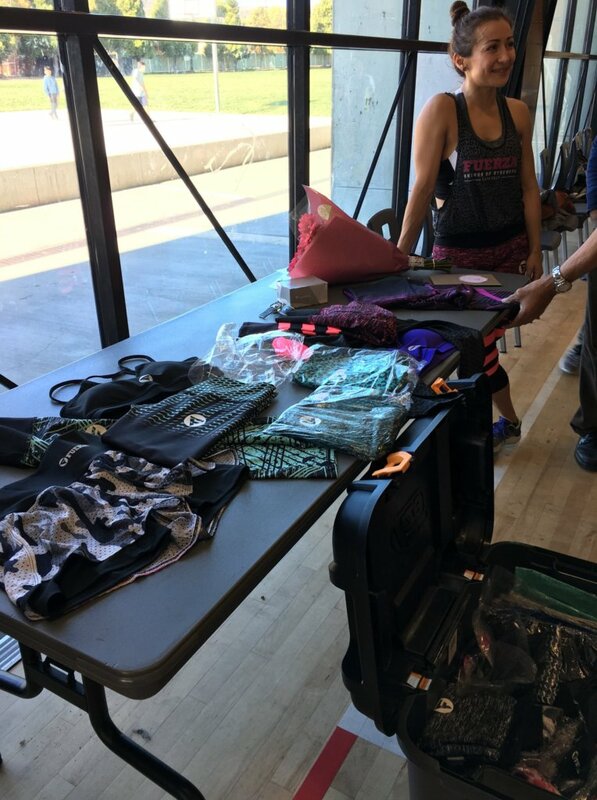 newsletter. 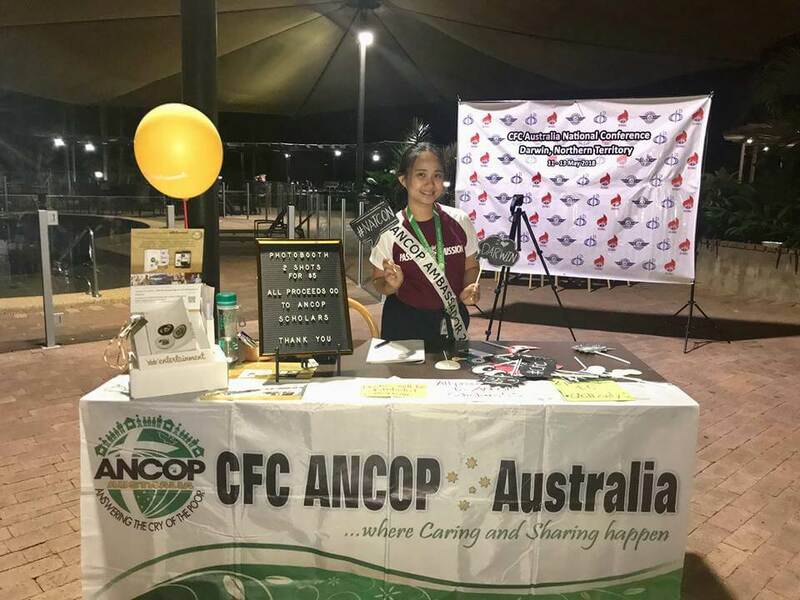 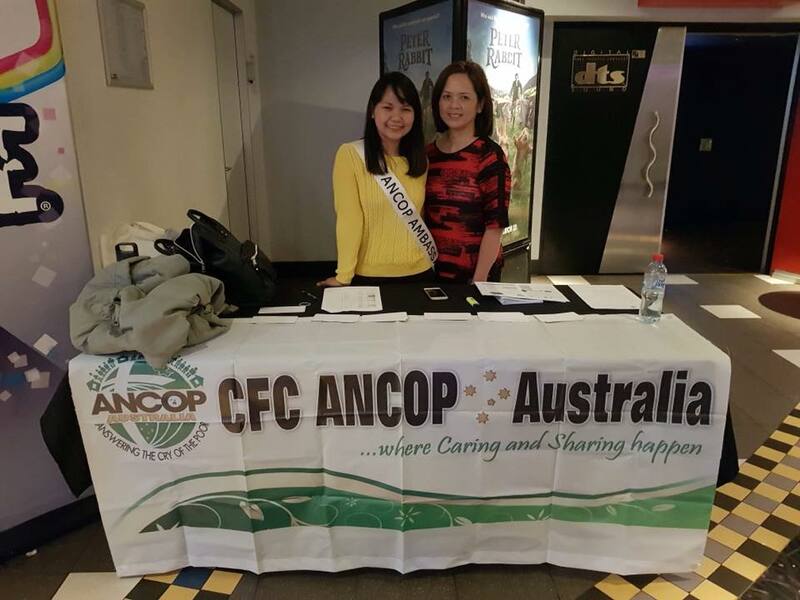 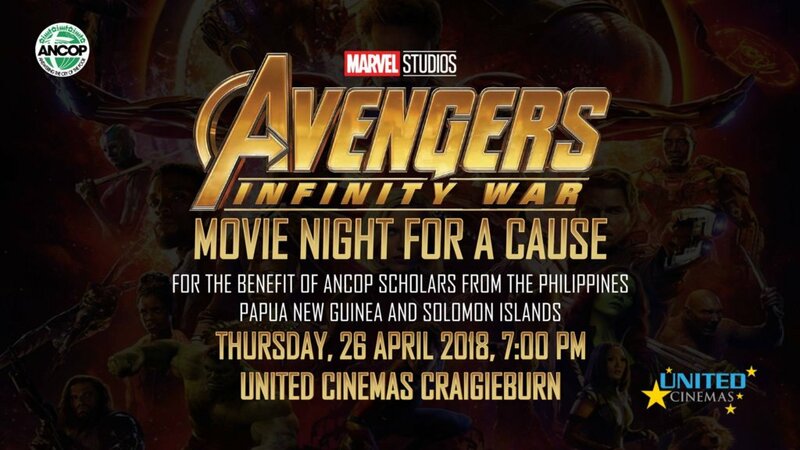 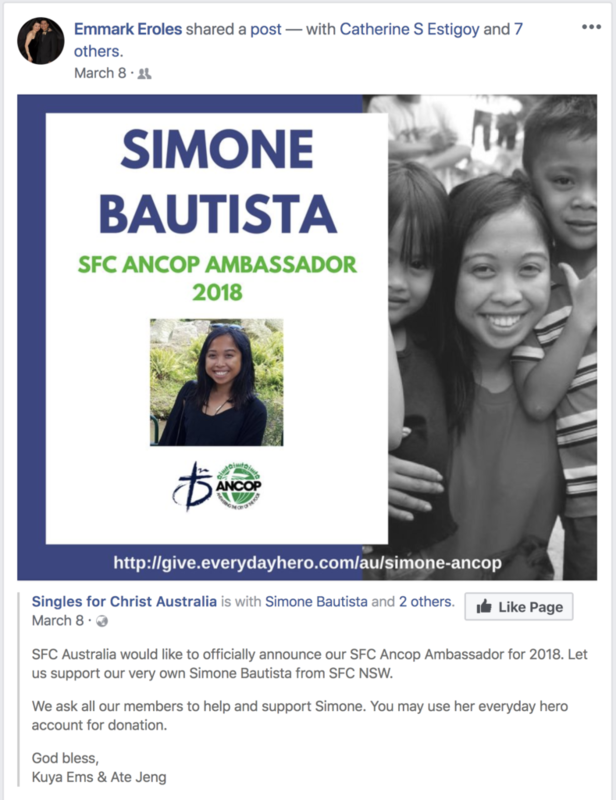 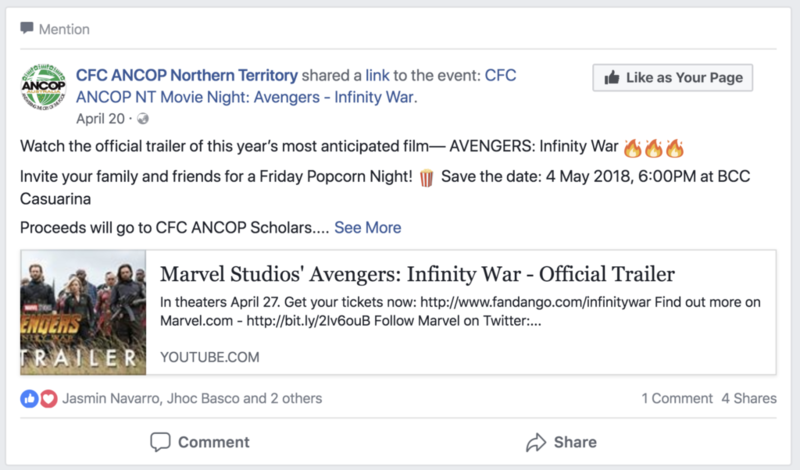 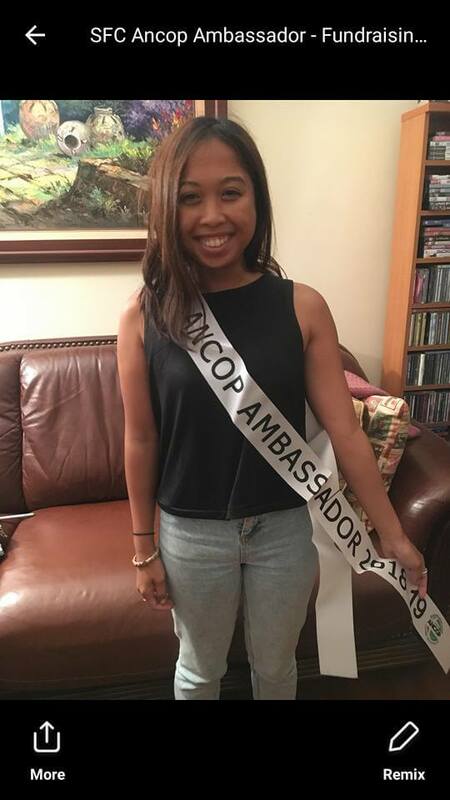 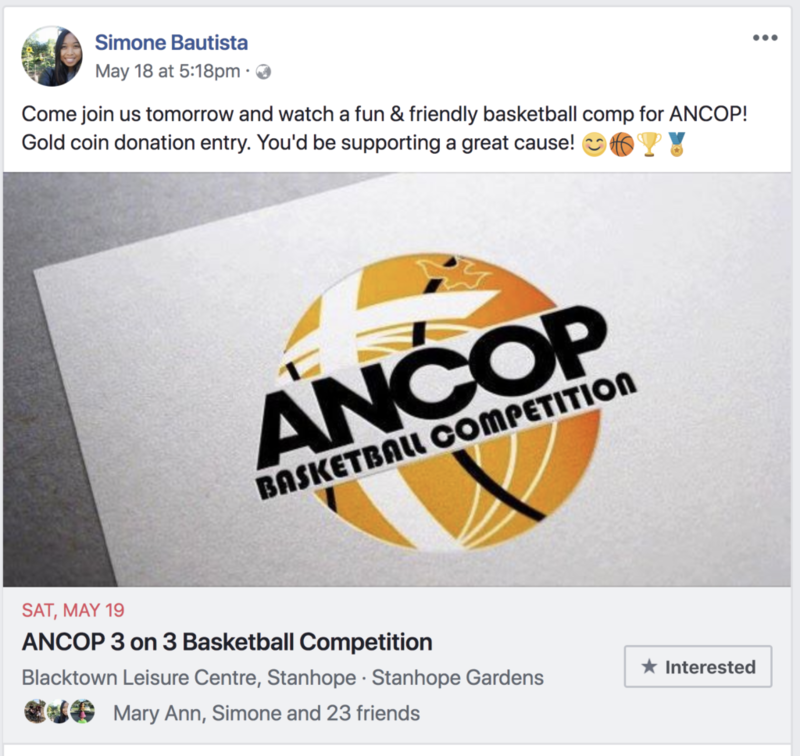 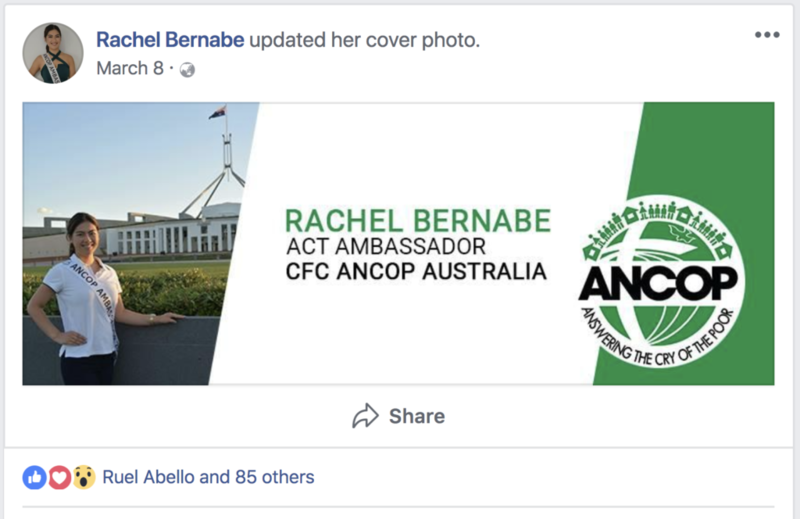 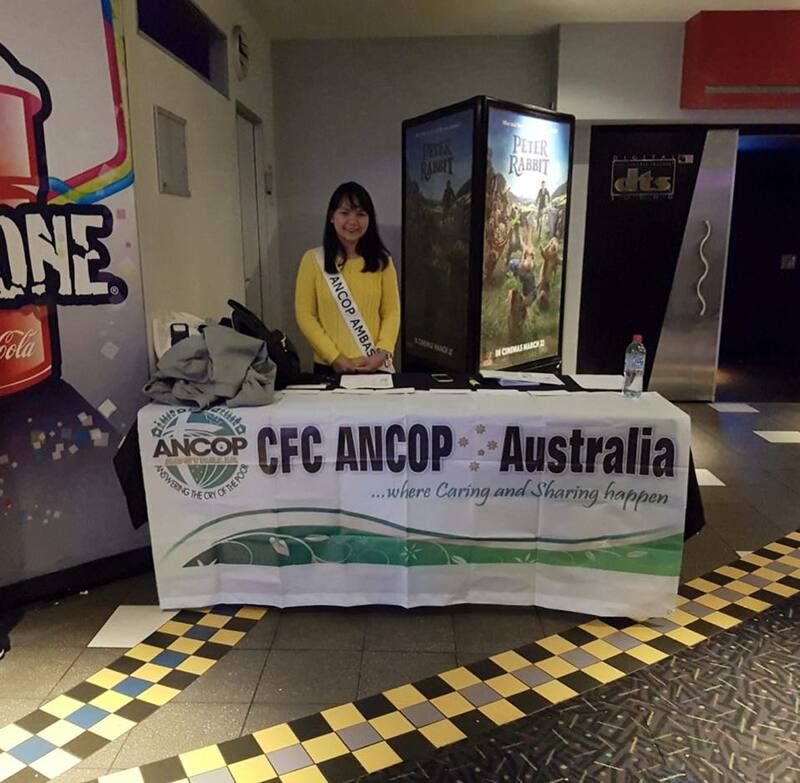 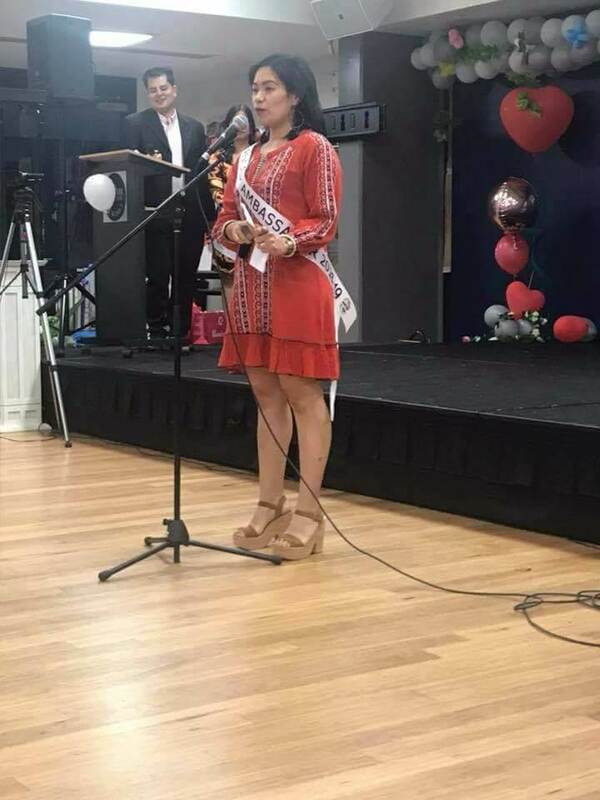 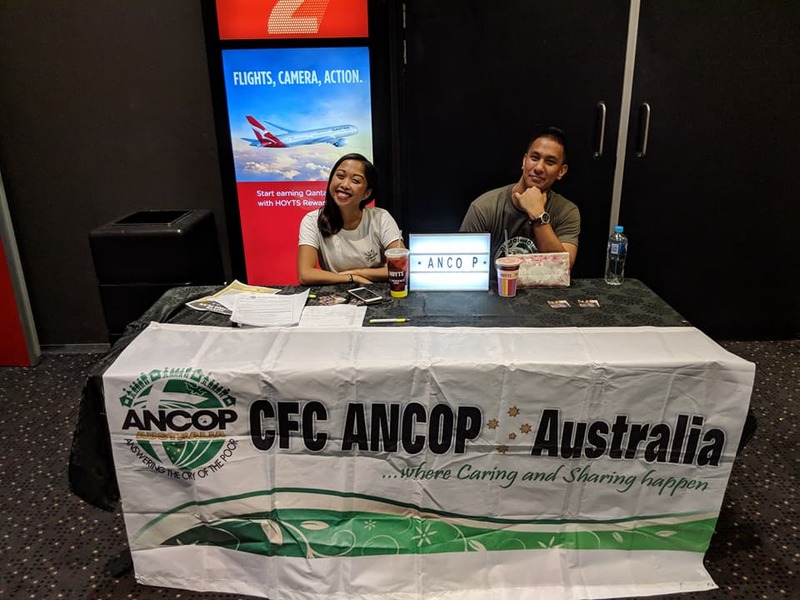 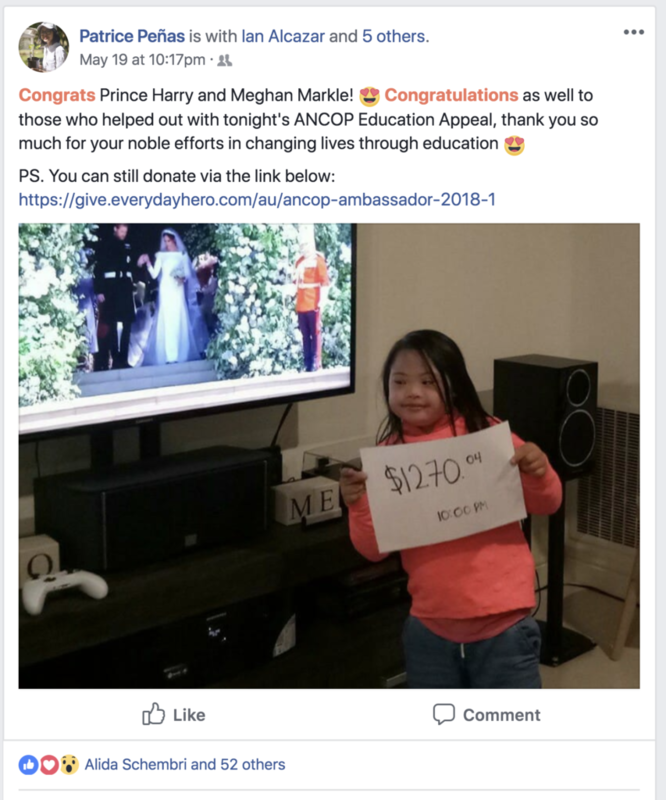 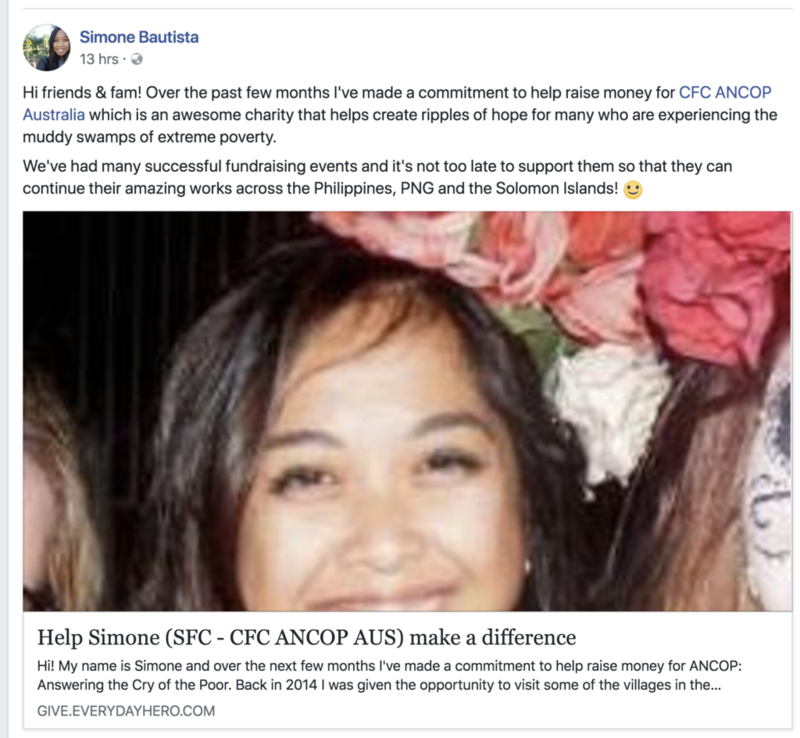 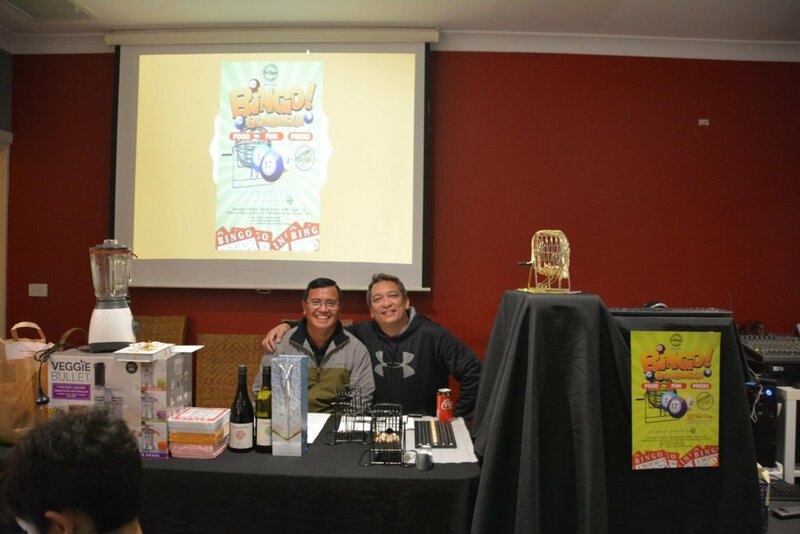 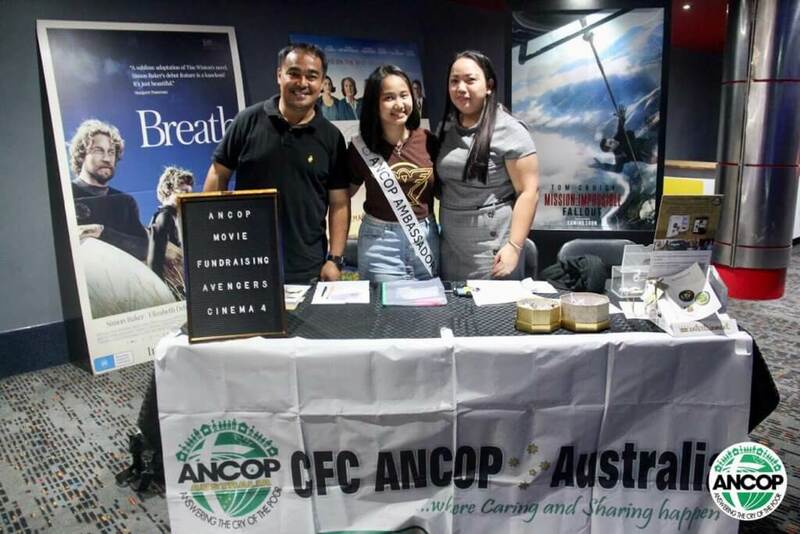 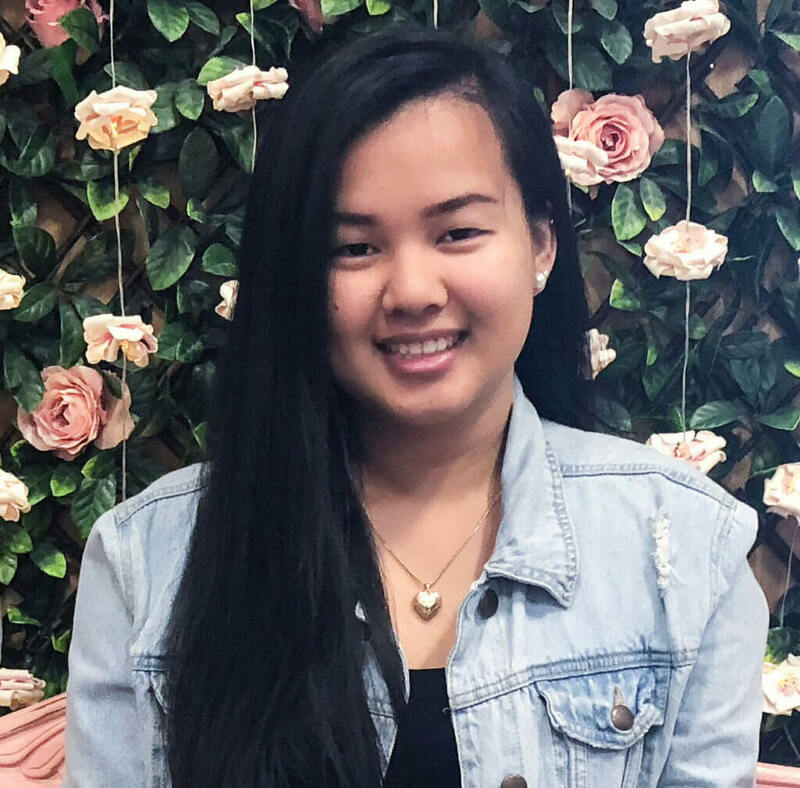 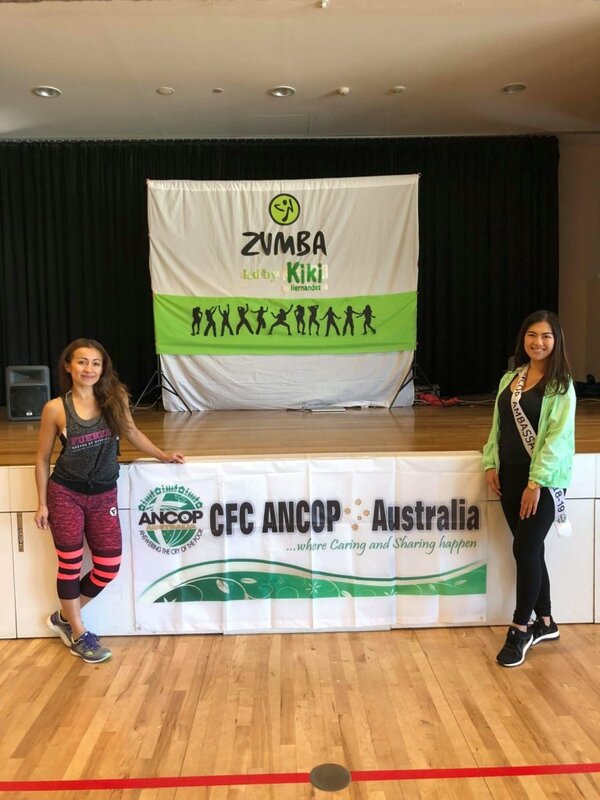 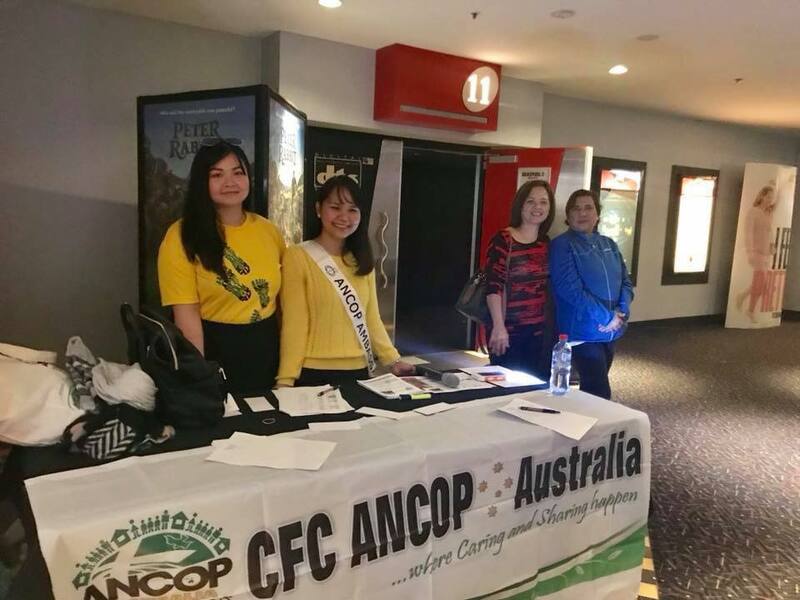 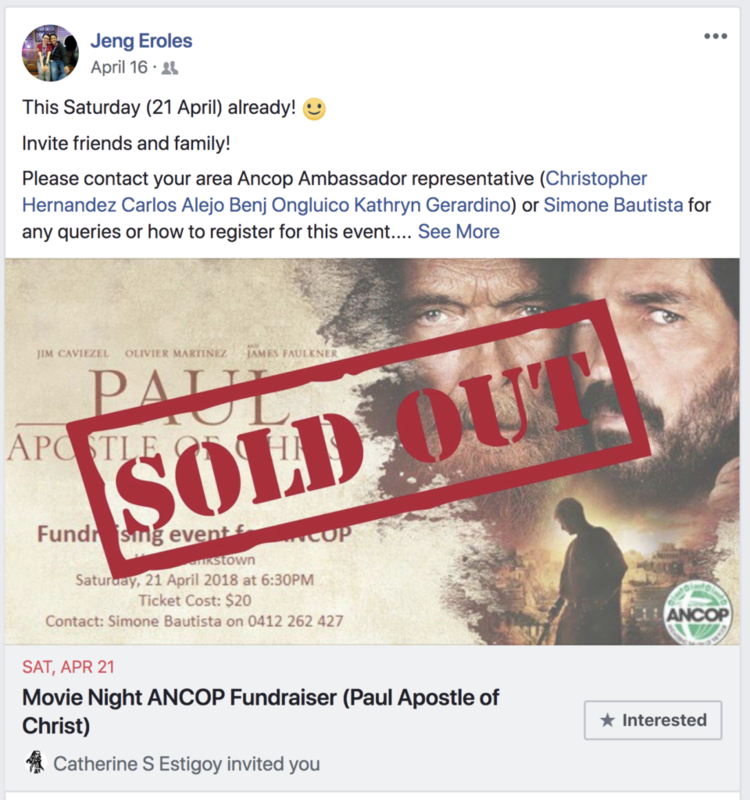 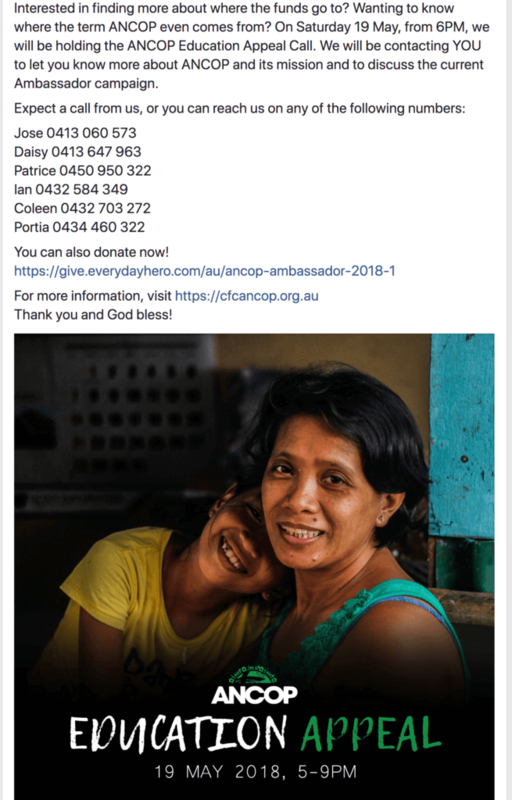 On behalf of everyone at the Philippine Consulate General in Sydney, I extend greetings and best wishes to CFC ANCOP on your Ambassador Proclamation Night. 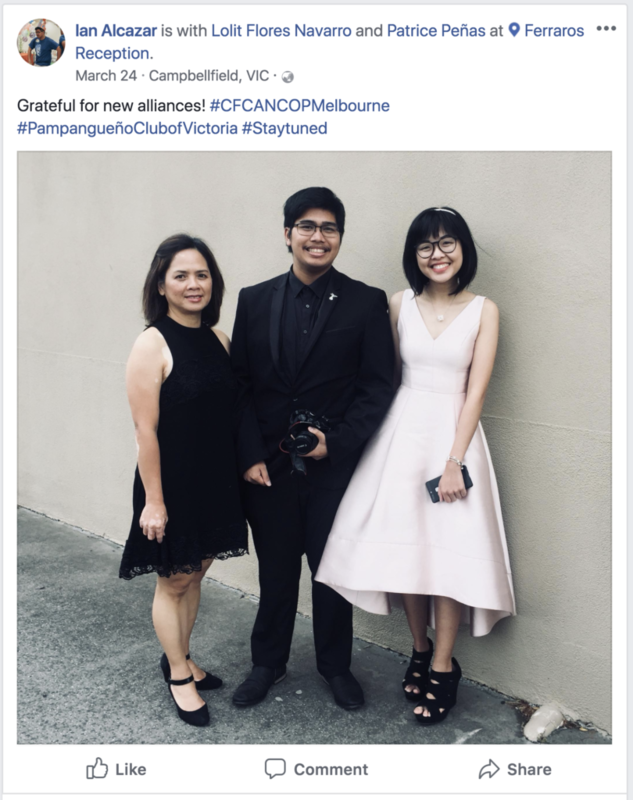 What a wonderful evening it has been. 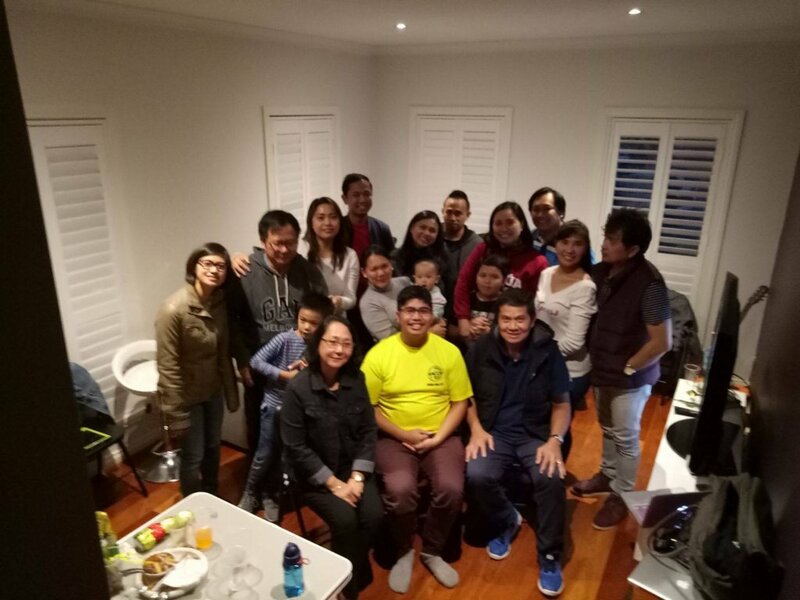 As mentioned during the introduction, I am relatively new to Australia. 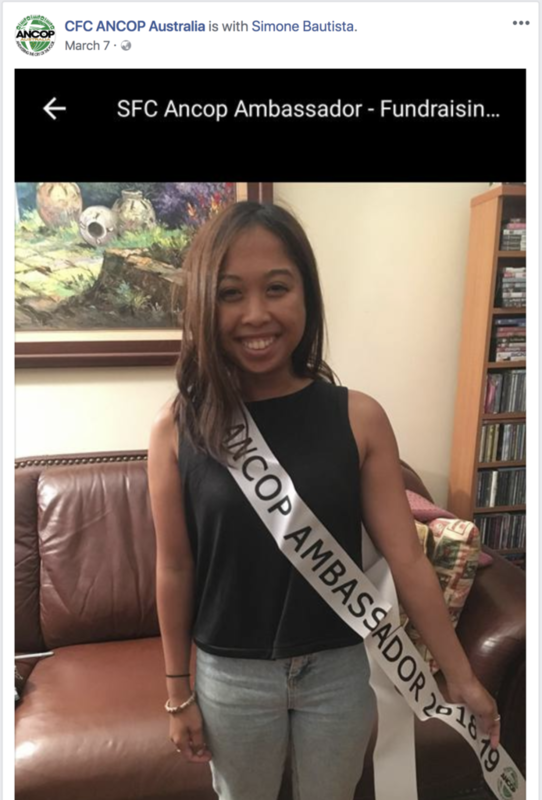 I just assumed my position as Consul late last year. 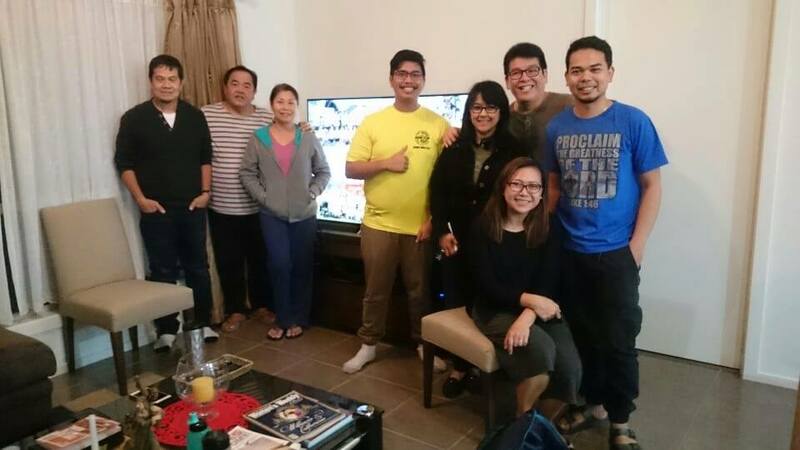 So I am still very much in familiarization and getting-to-know-you mode. 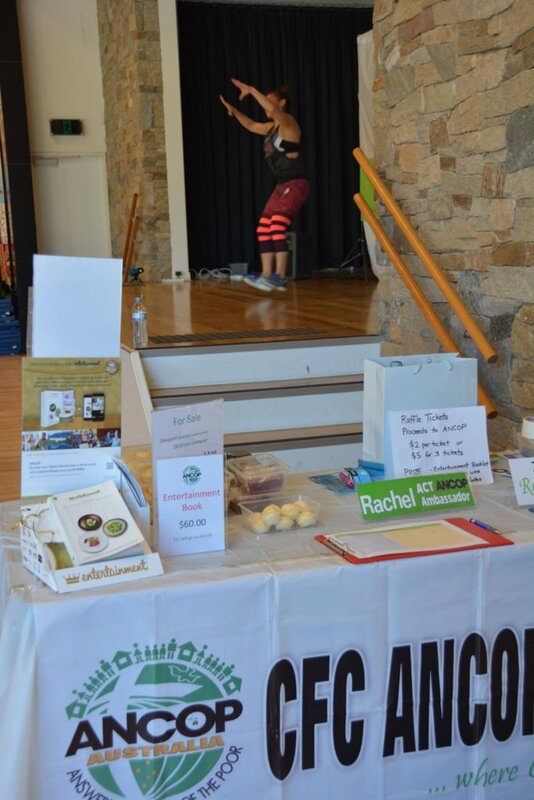 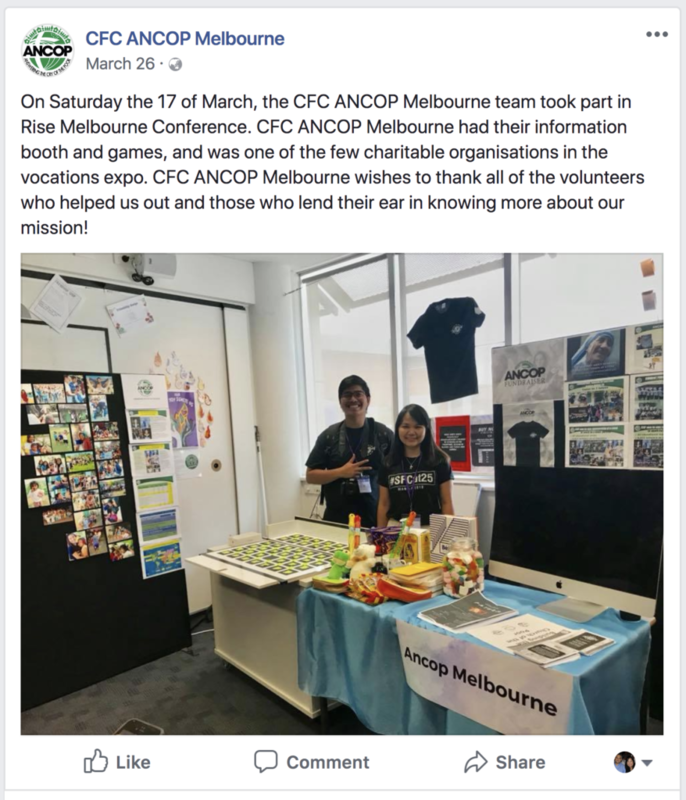 Many people I meet, many organizations I work with, many activities I participate in, I do so for the first time. 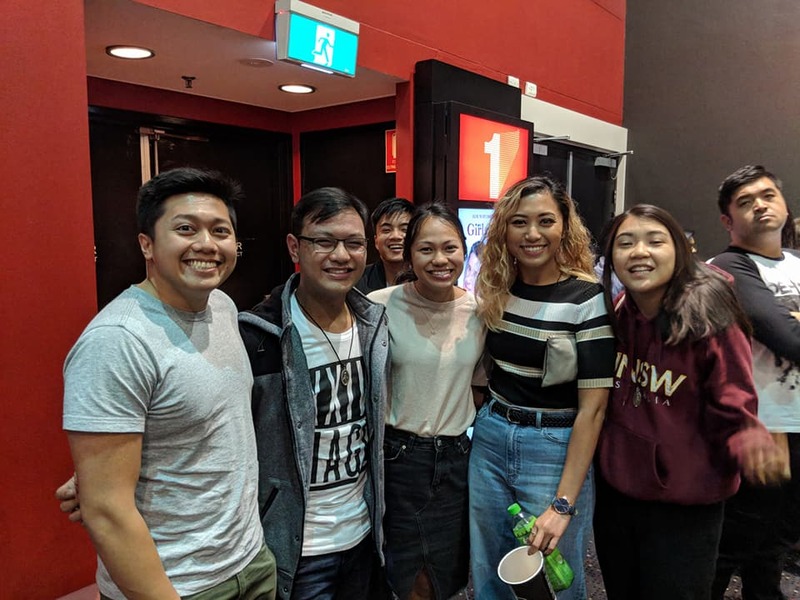 Yet from my first day in Sydney, I realized that there’s something special here. 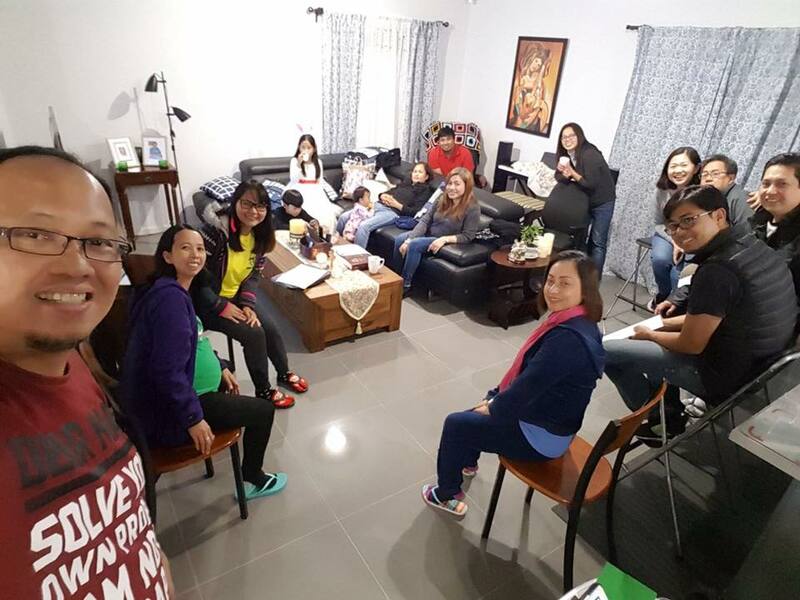 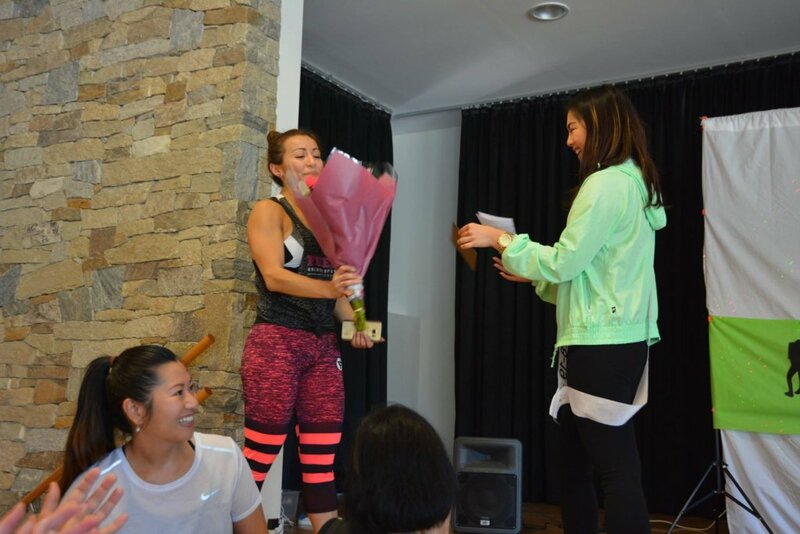 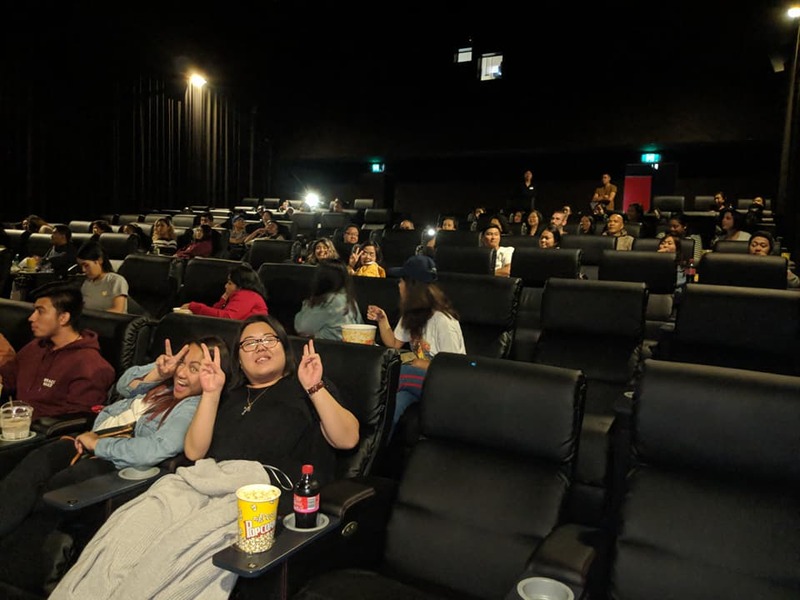 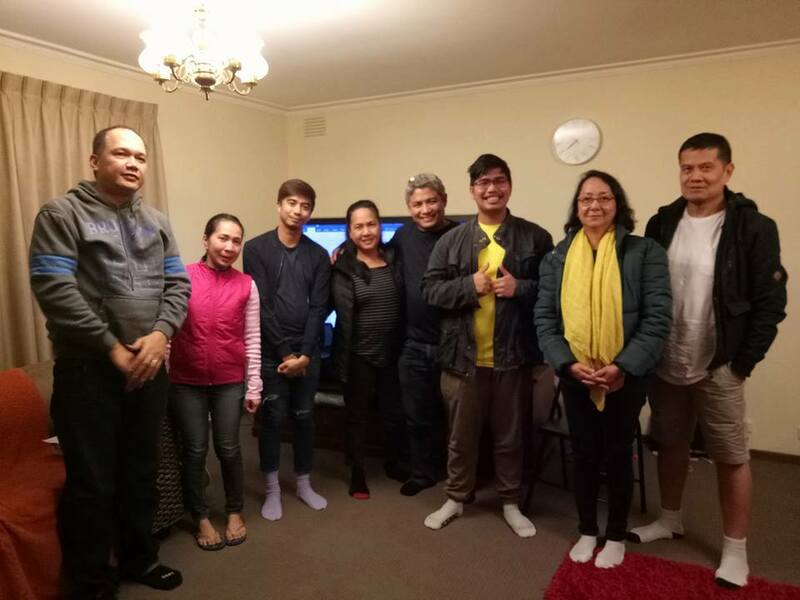 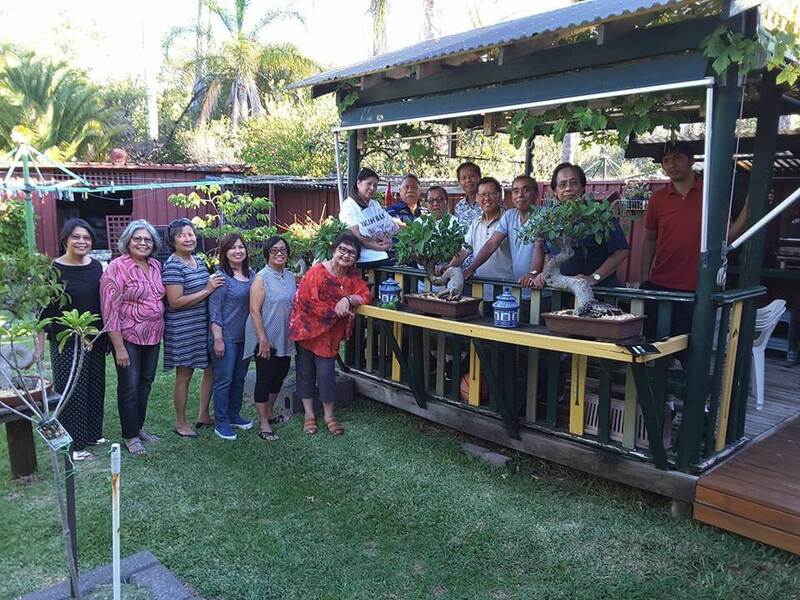 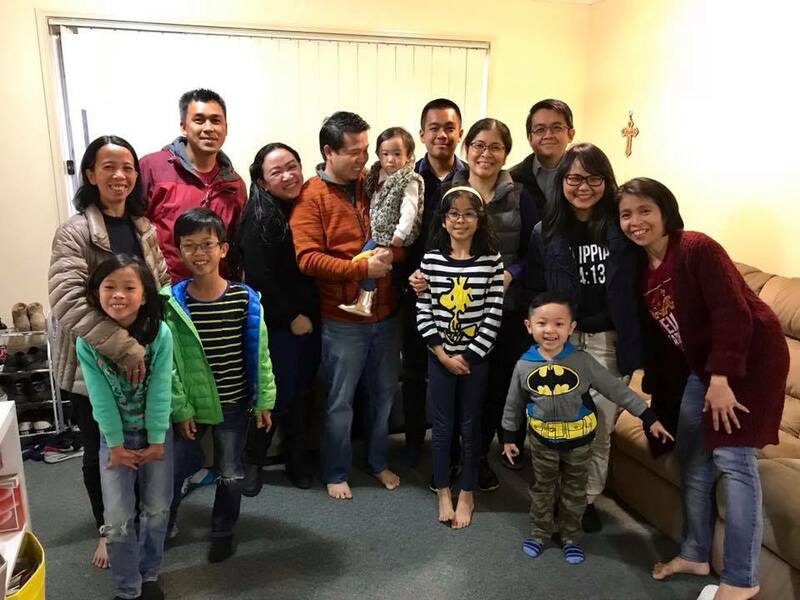 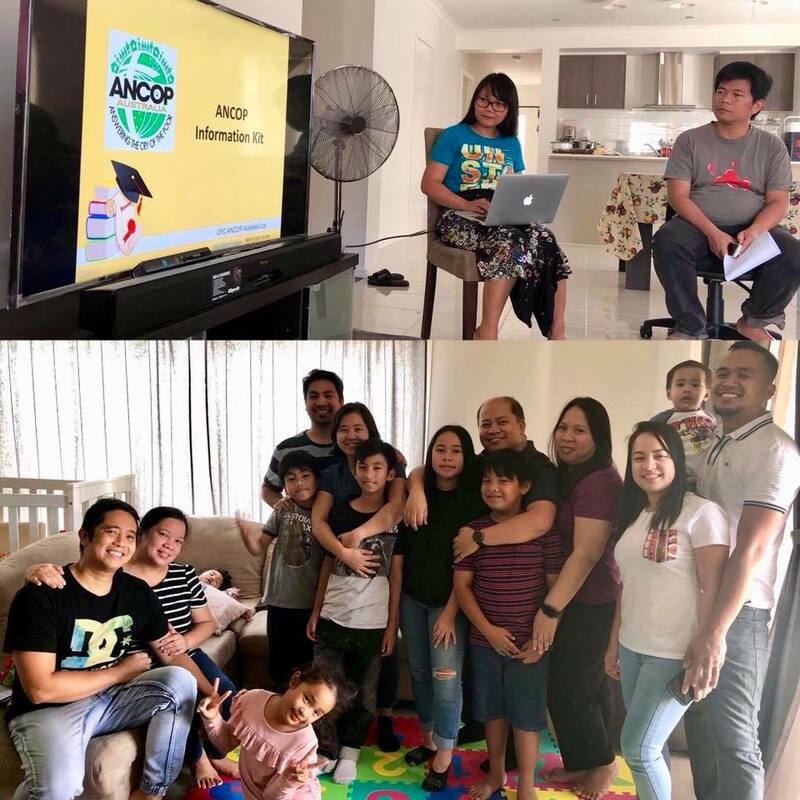 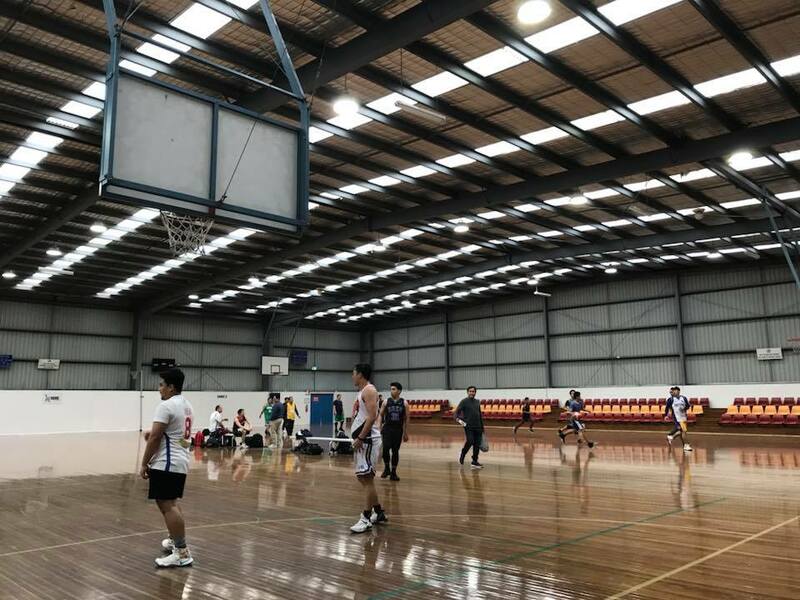 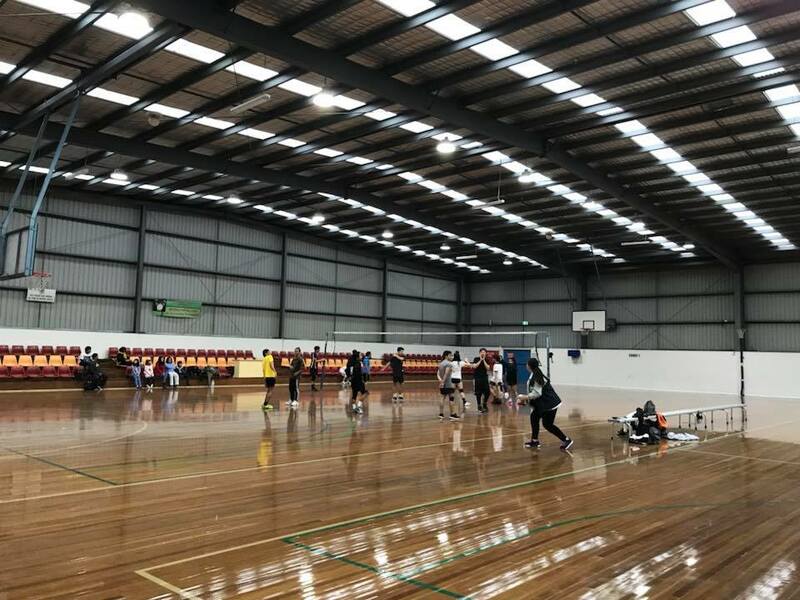 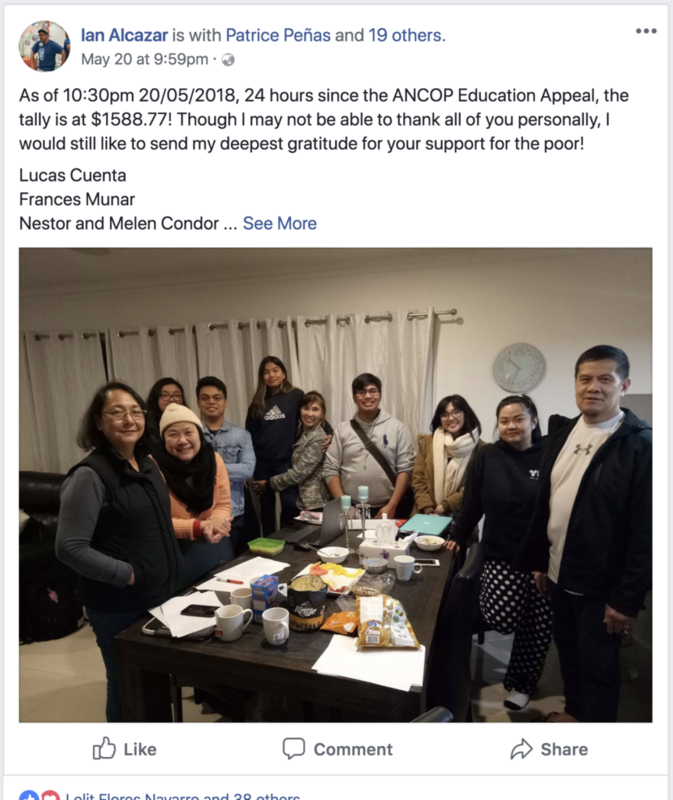 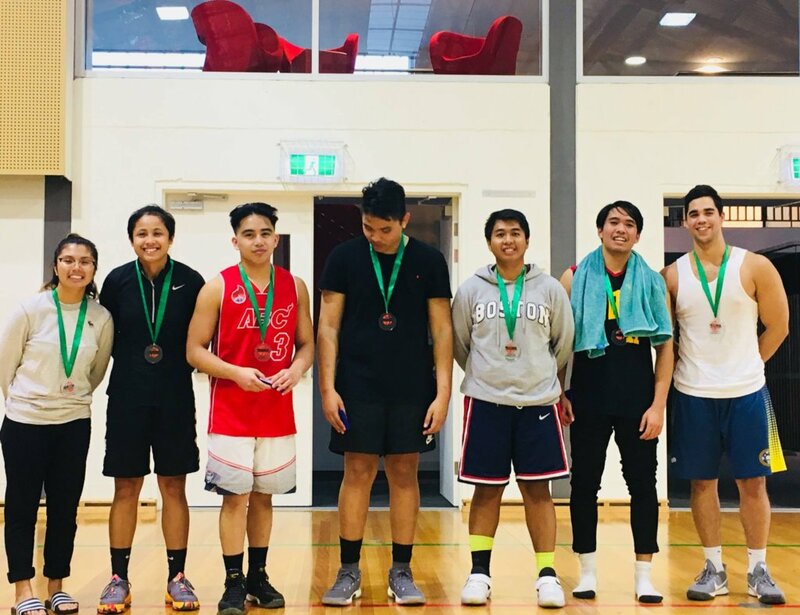 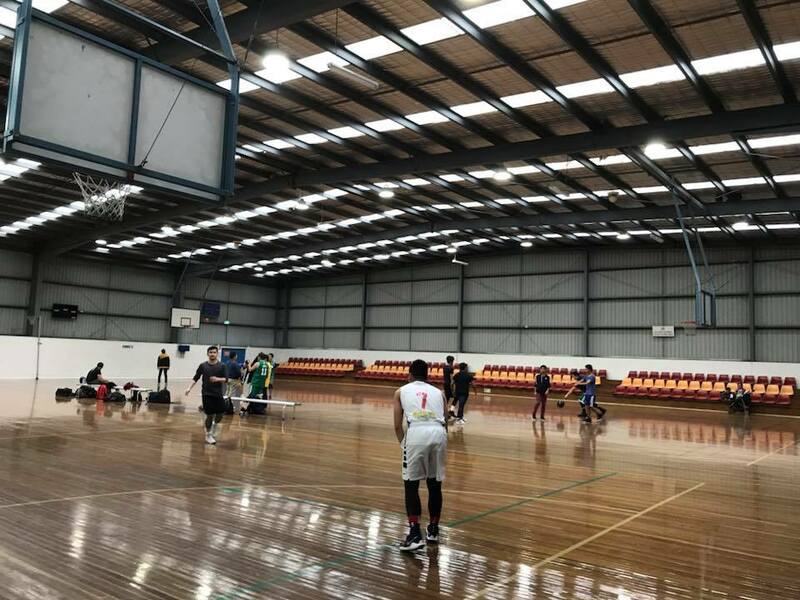 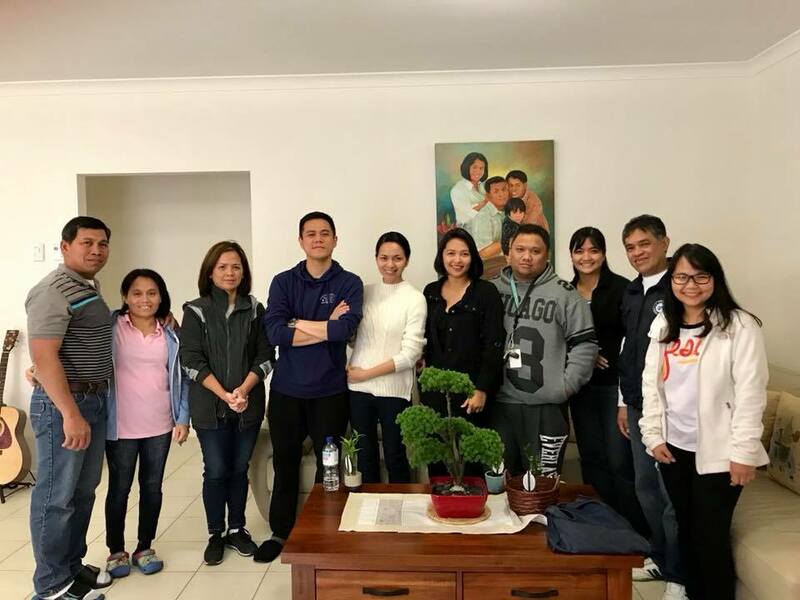 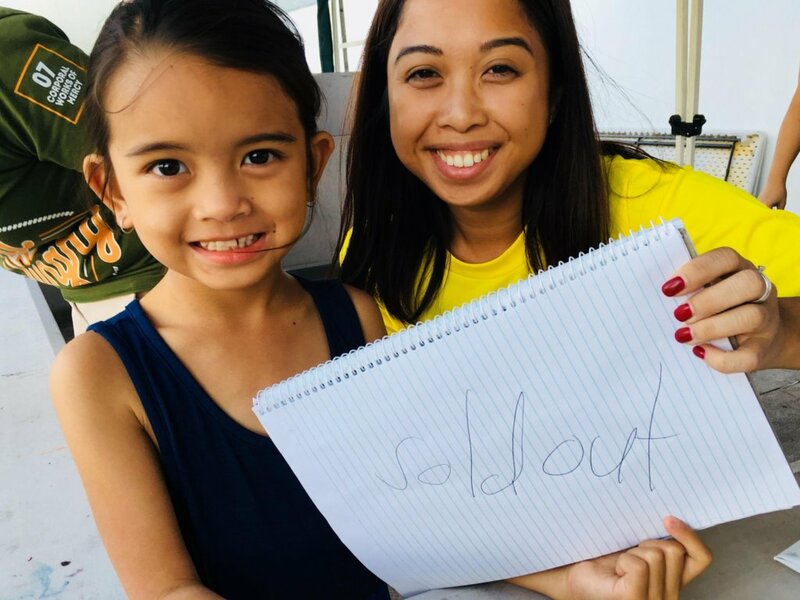 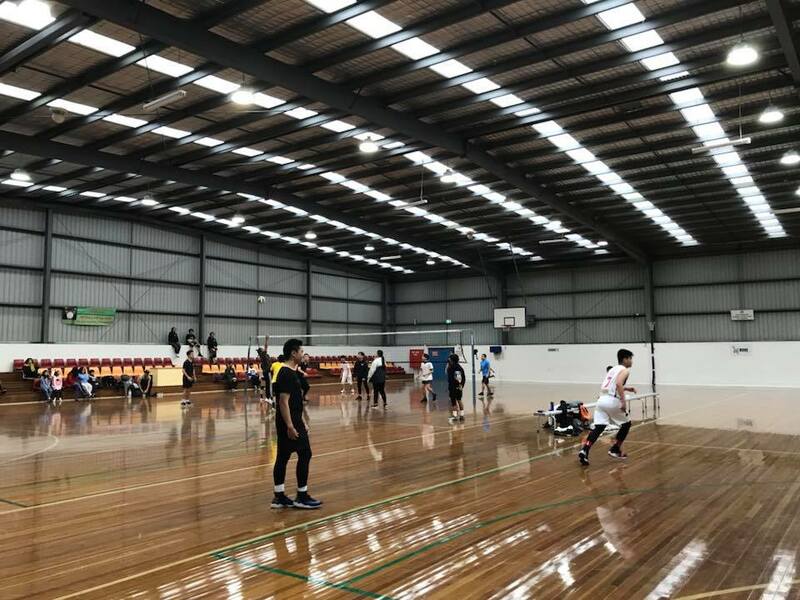 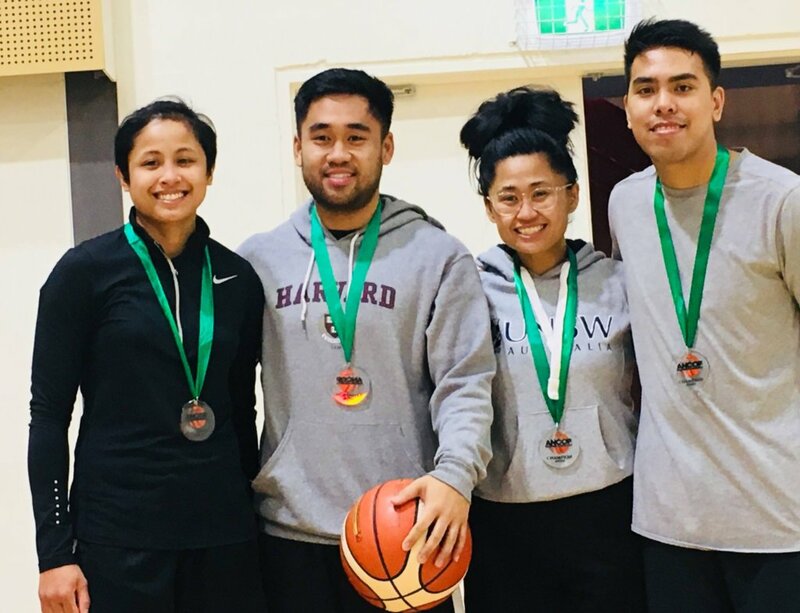 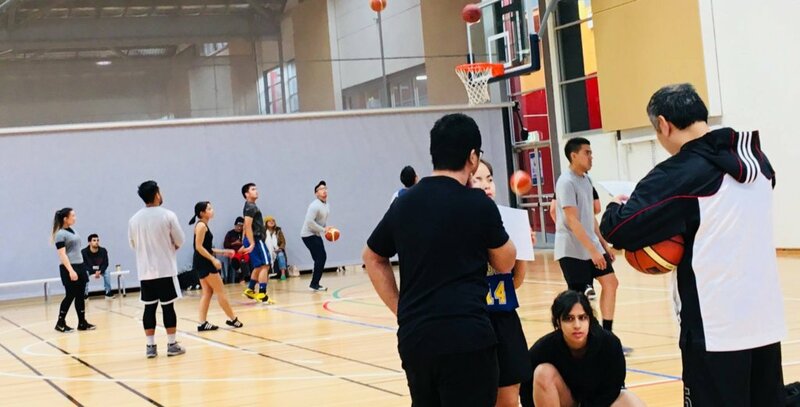 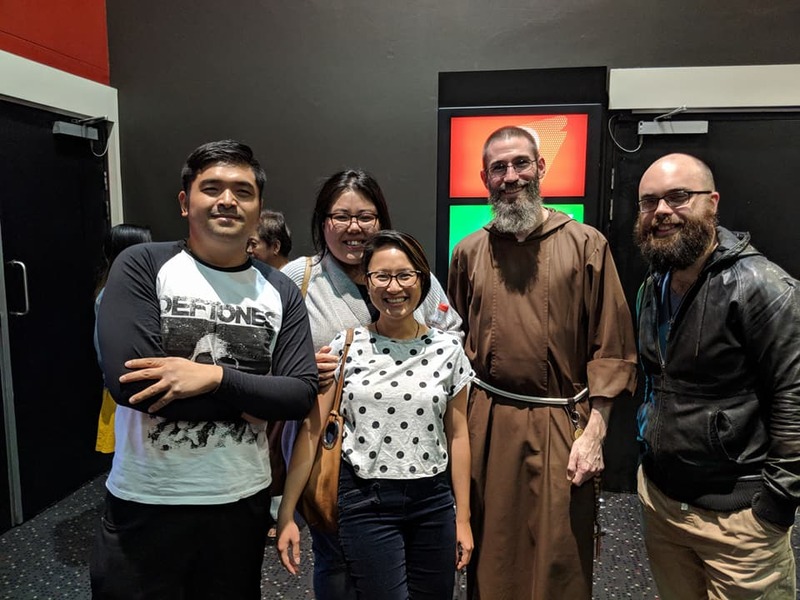 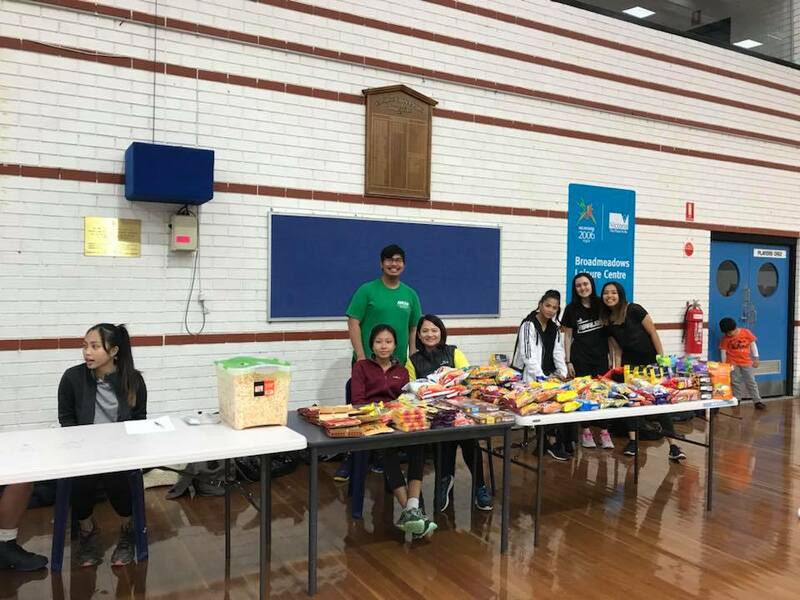 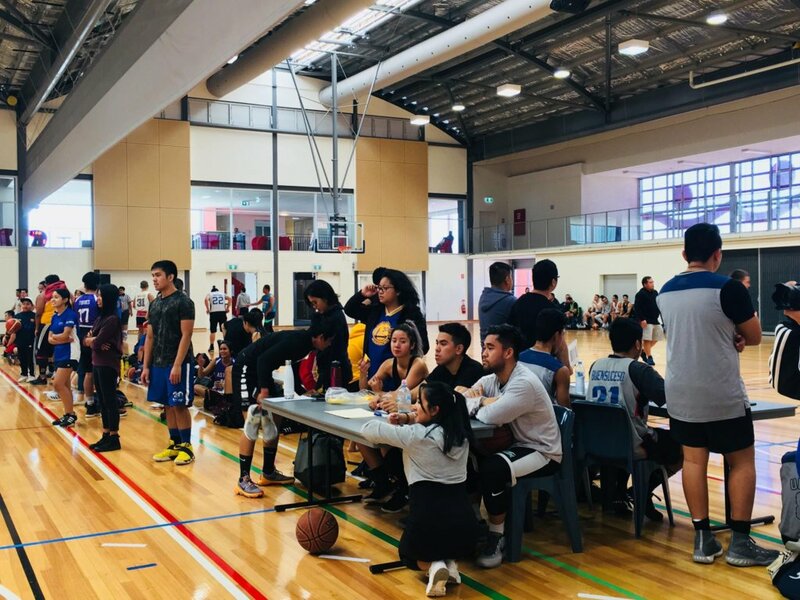 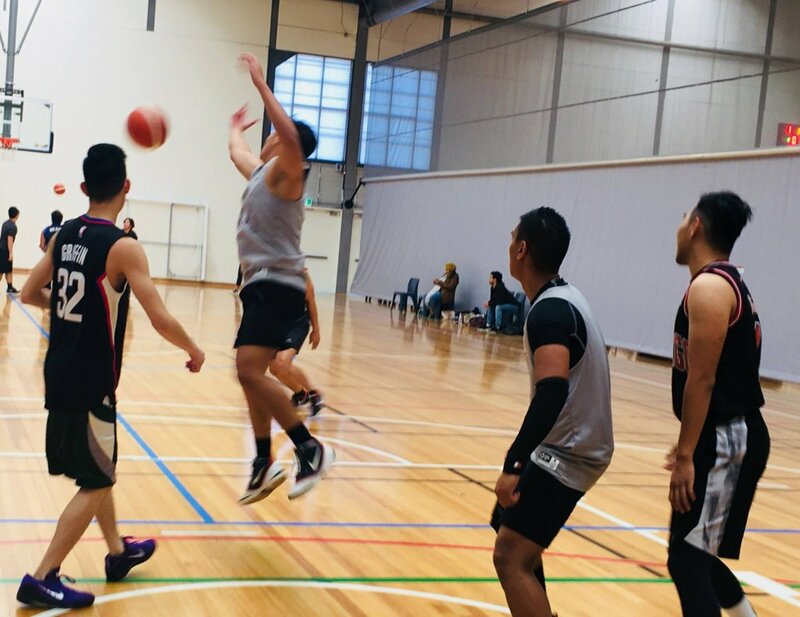 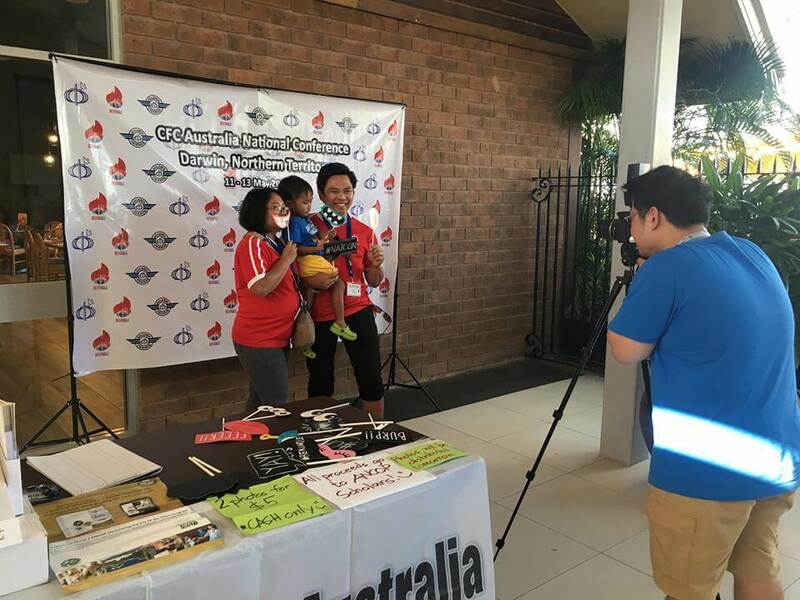 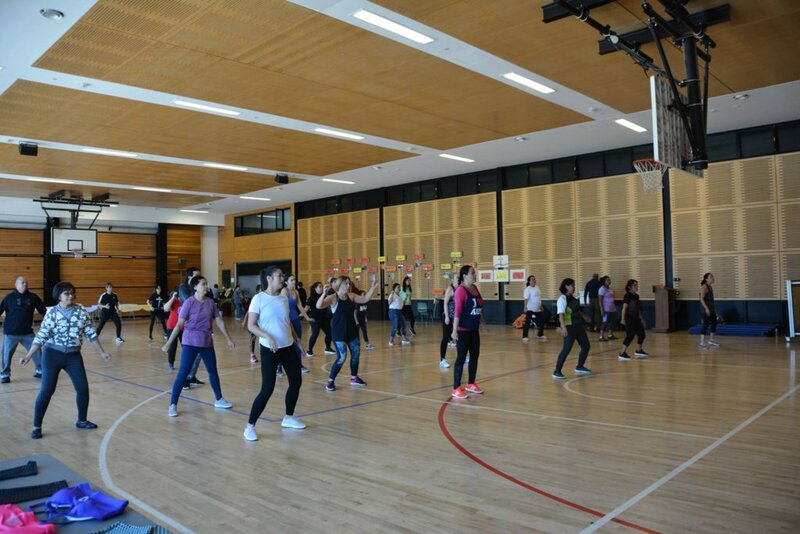 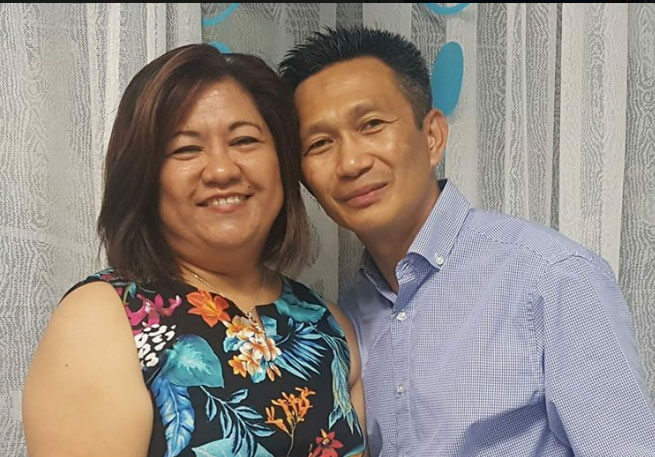 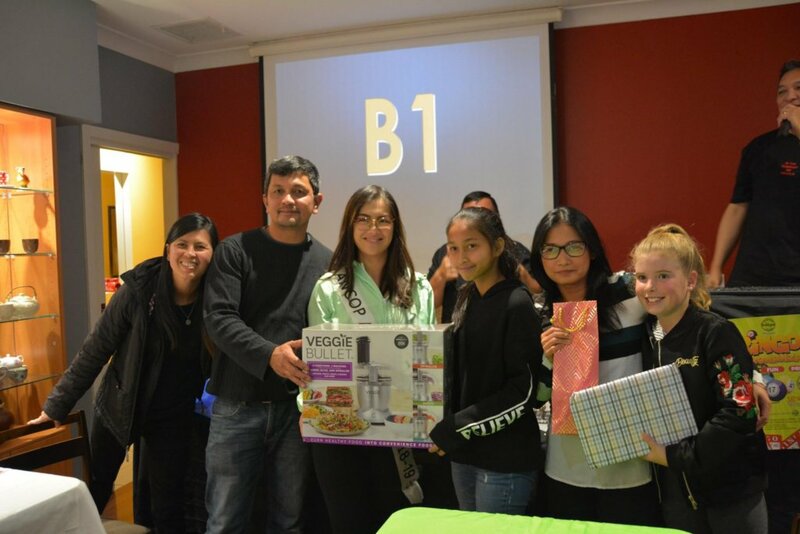 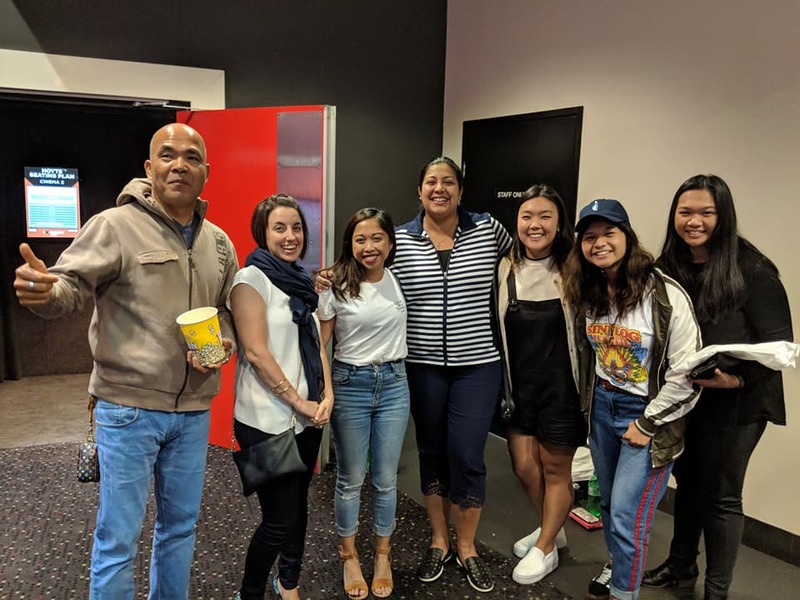 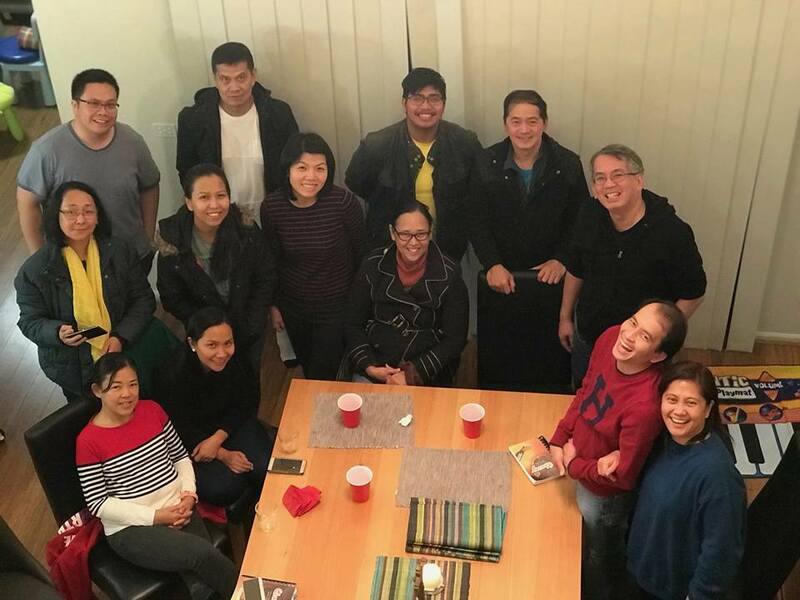 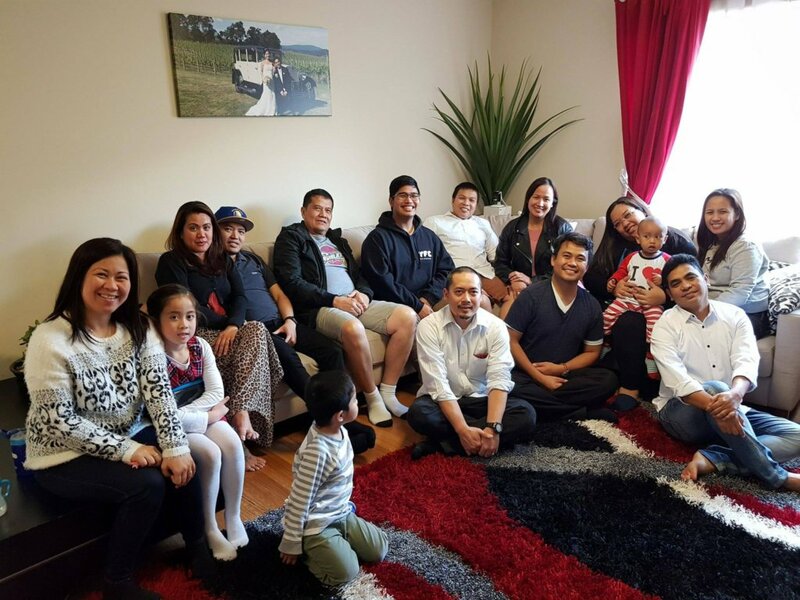 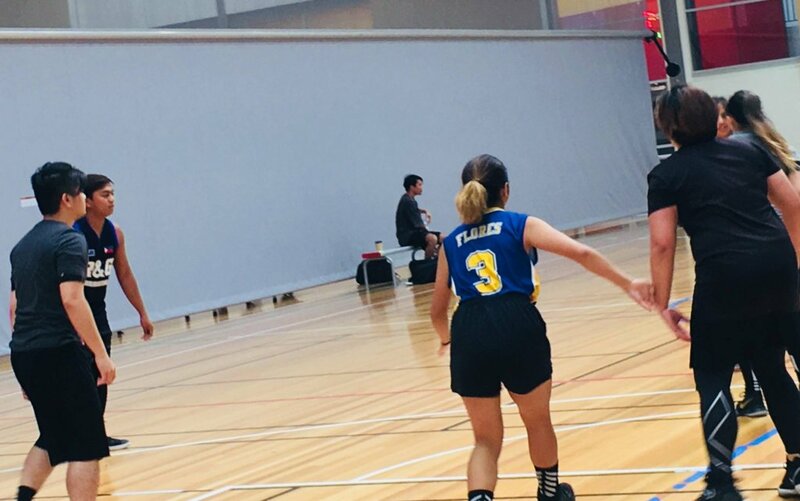 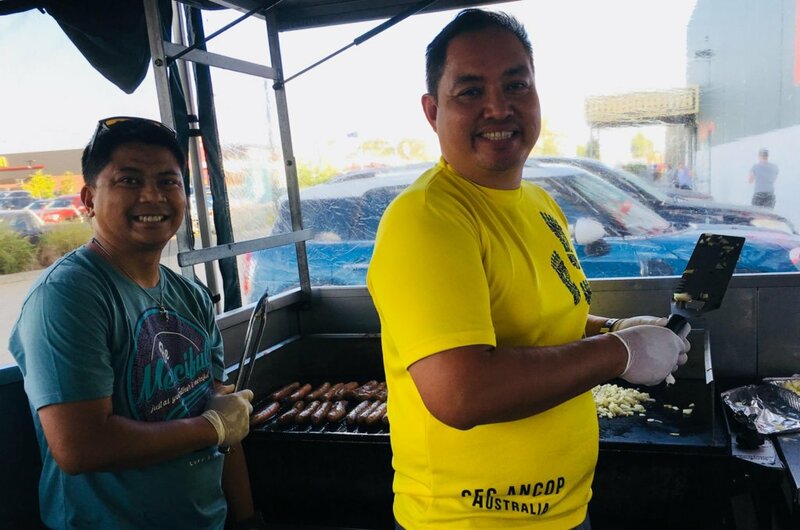 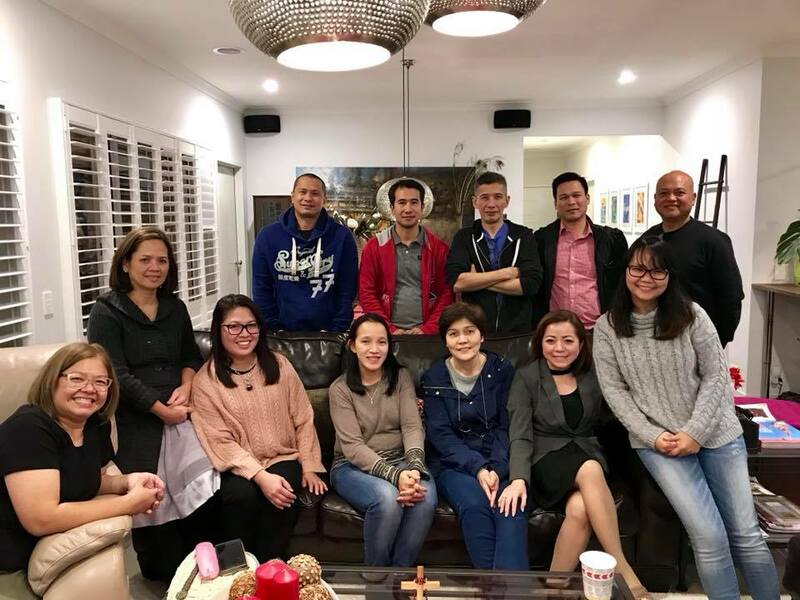 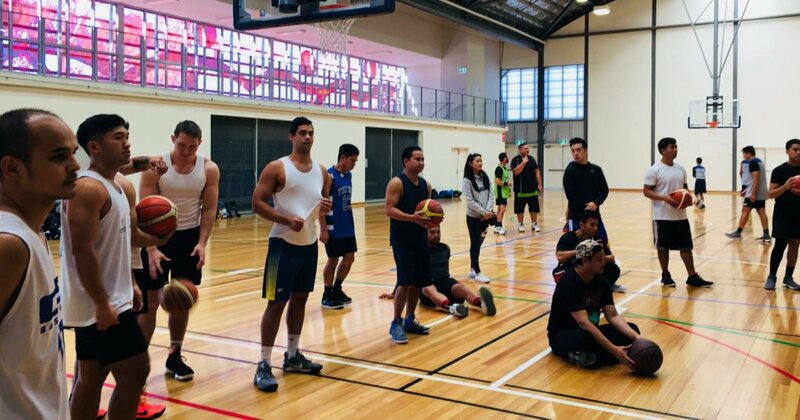 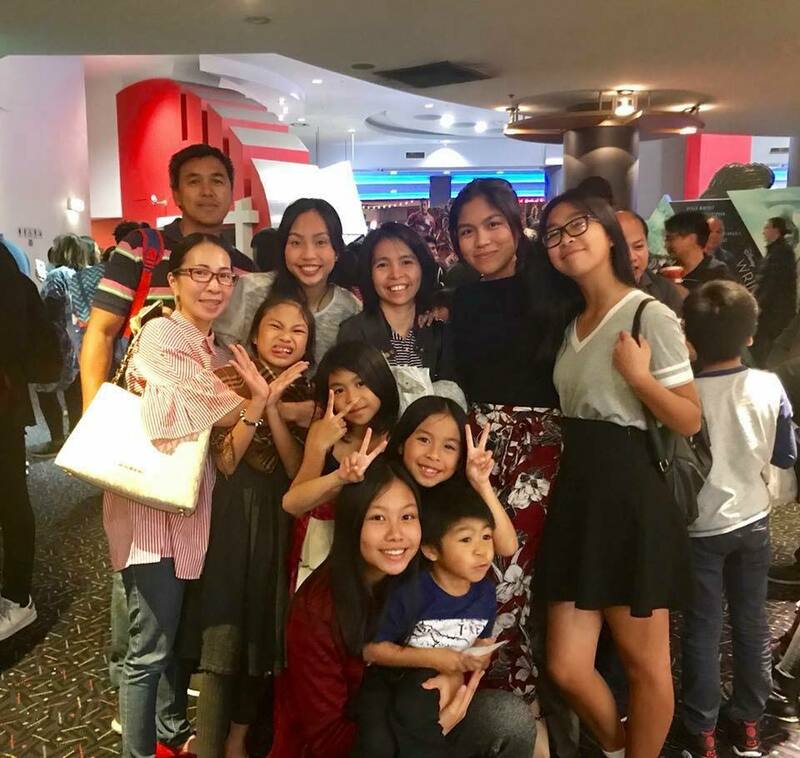 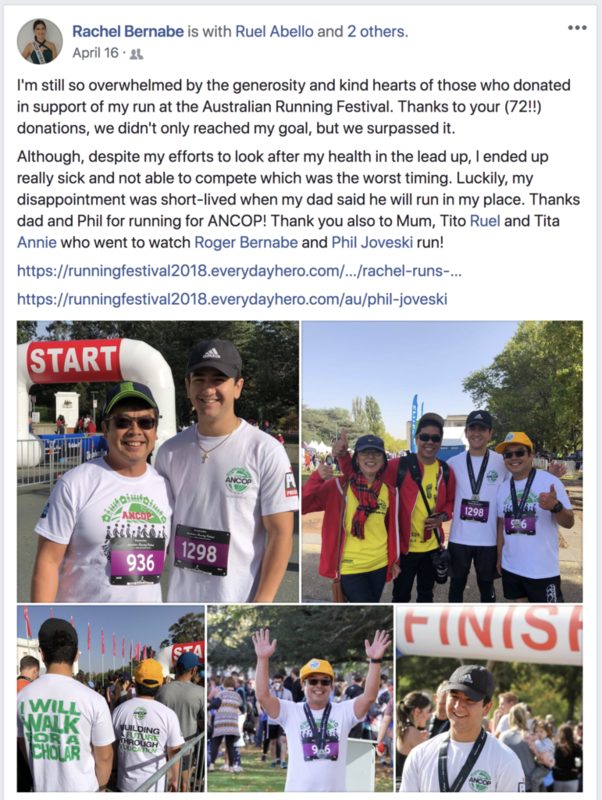 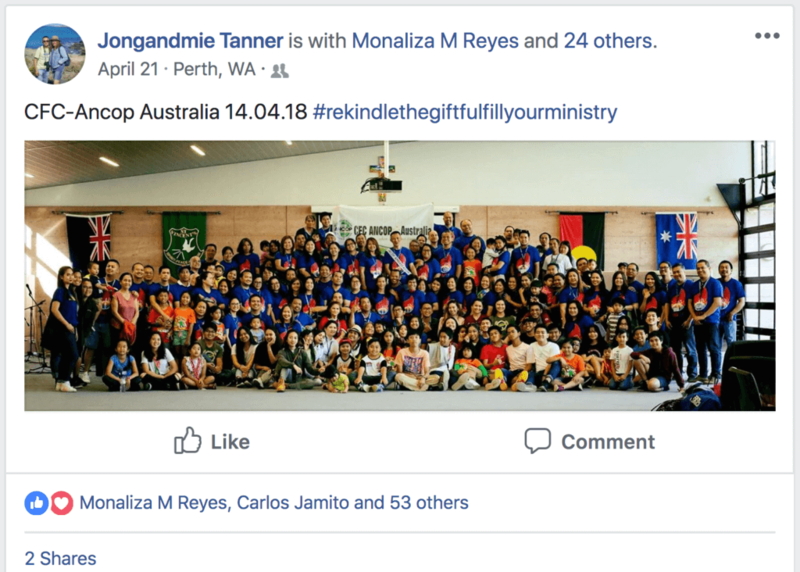 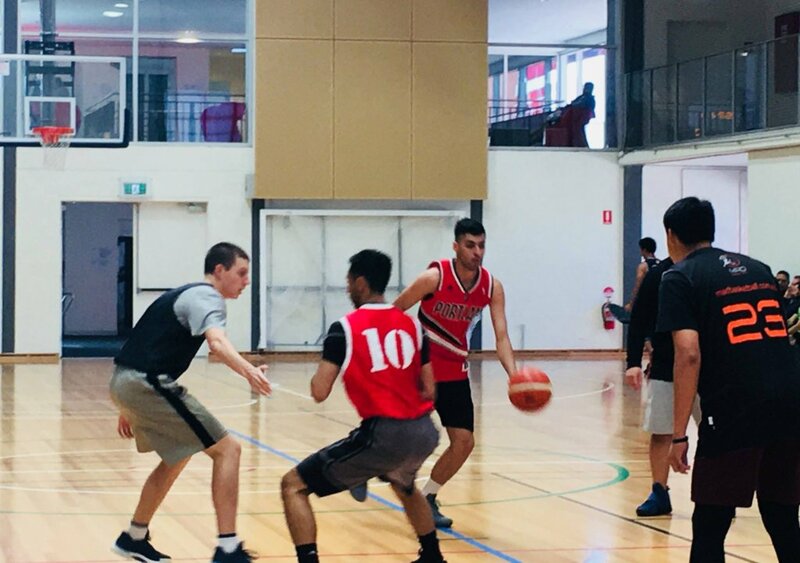 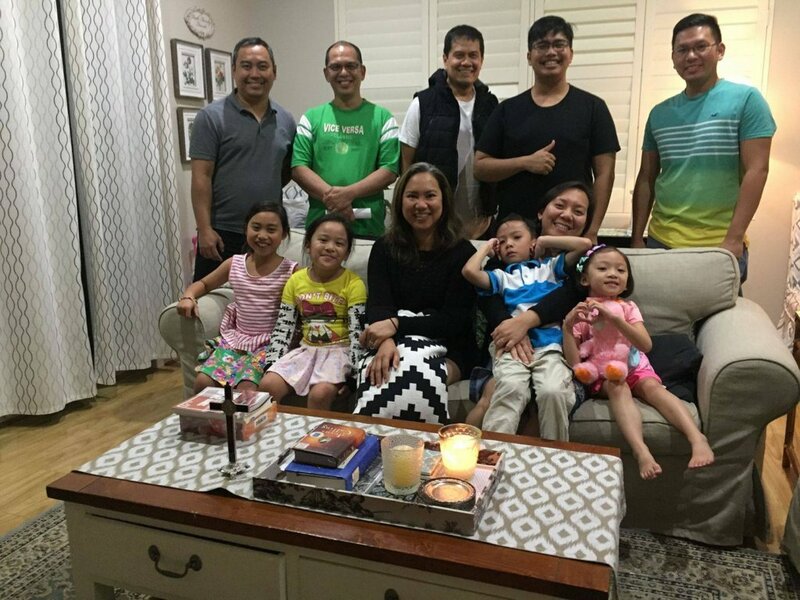 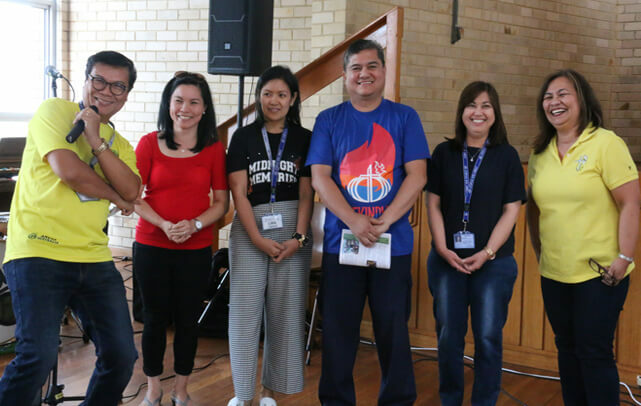 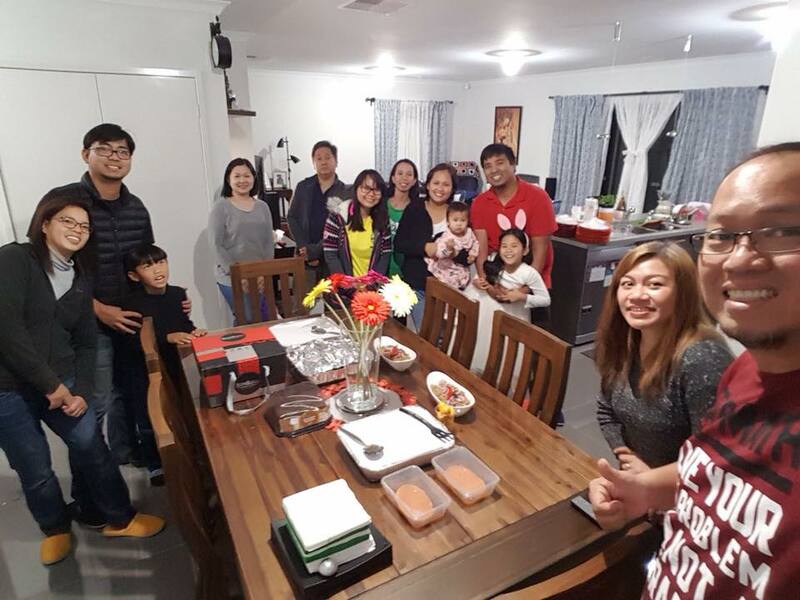 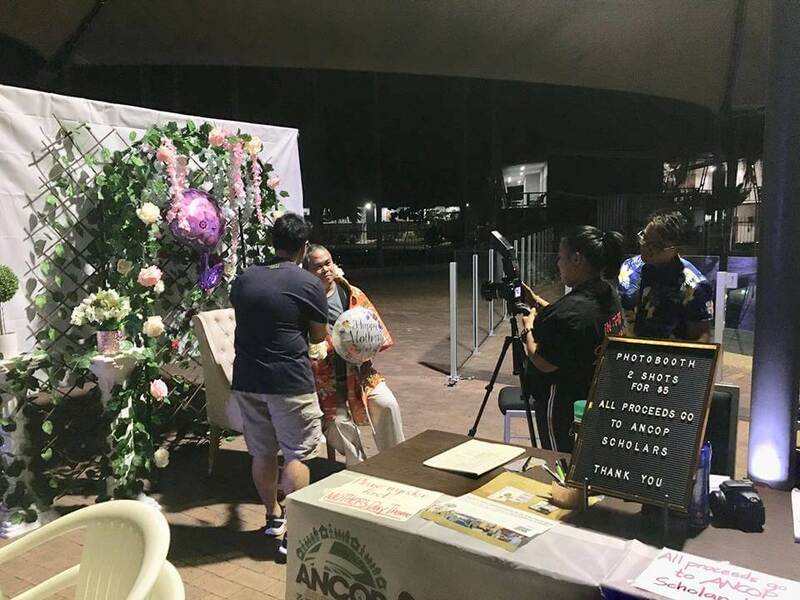 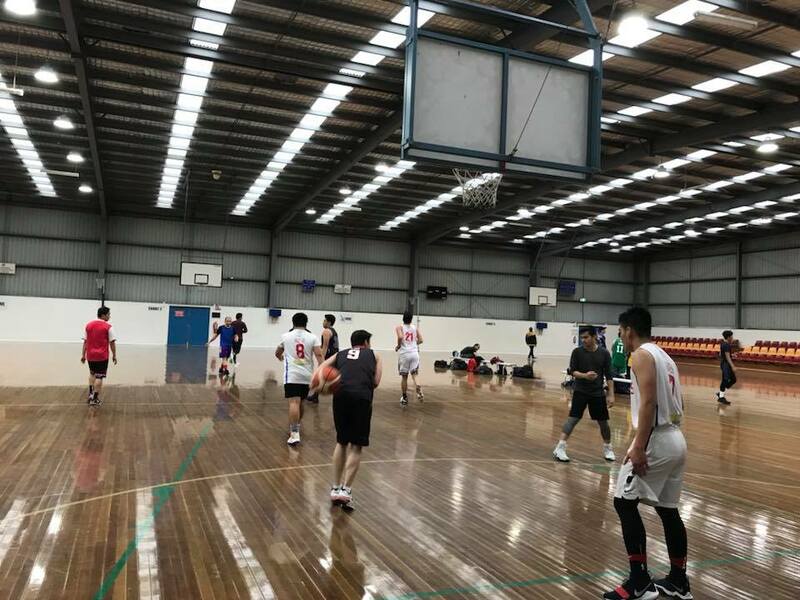 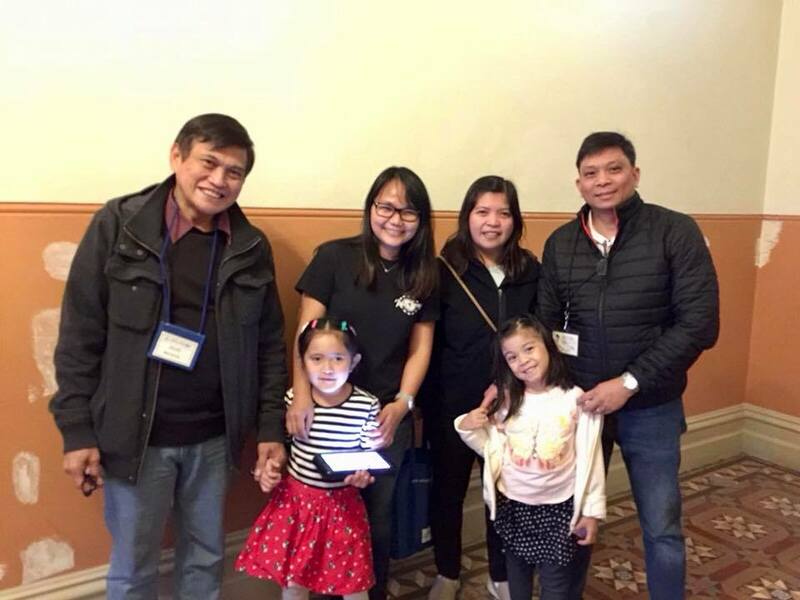 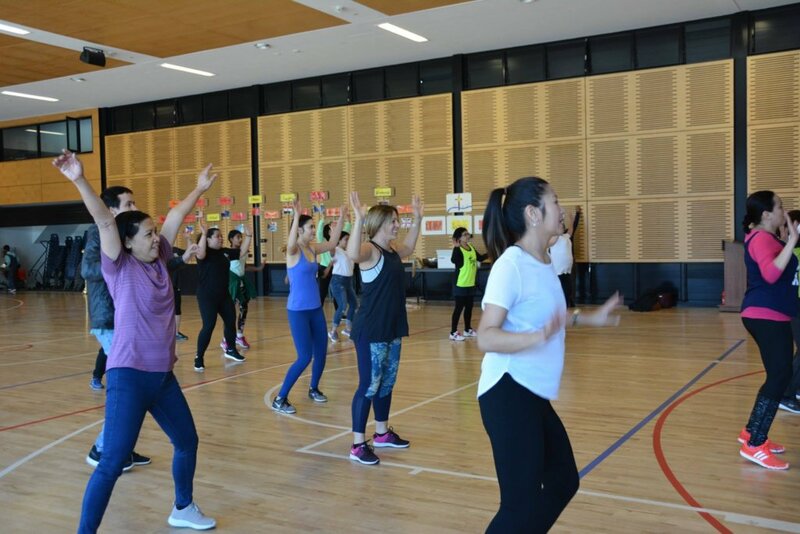 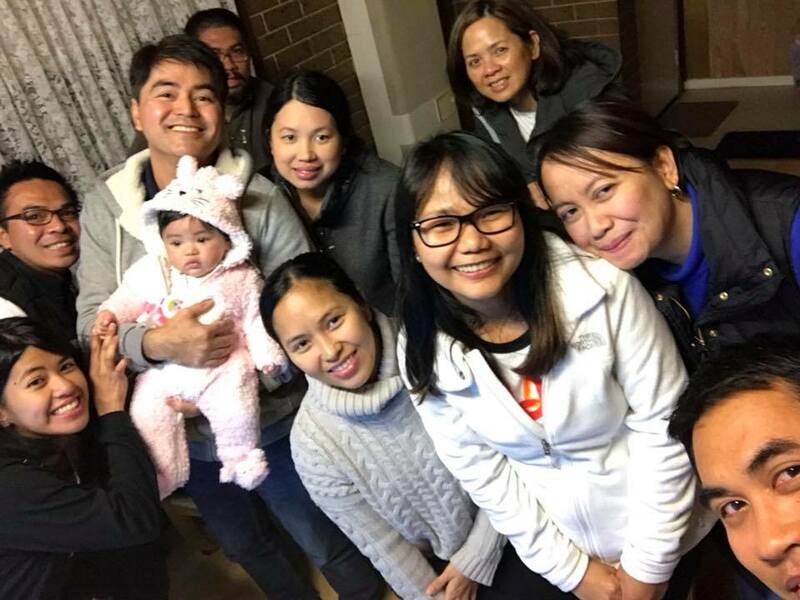 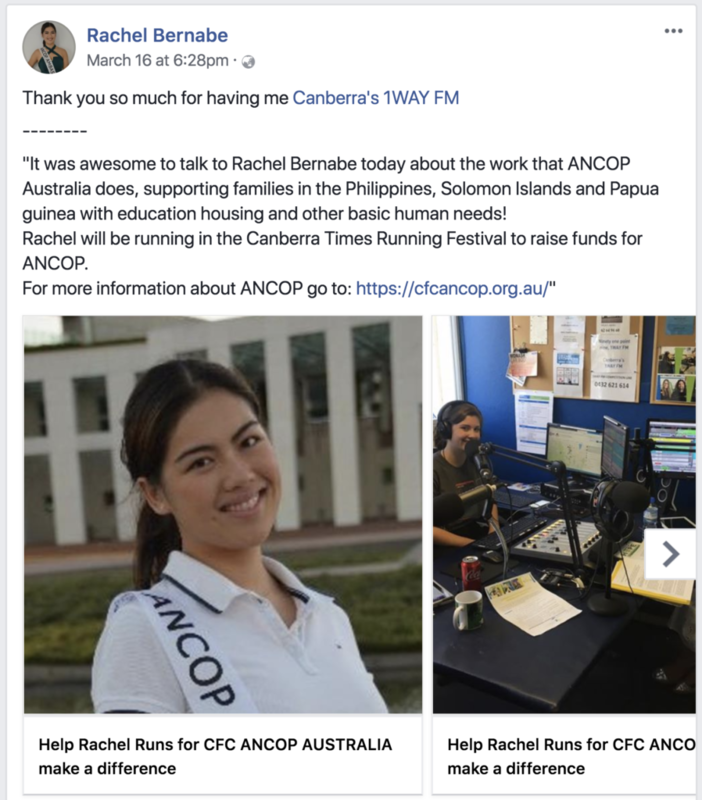 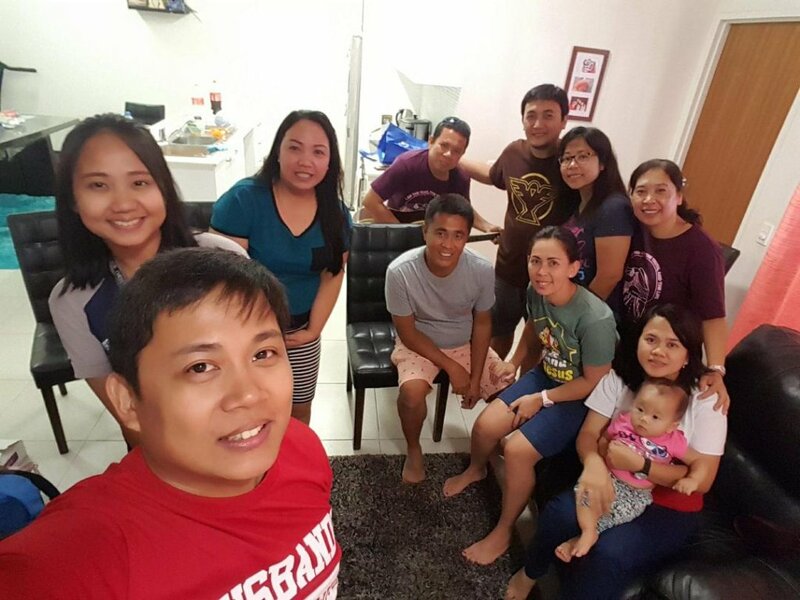 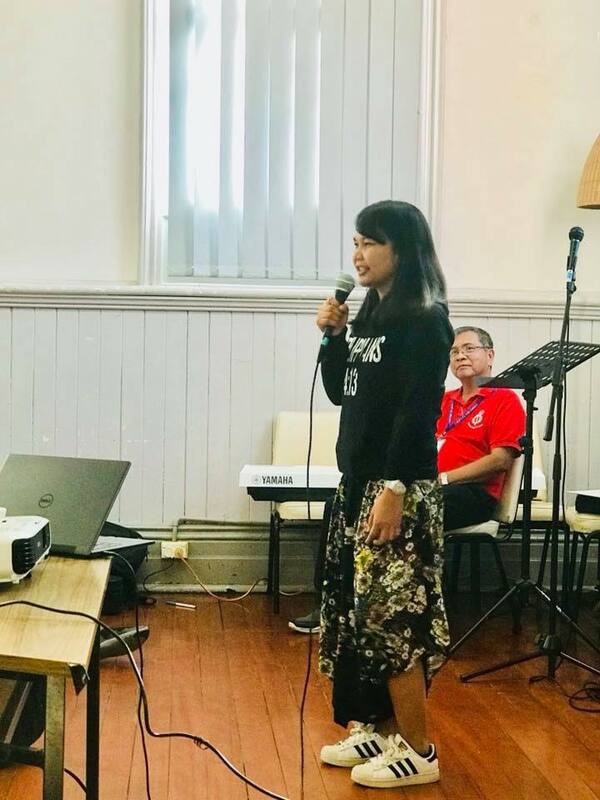 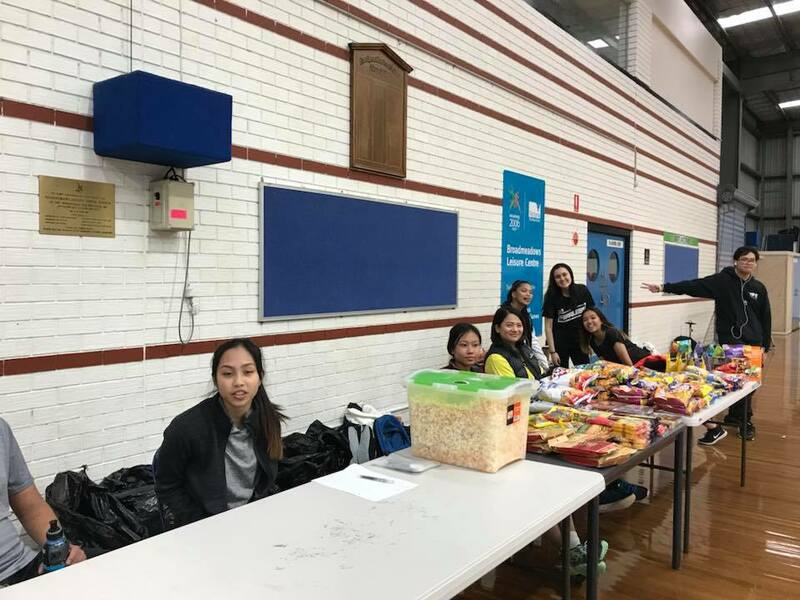 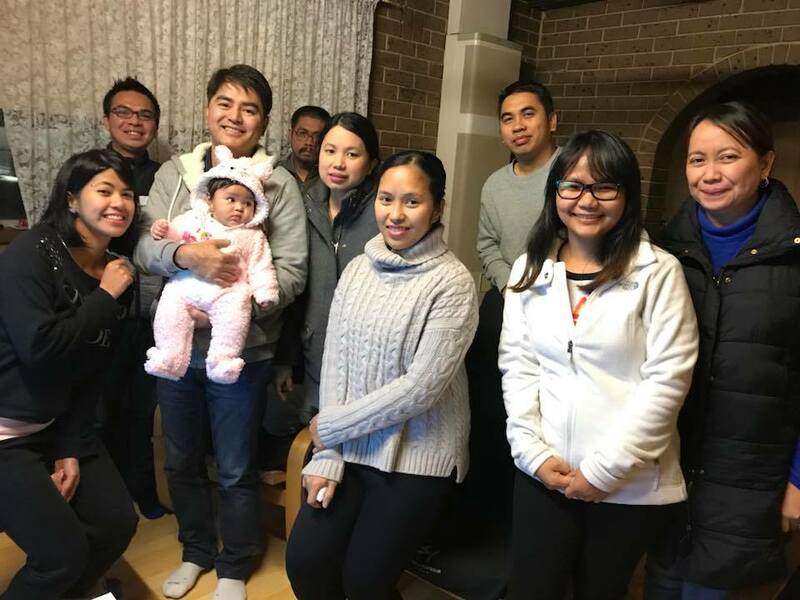 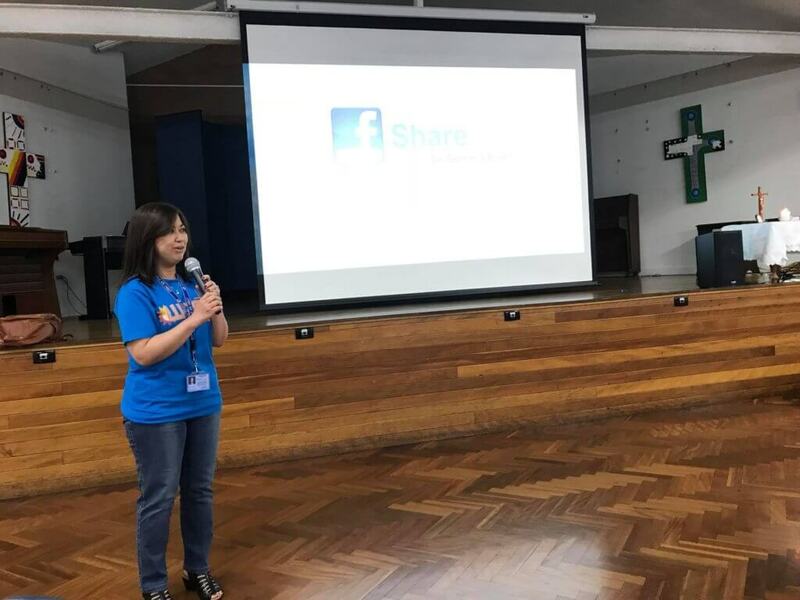 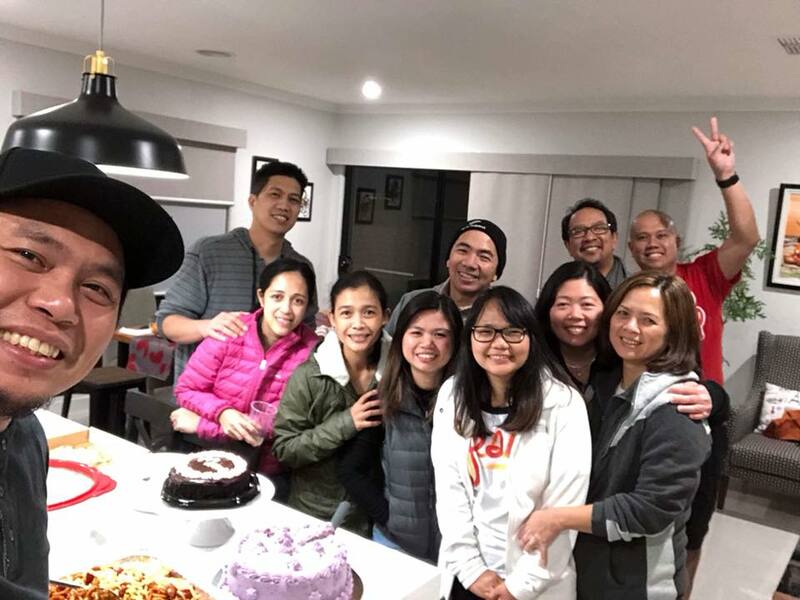 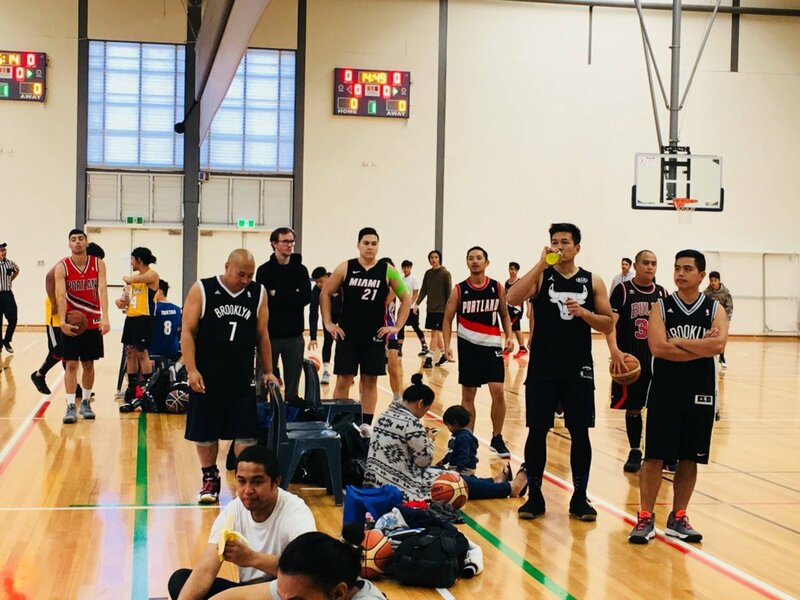 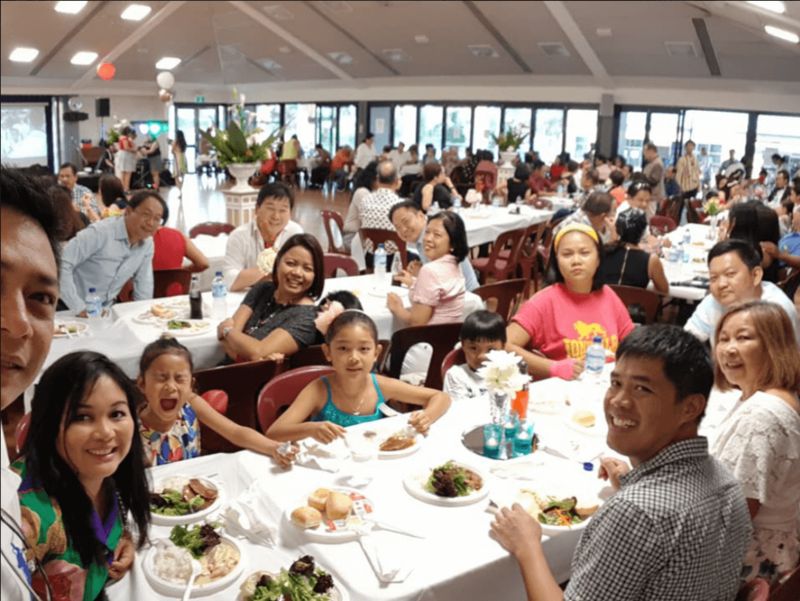 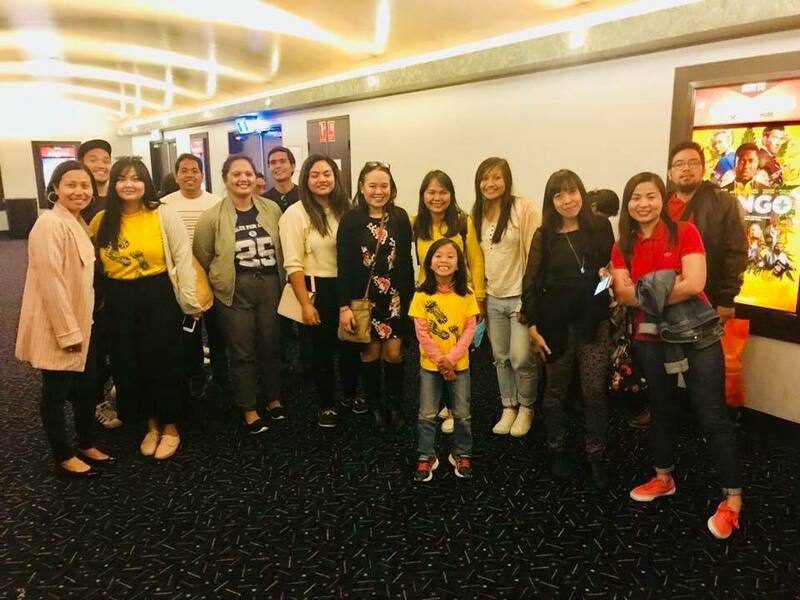 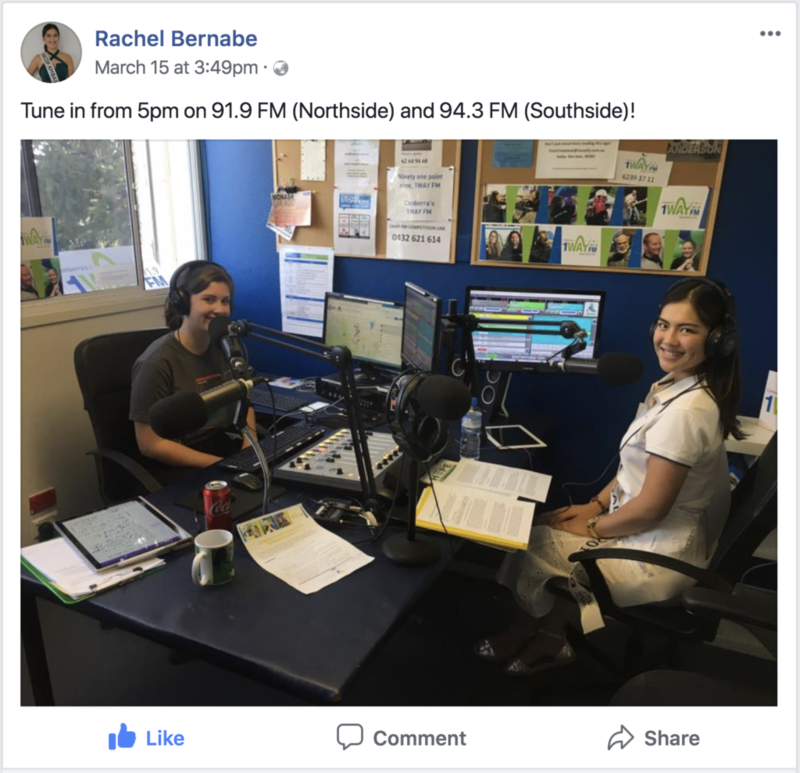 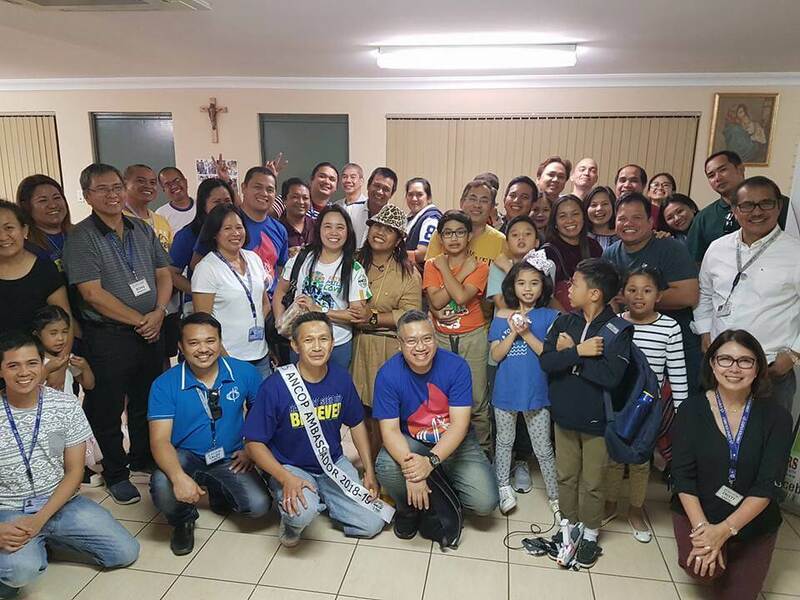 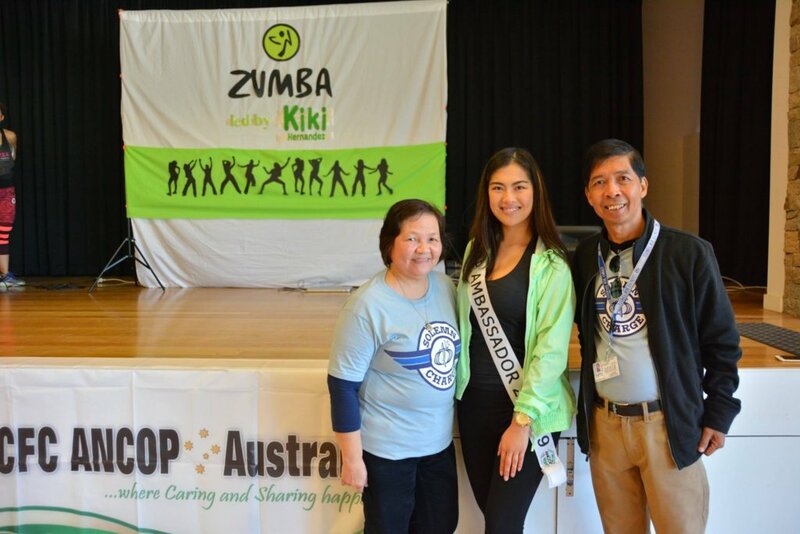 It did not take me long to appreciate that there’s a level of joy, passion and devotion from the people living in Australia – the Filipino community in particular - that’s different from other places I’ve been to around the world. 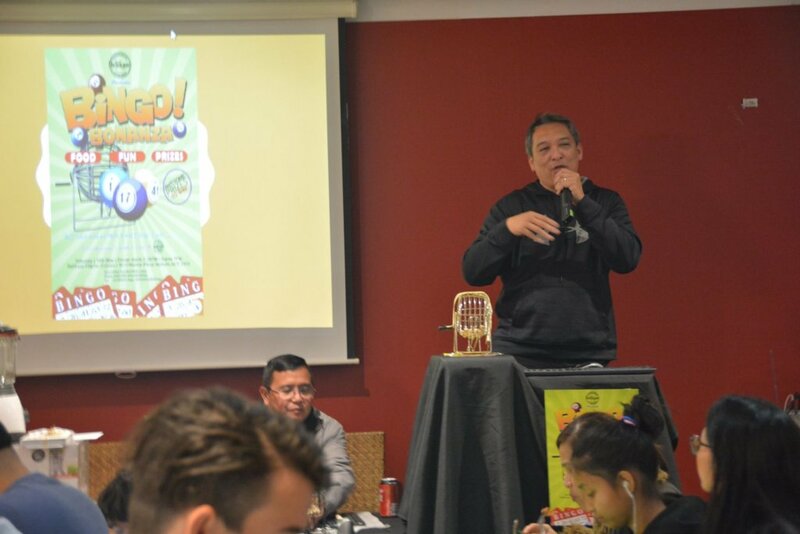 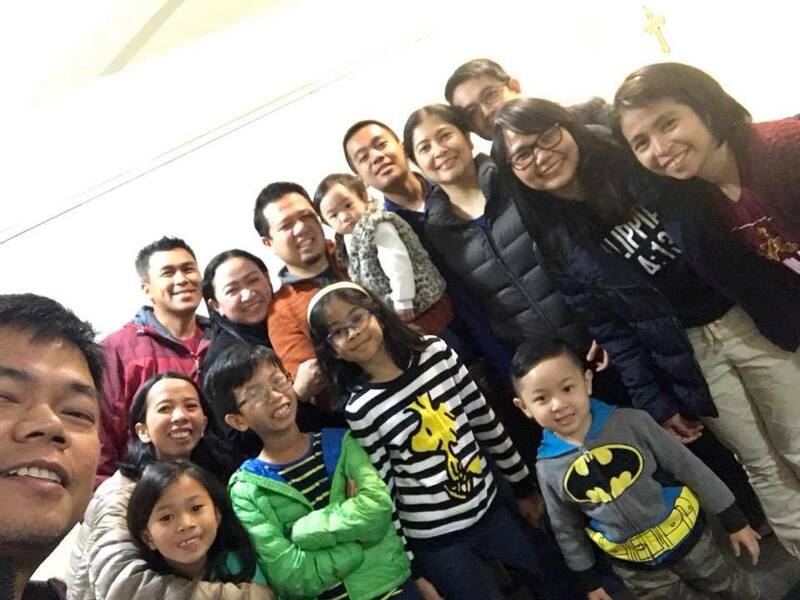 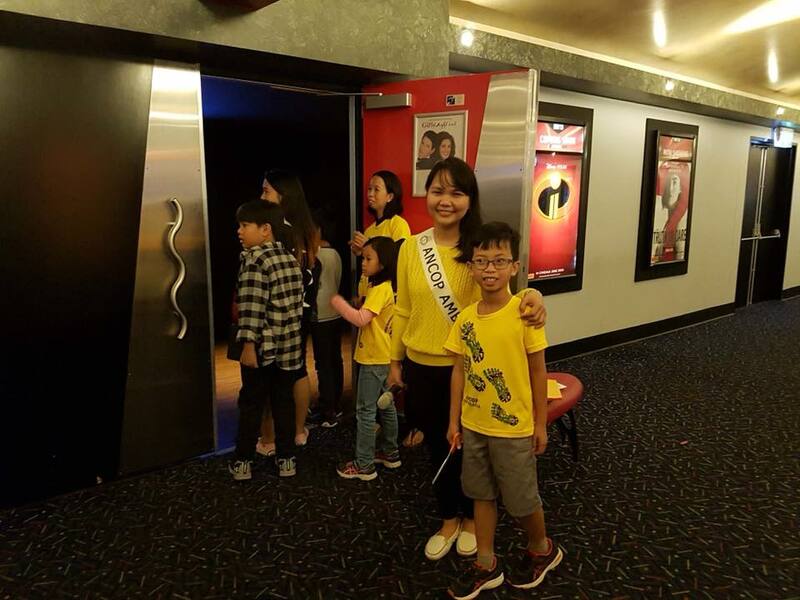 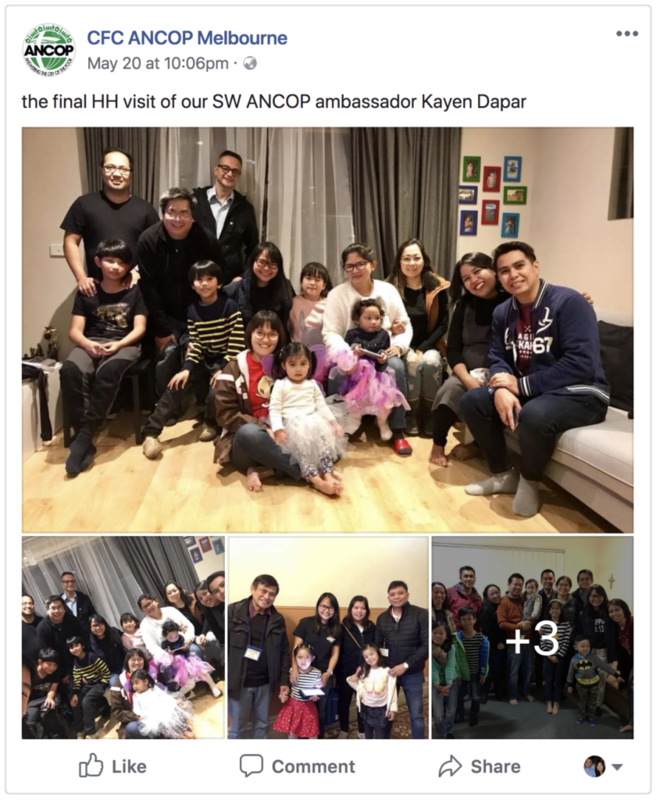 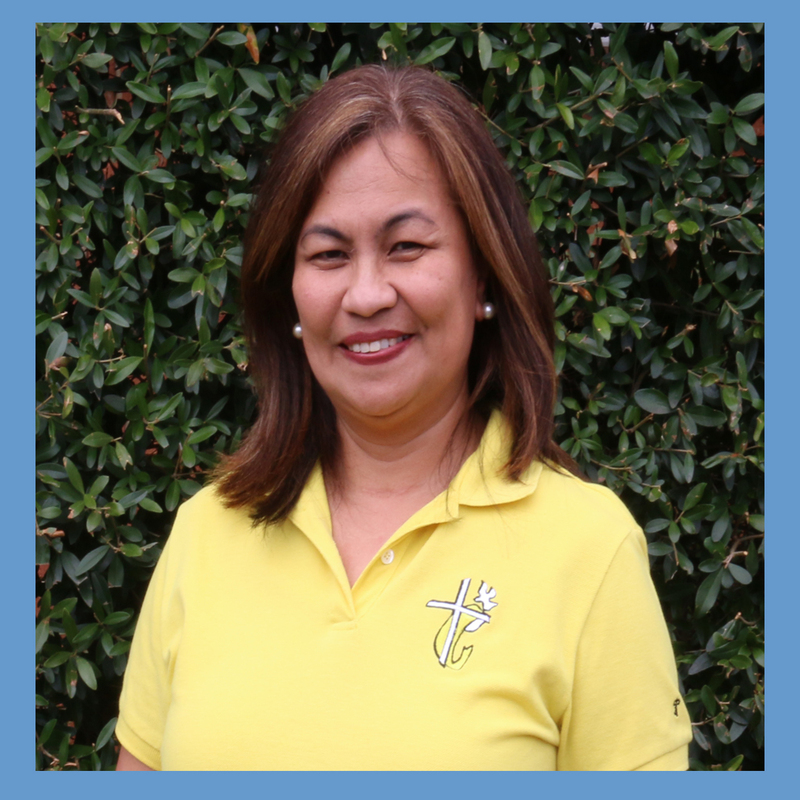 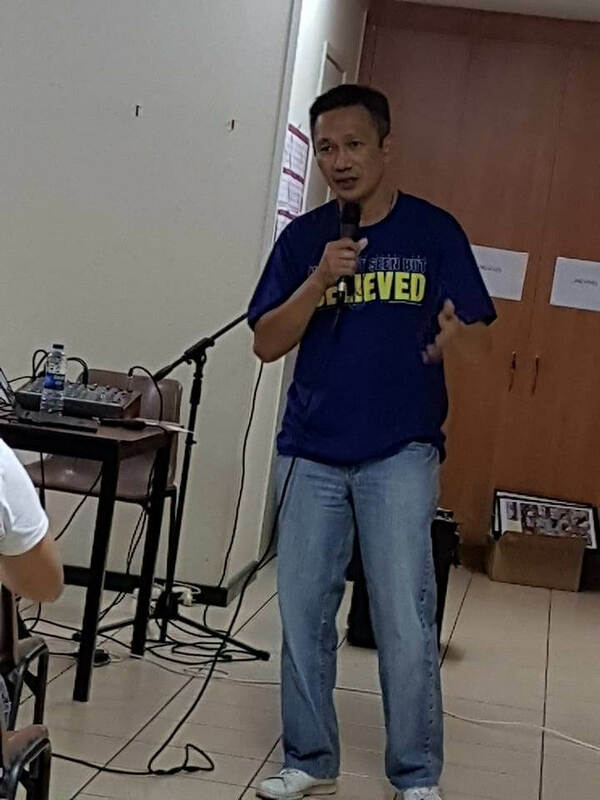 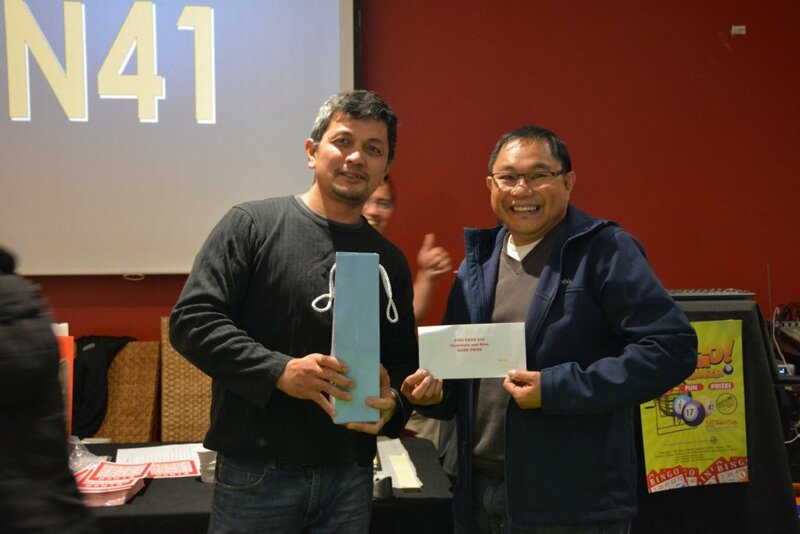 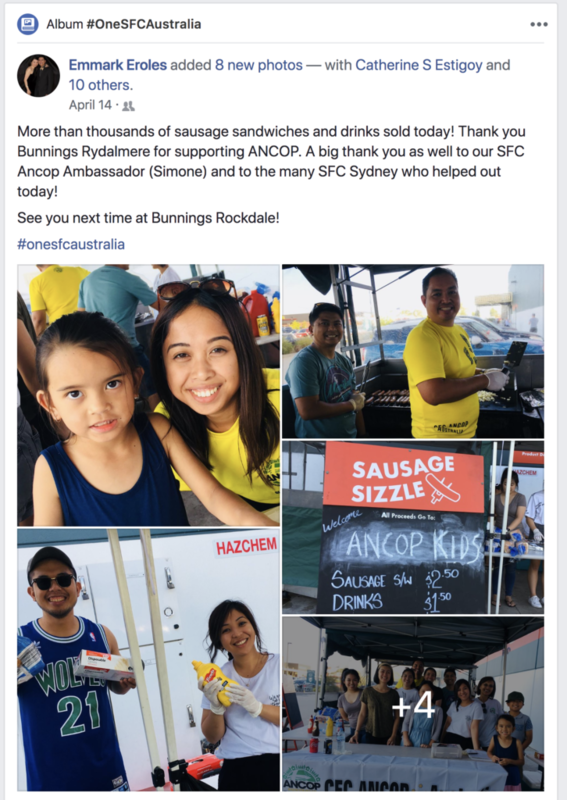 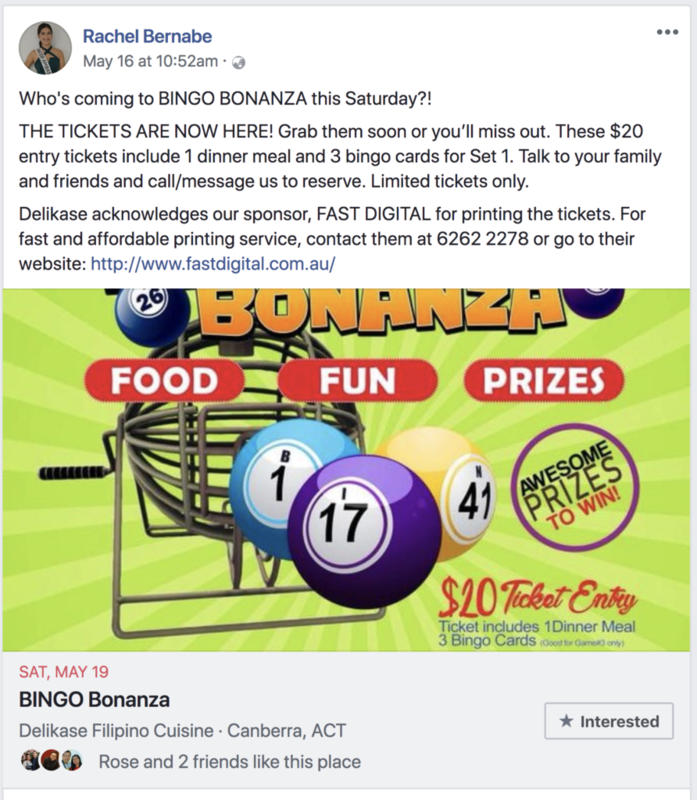 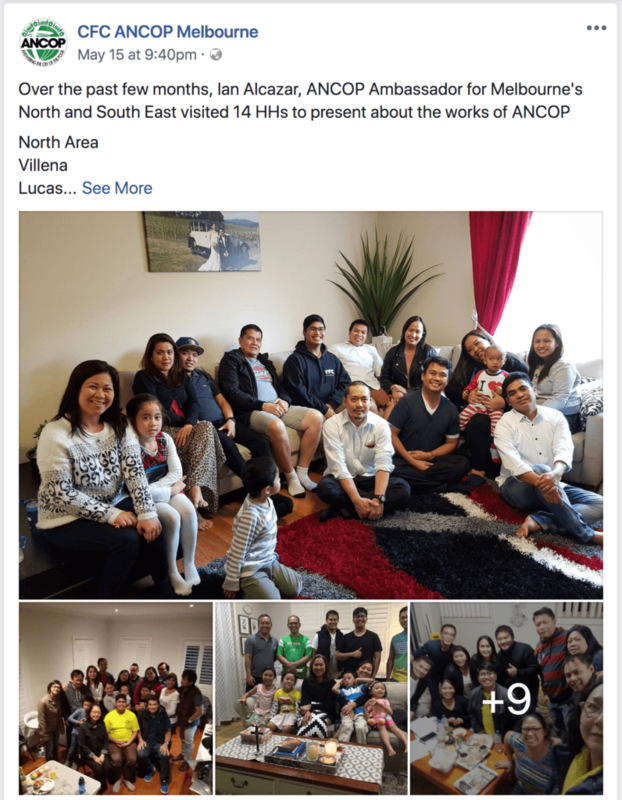 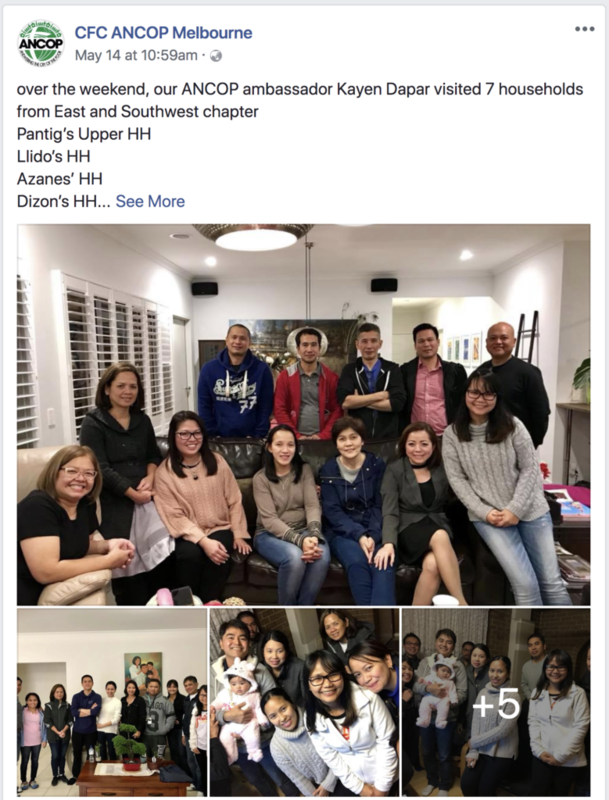 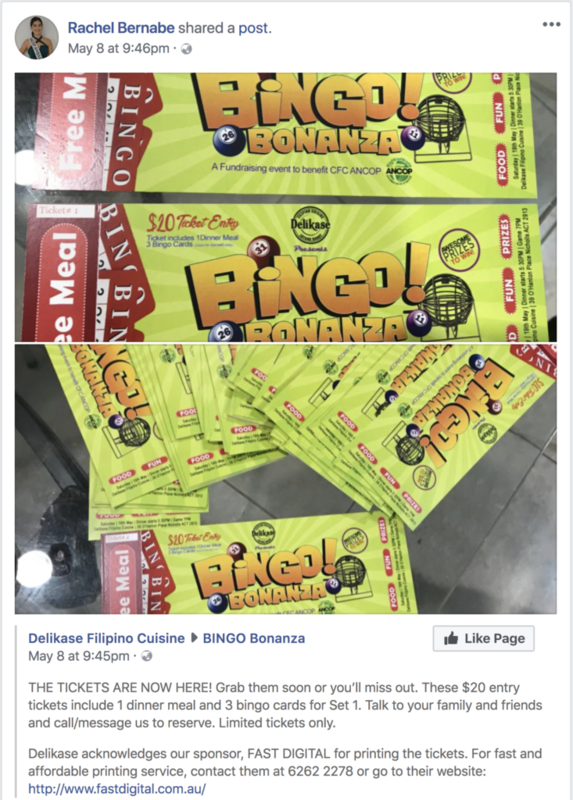 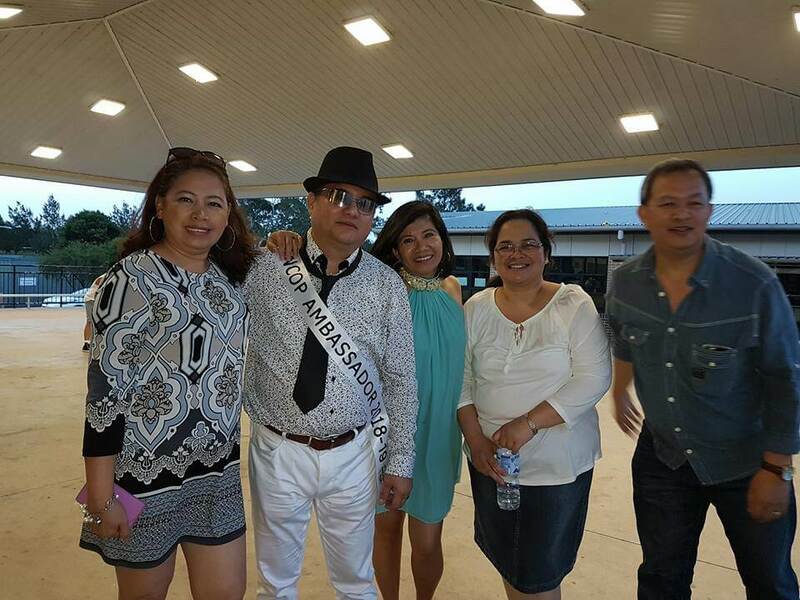 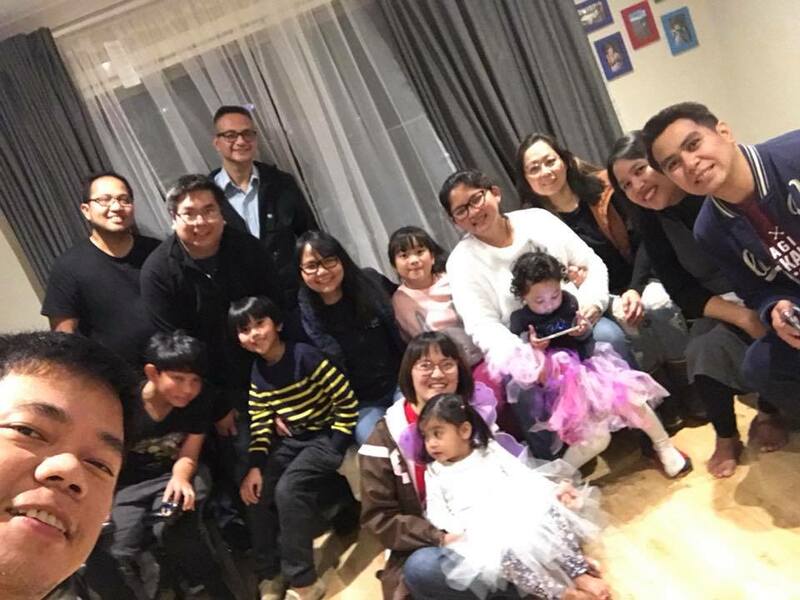 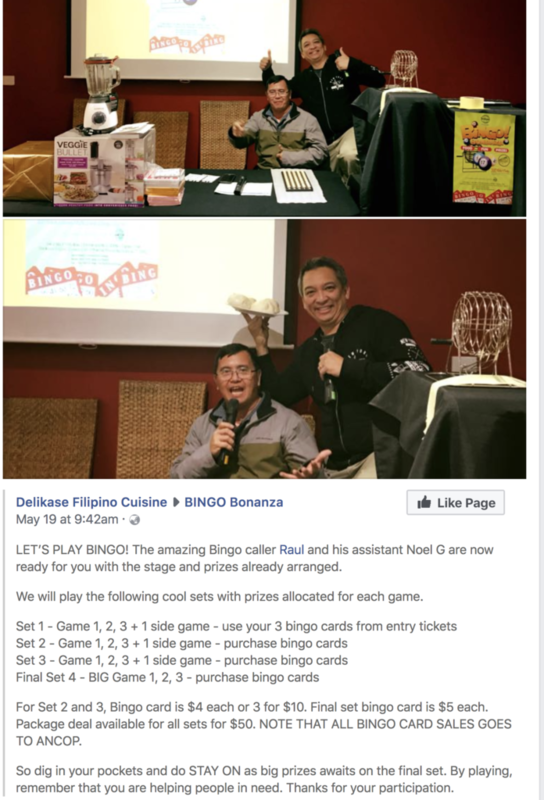 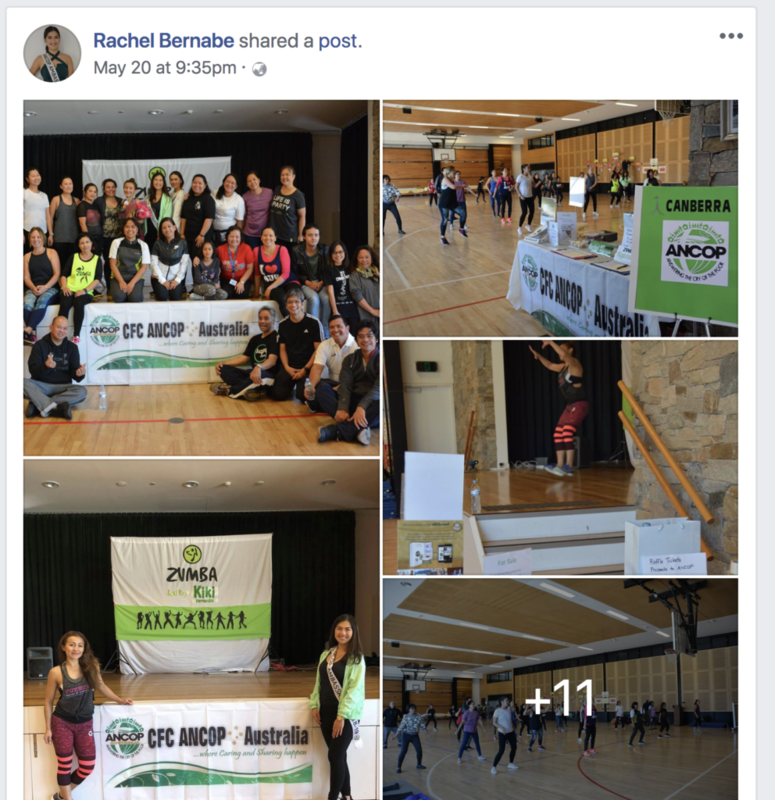 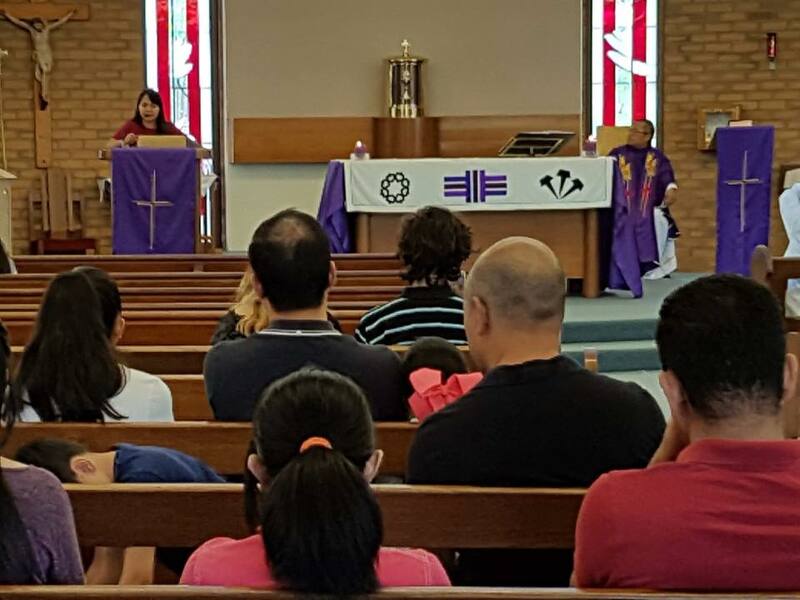 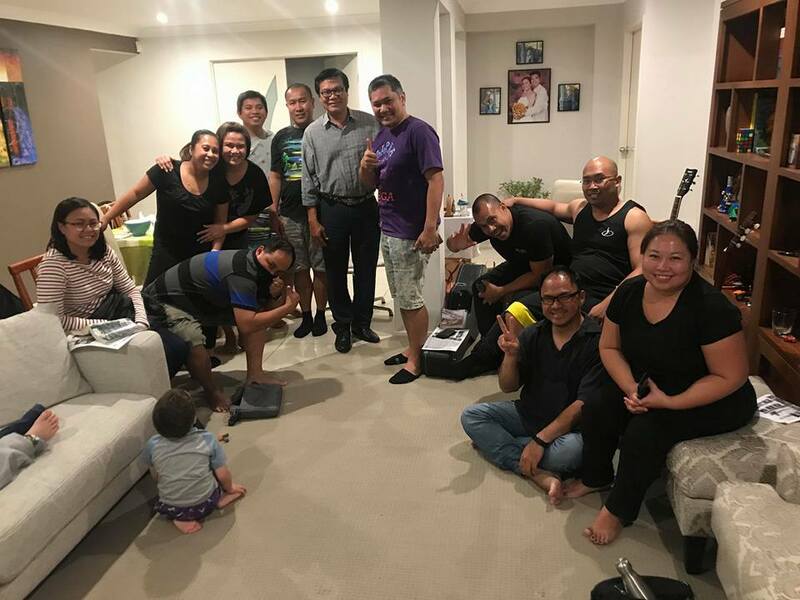 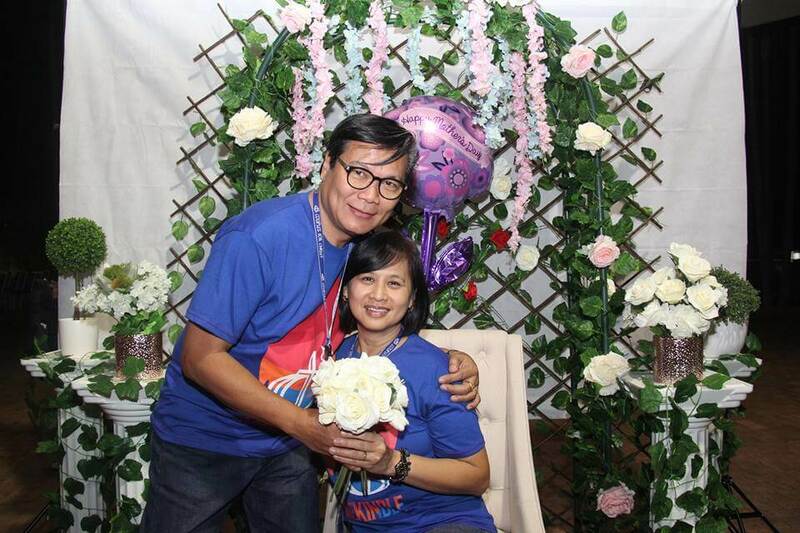 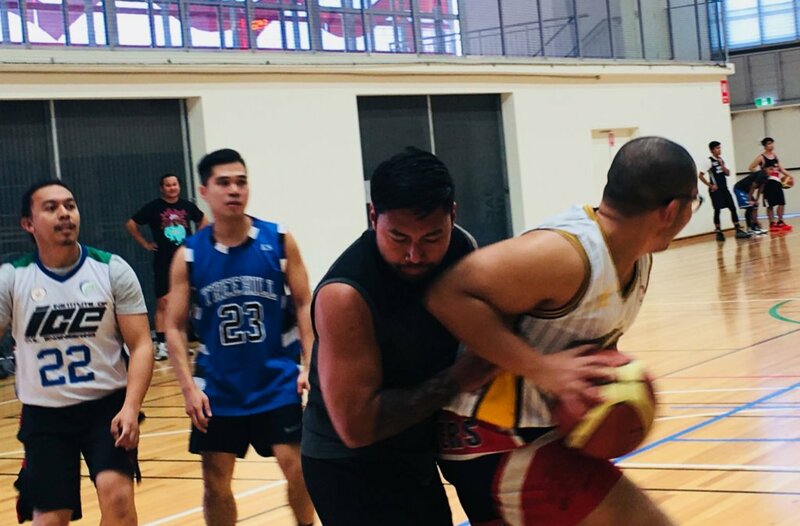 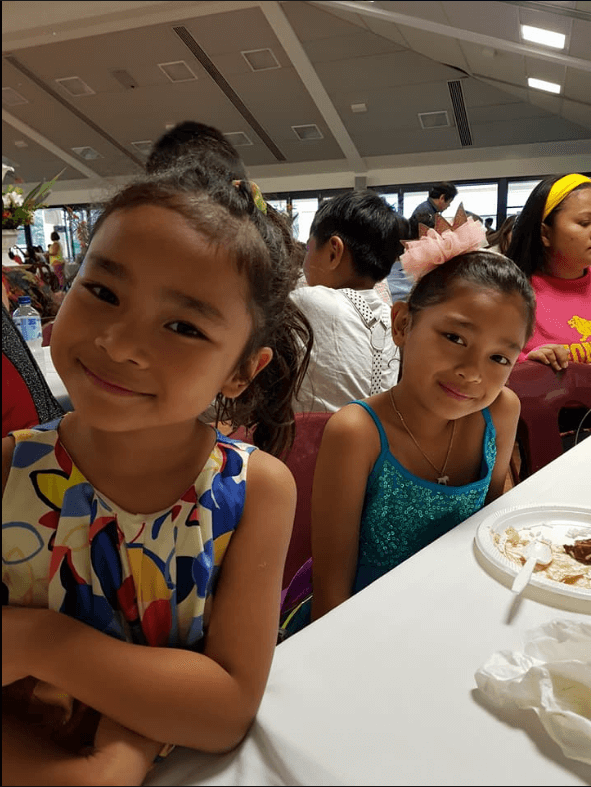 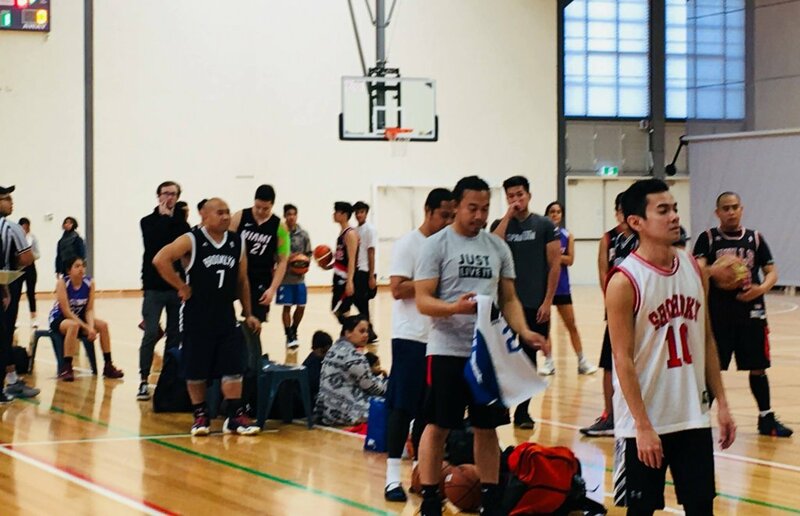 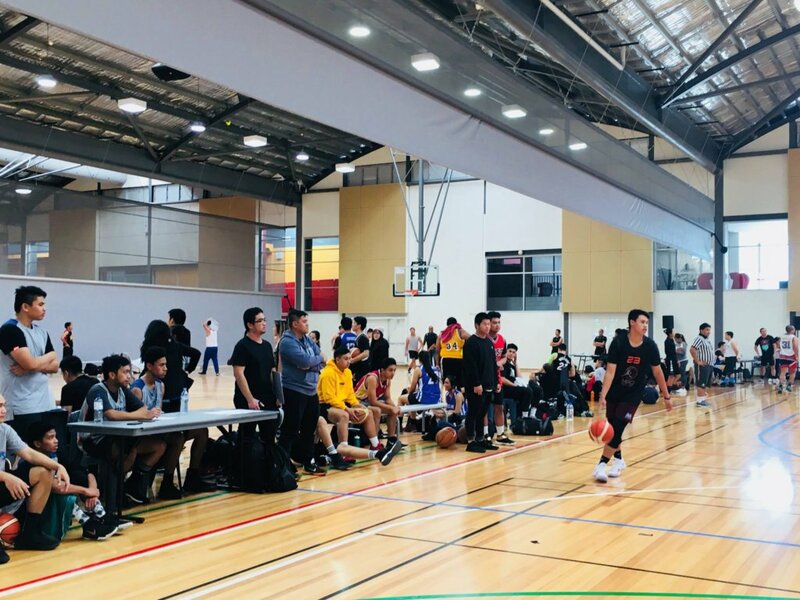 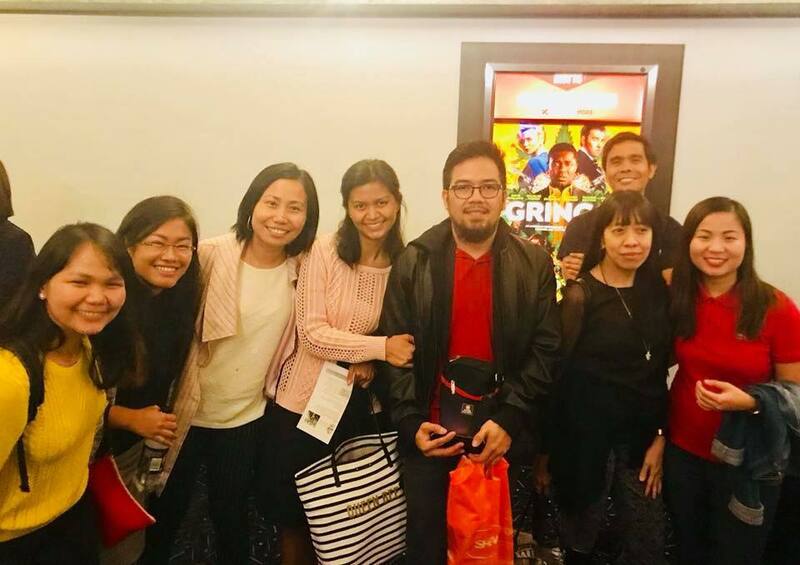 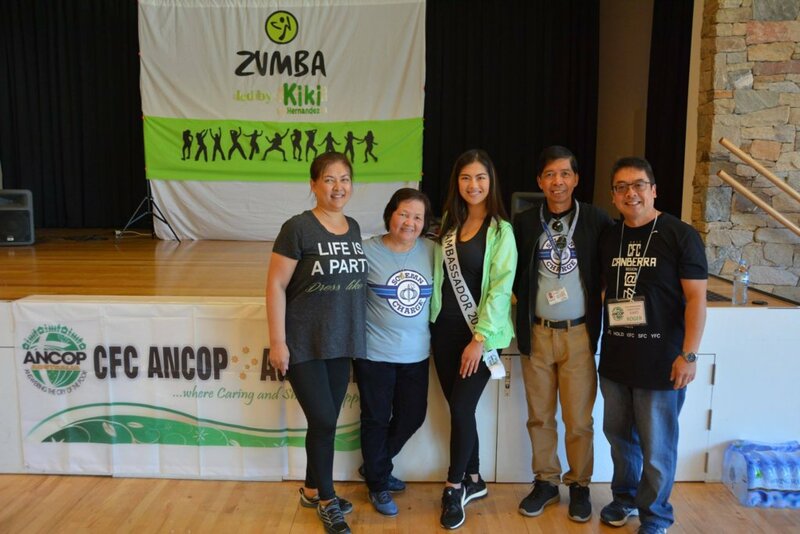 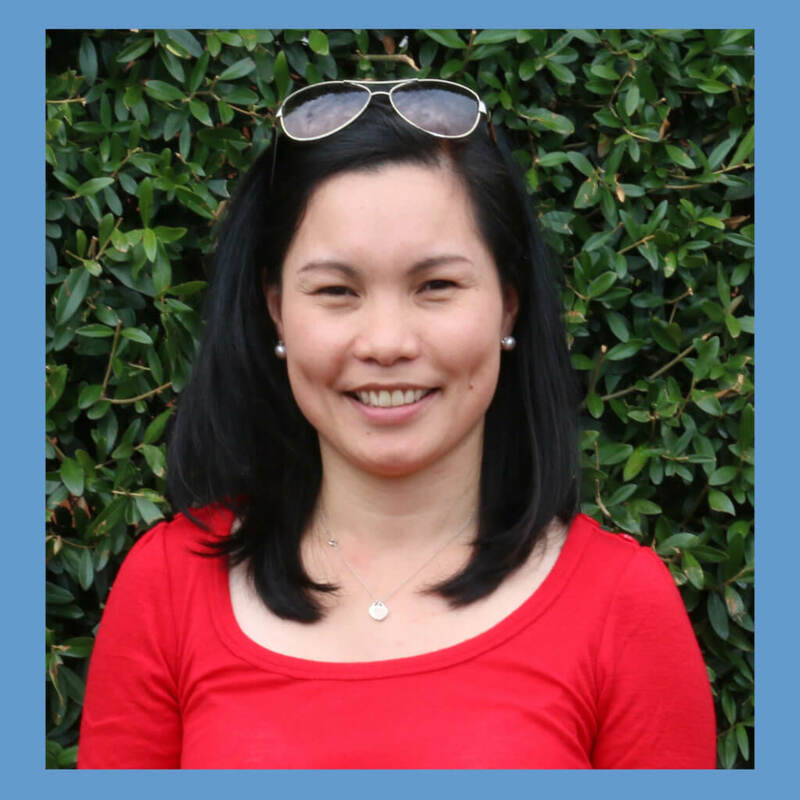 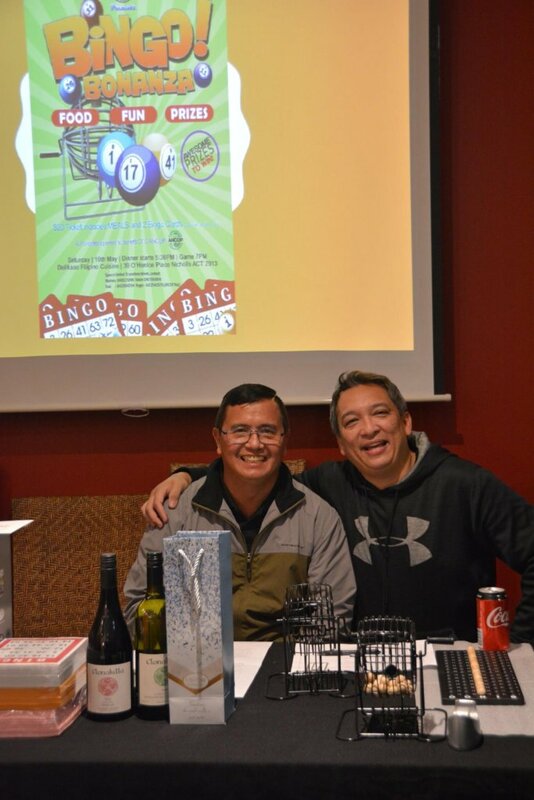 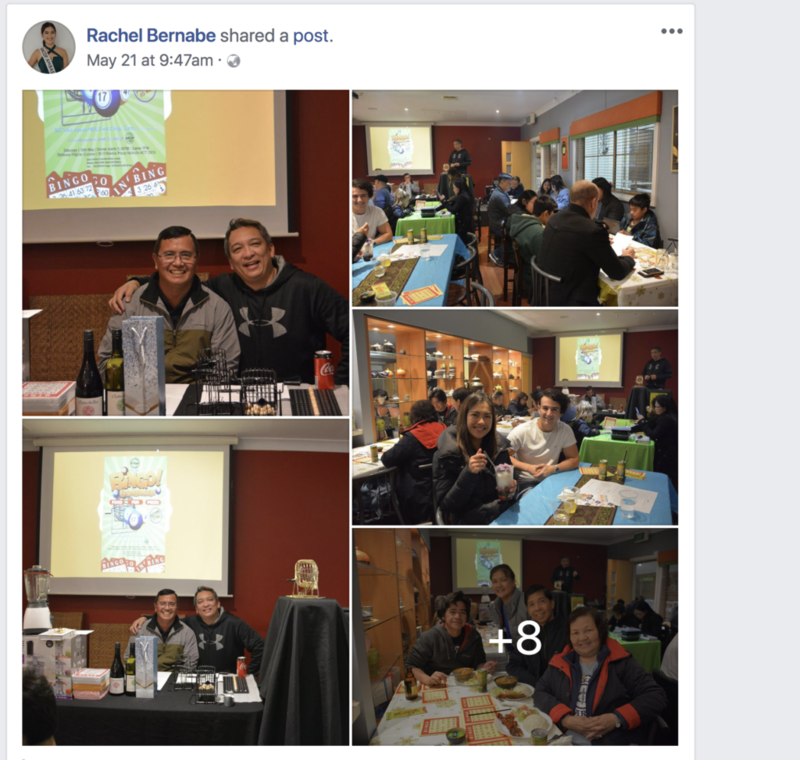 Within my first week as Consul, for instance, I attended successive Filipino community and church events where I was welcomed – for lack of a better way to put it – like a rock star. 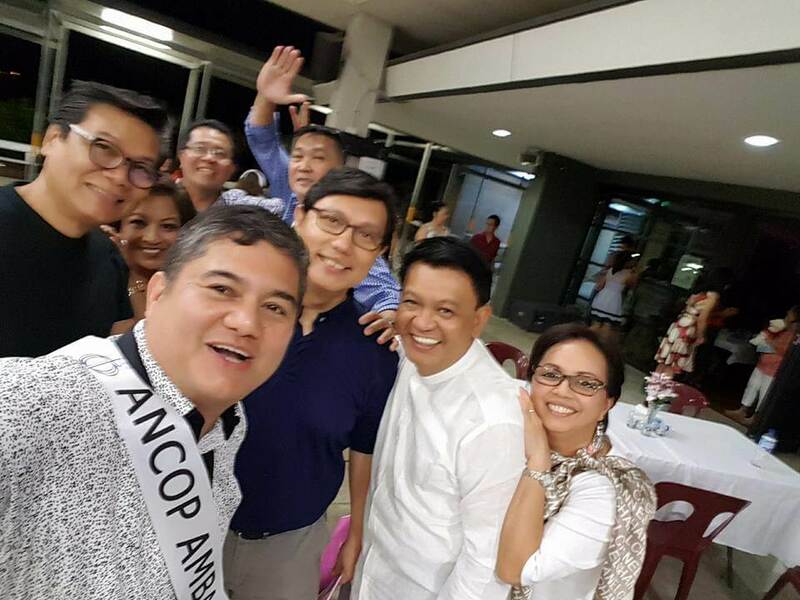 I was pushed and pulled all around the venues by an endless number of kababayans who wanted to take selfies with me. 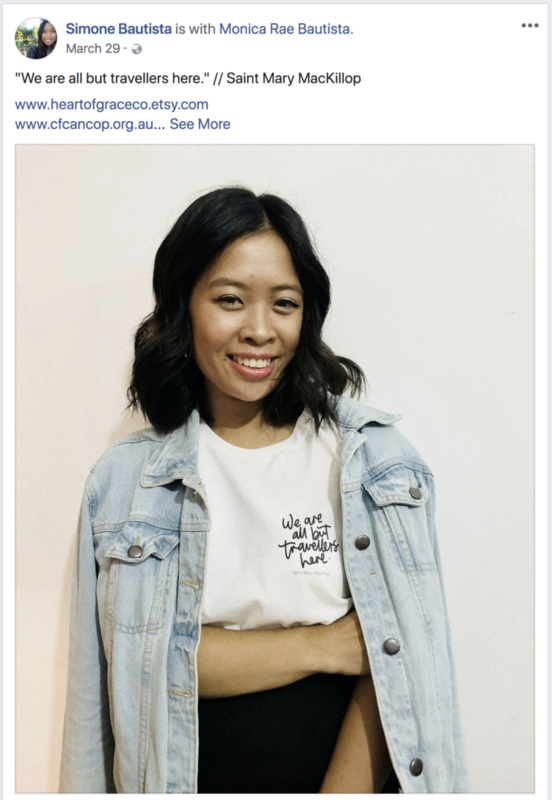 I may have actually trended on facebook. 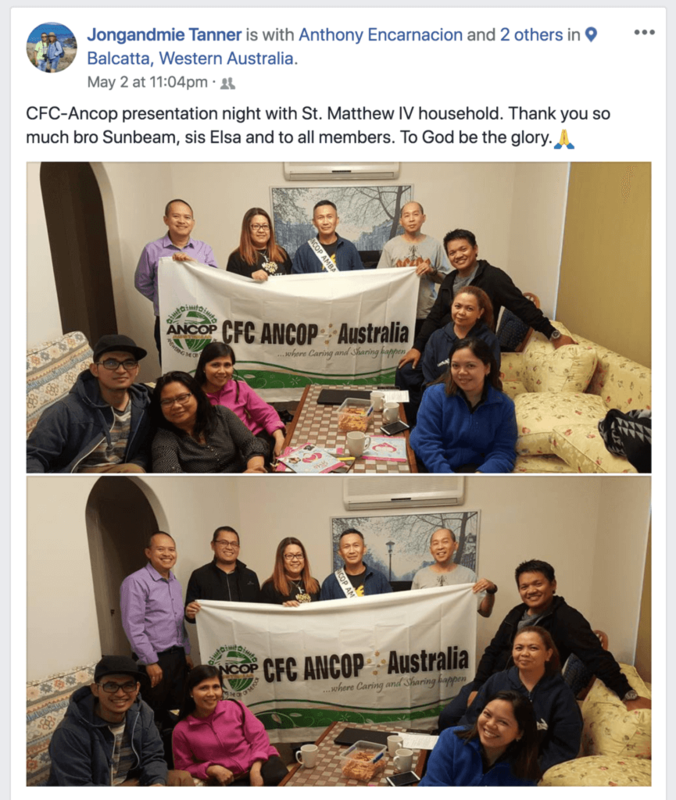 I soon enough figured out that those raucous Australian receptions were borne not so much out of any sense of celebrity, but were overflow emotions of happiness and satisfaction by the organizing groups – happiness and satisfaction for the hard work that they had put in, for what they had achieved, and for what it meant to be with and help out a friend, a neighbour, a countryman. 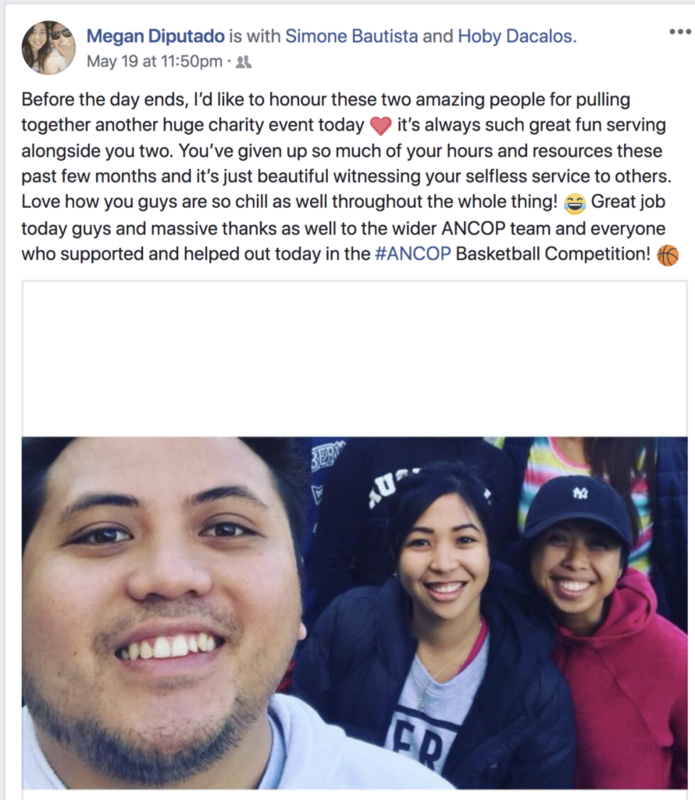 I was just lucky enough to be in their presence on those days. 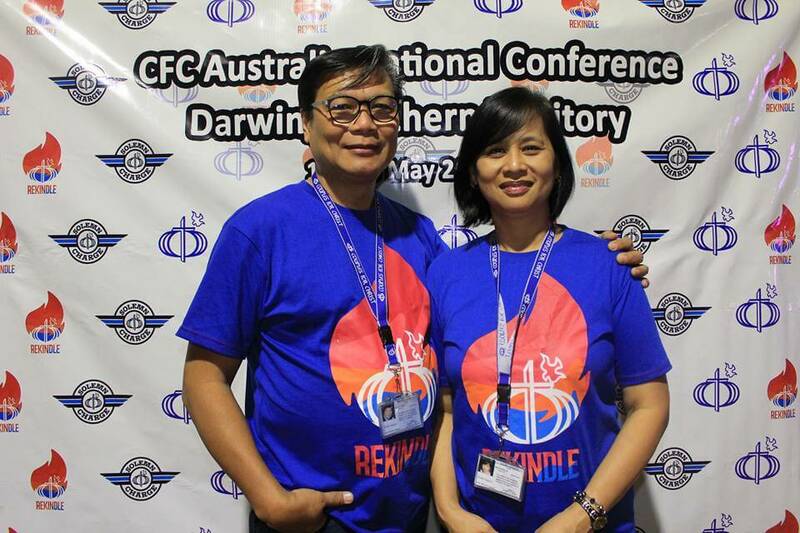 Still, it was an unprecedented and stunning experience for me. 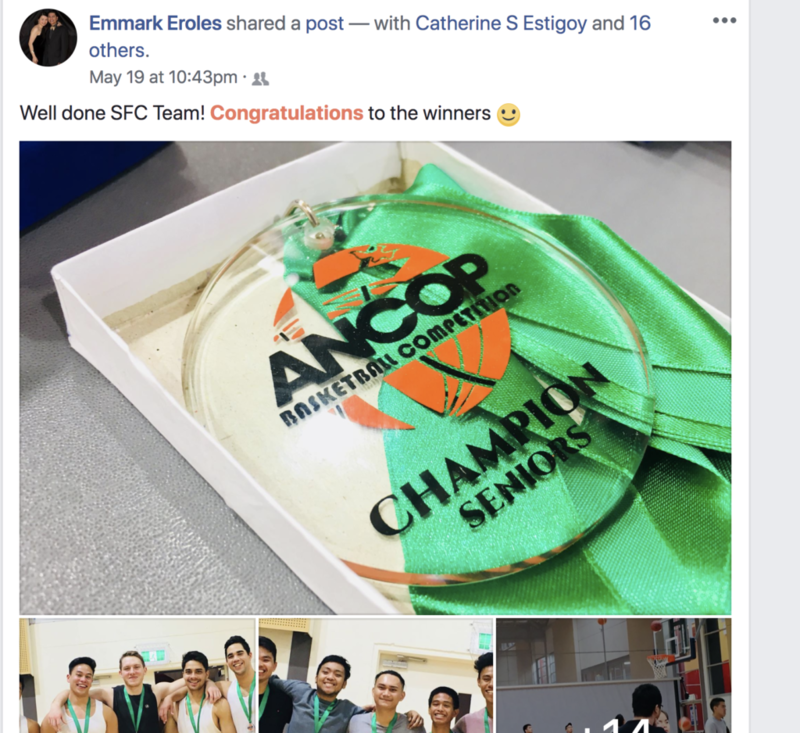 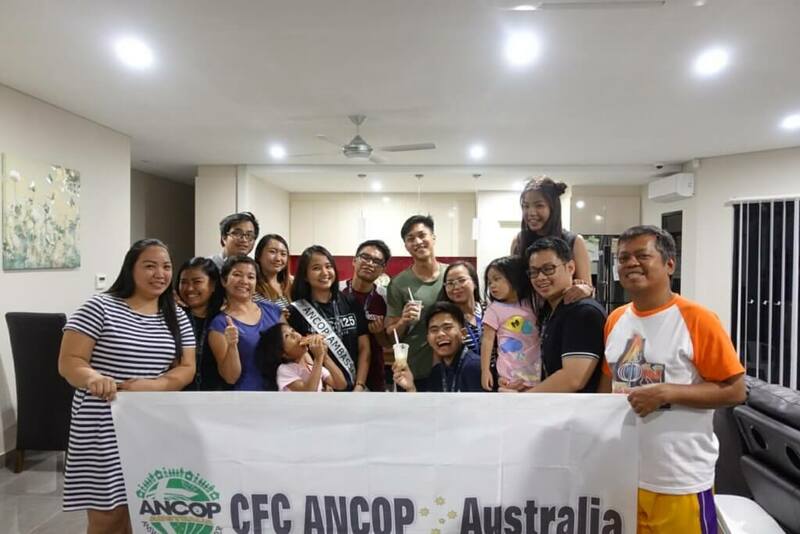 Fast forward to this evening, and my first occasion to be with CFC ANCOP, and I express the same wide-eyed astonishment, amazement and utter admiration, not just for your welcome, but for all that you’ve done and for all that you are doing in the region. 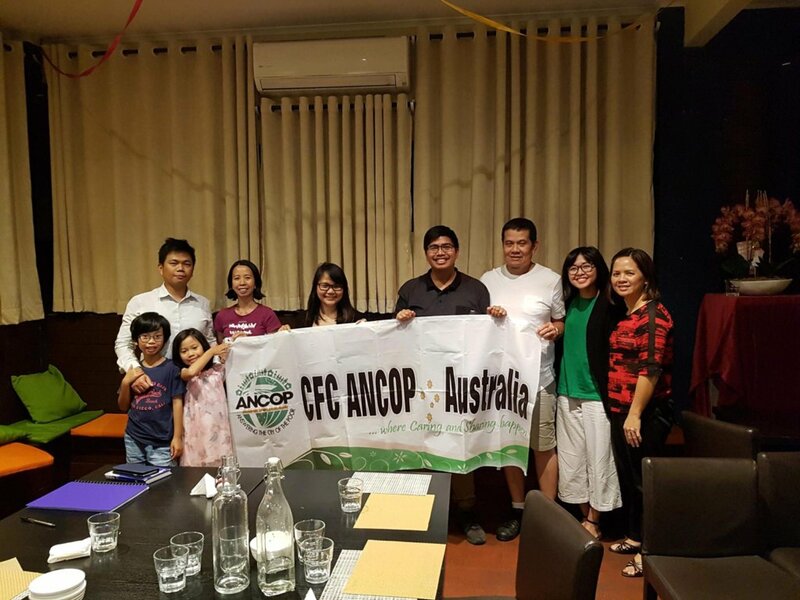 I understand that CFC ANCOP has endured and thrived and grown for over 15 years now. 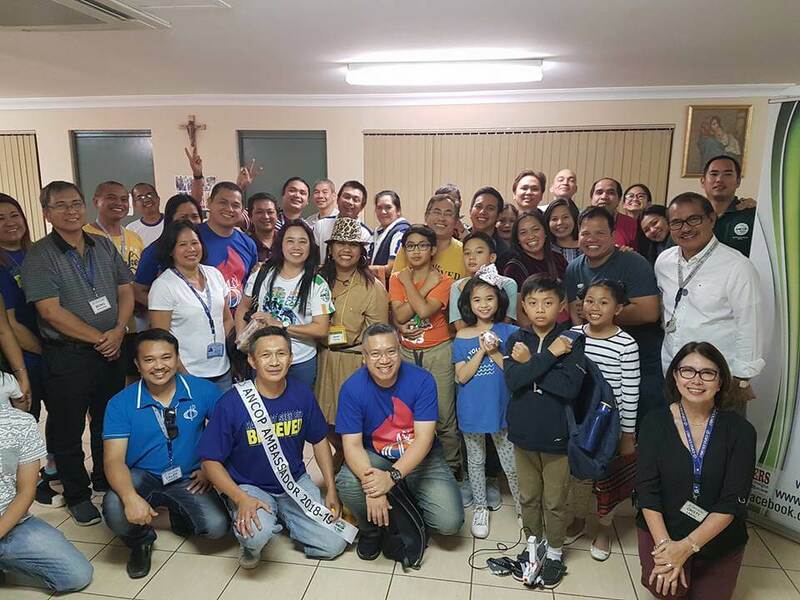 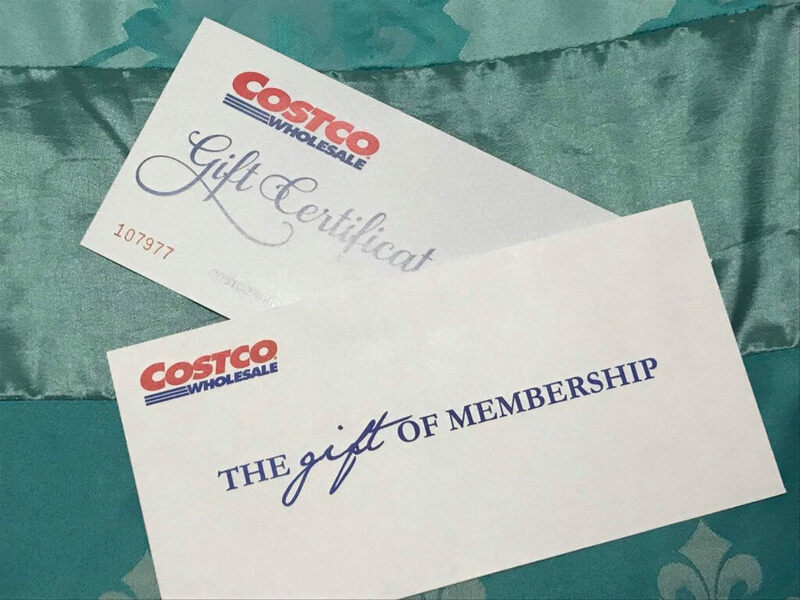 This is a strong testament to the values and character of your members. 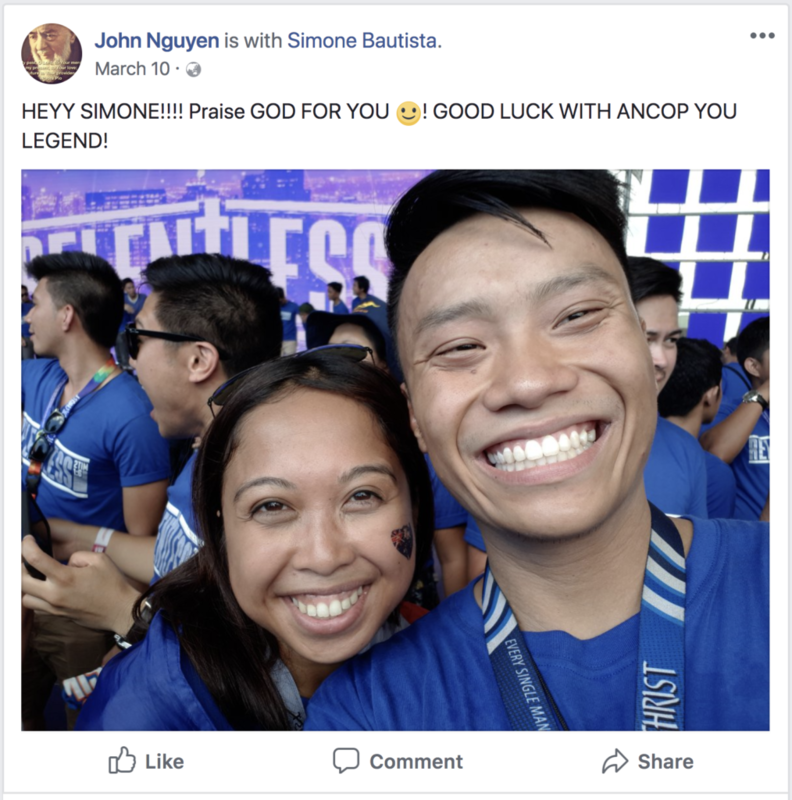 You should easily last for another 50 years, as your group is clearly built on a strong foundation of faith, service, and love of fellow man. 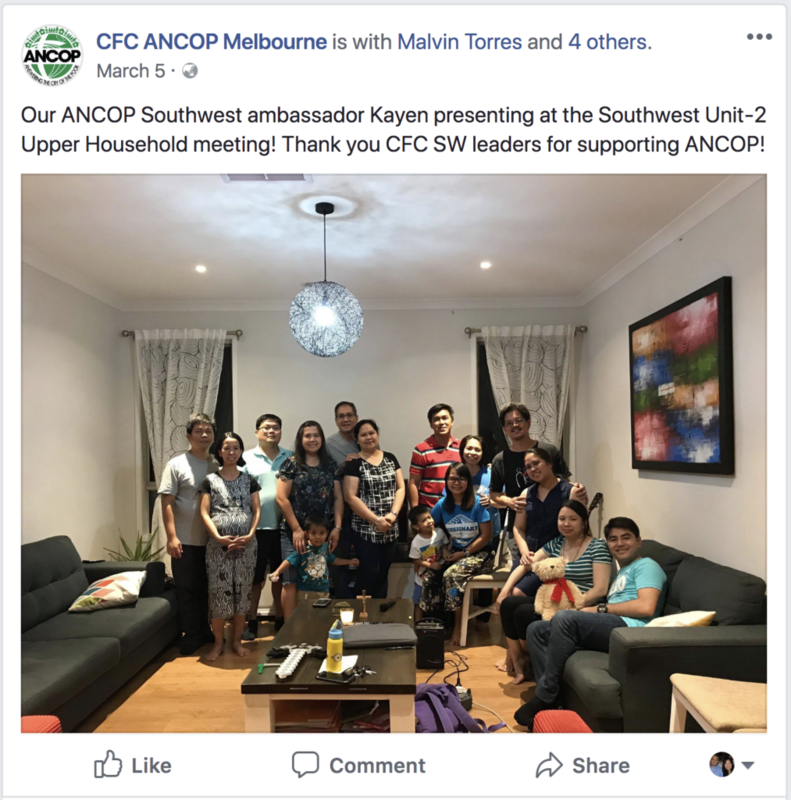 From your early works of building houses for poor families in the Philippines then under the Gawad Kalinga brand, to your development of entire communities with strong and stable families, all the way up to your courageous contributions towards calamity relief and rehabilitation in the Pacific region, I can see that CFC ANCOP has set in place an unassailable legacy. 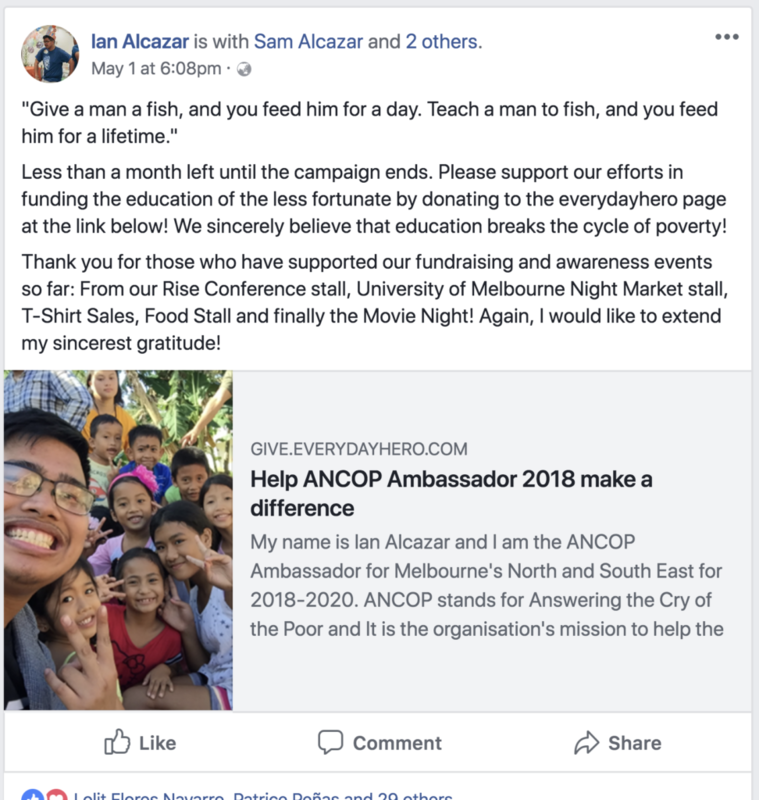 Yet for all that you’ve done, I get the sense that you still want to do so much more. 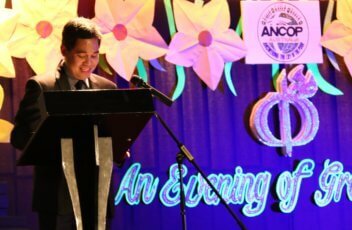 Indeed, I learned ahead of tonight’s event that your ongoing education and skills training sponsorships benefit nearly 500 students across several countries. 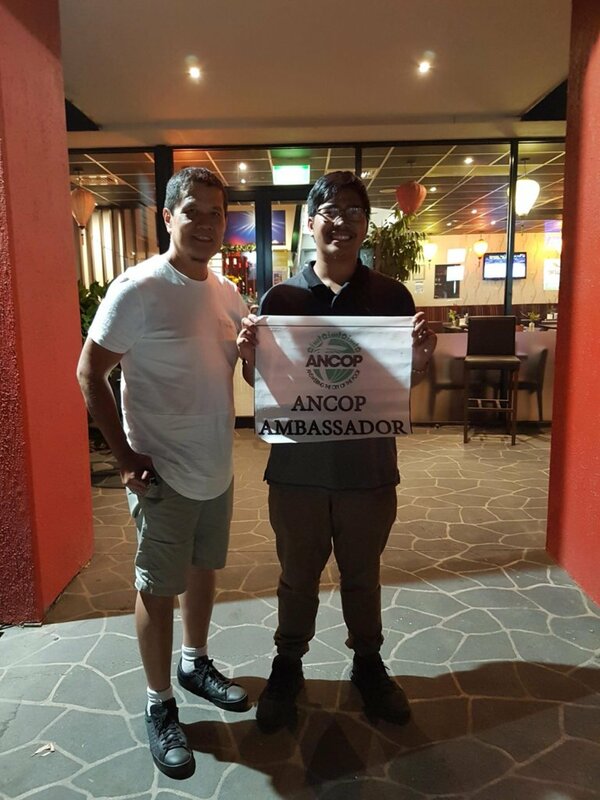 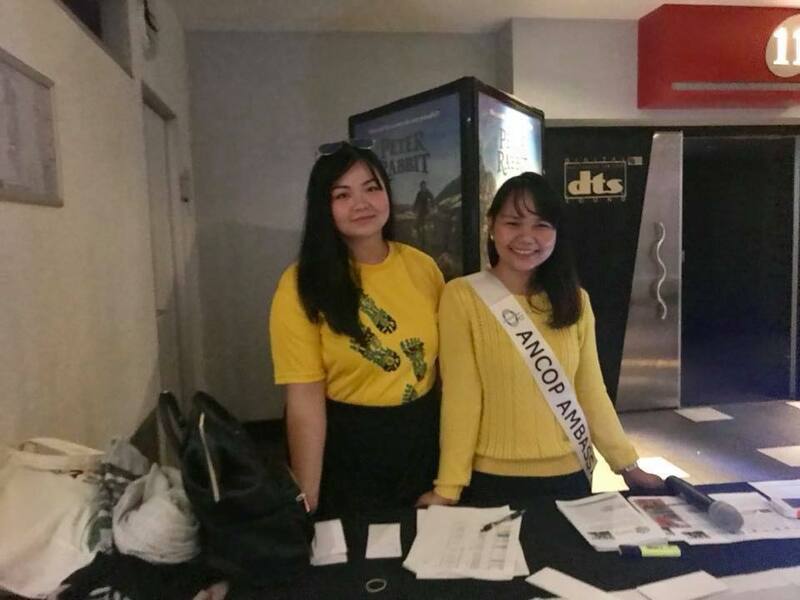 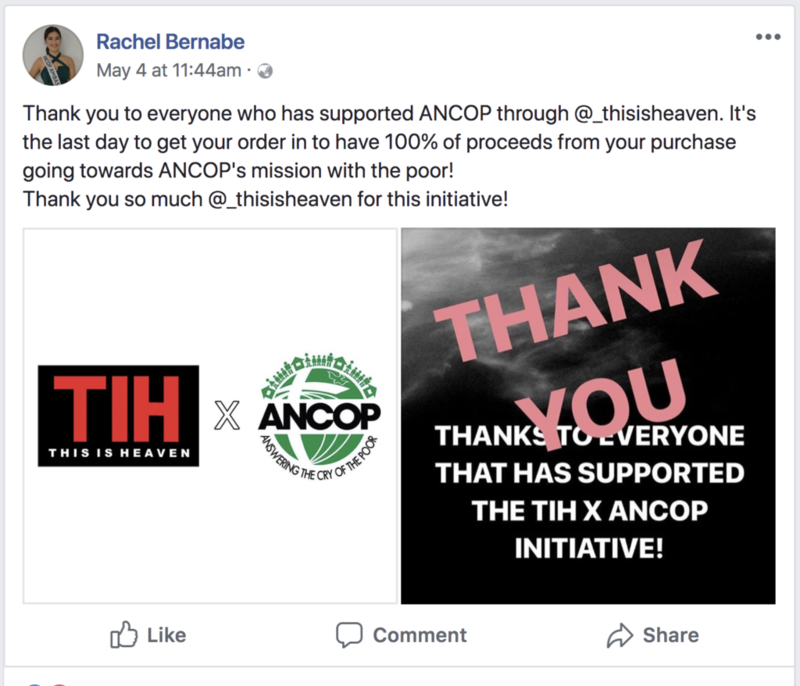 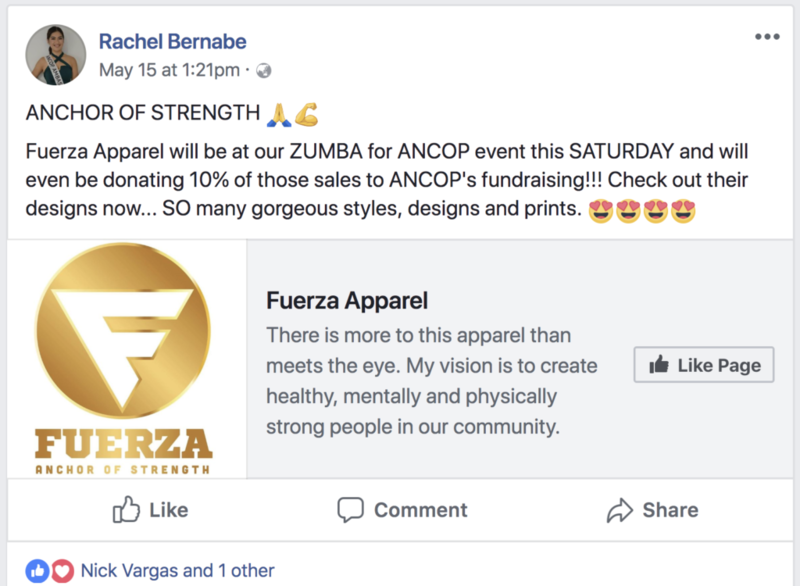 And your Ambassador program is coming off another successful year of spreading the word and work of ANCOP, and is rightfully being celebrated tonight. 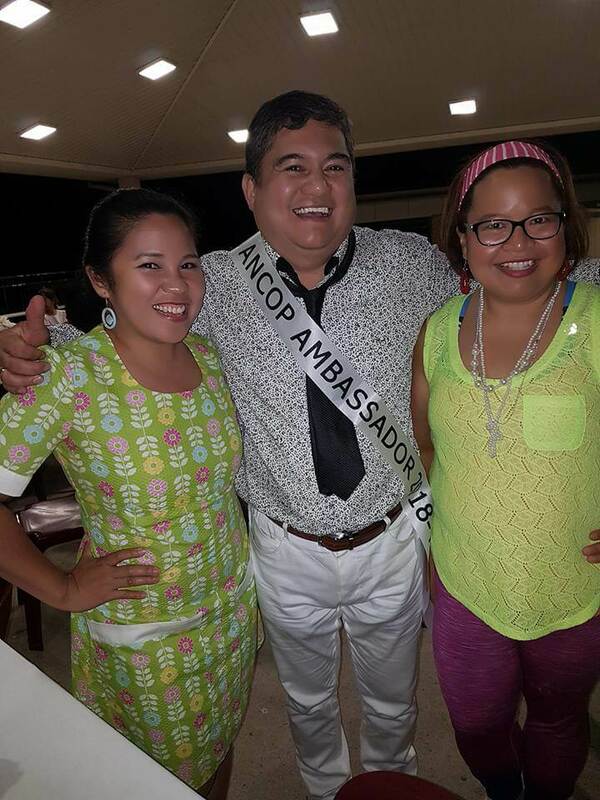 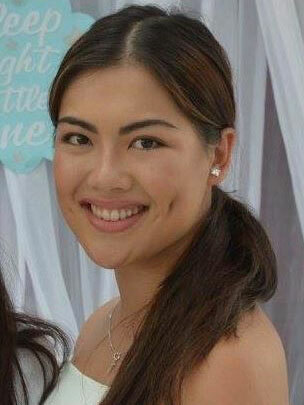 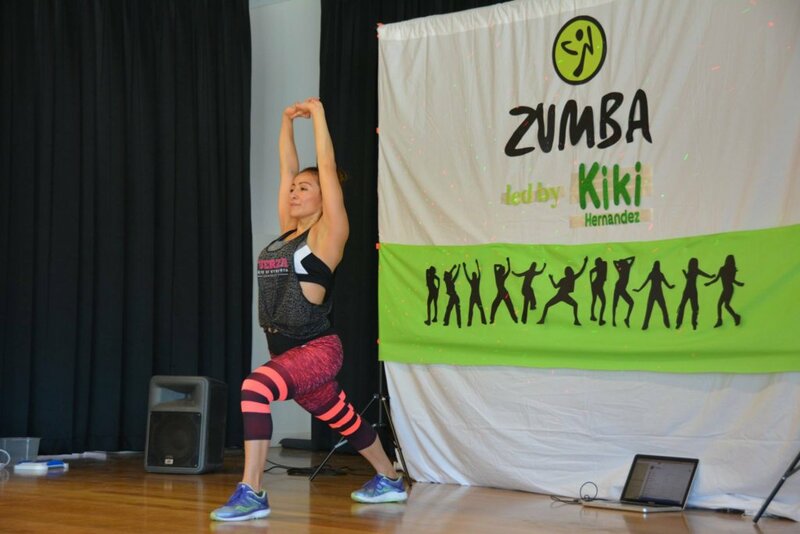 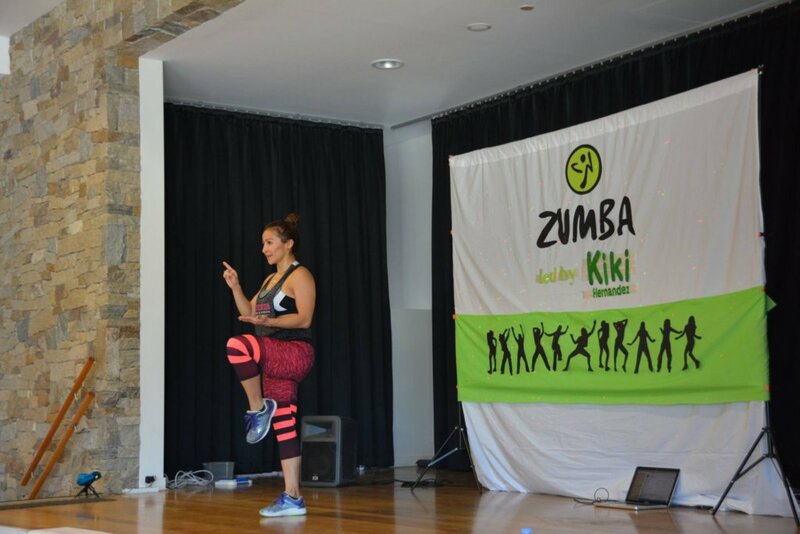 From your latest Ambassadors your association will have new enthusiasm and energy to embark on many exciting endeavors. 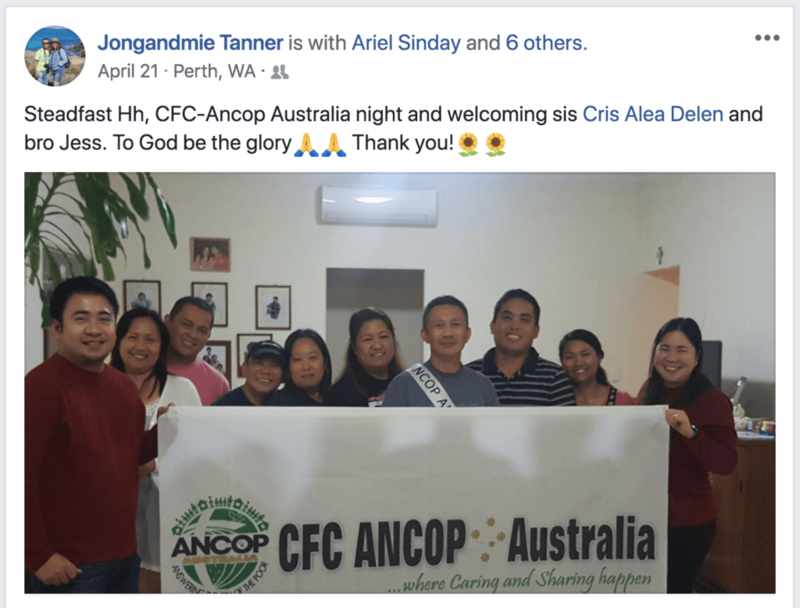 They will propel CFC ANCOP forward, and their experiences will only add to your further spiritual growth, capability and wisdom. 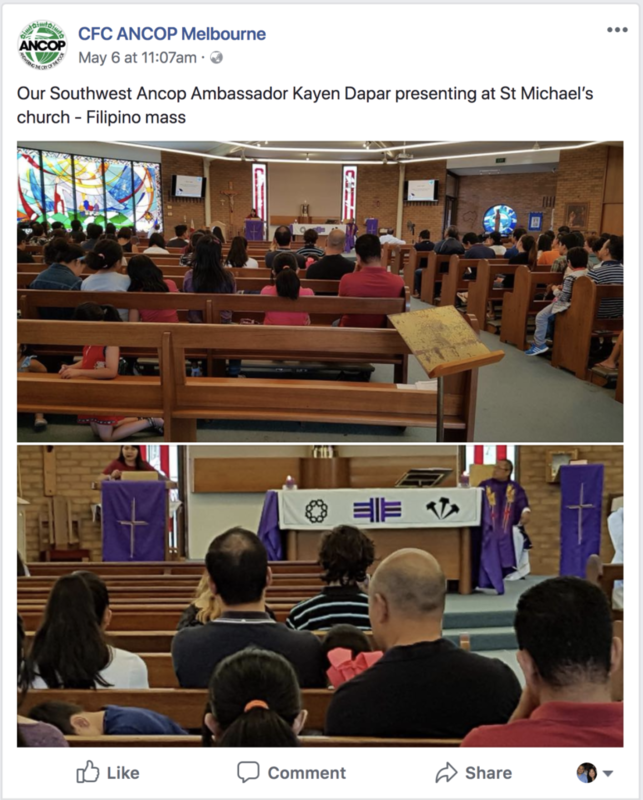 Ladies and gentlemen, the Philippine Consulate was invited to tonight’s event with a request for the Consul to deliver an exhortation type of speech. 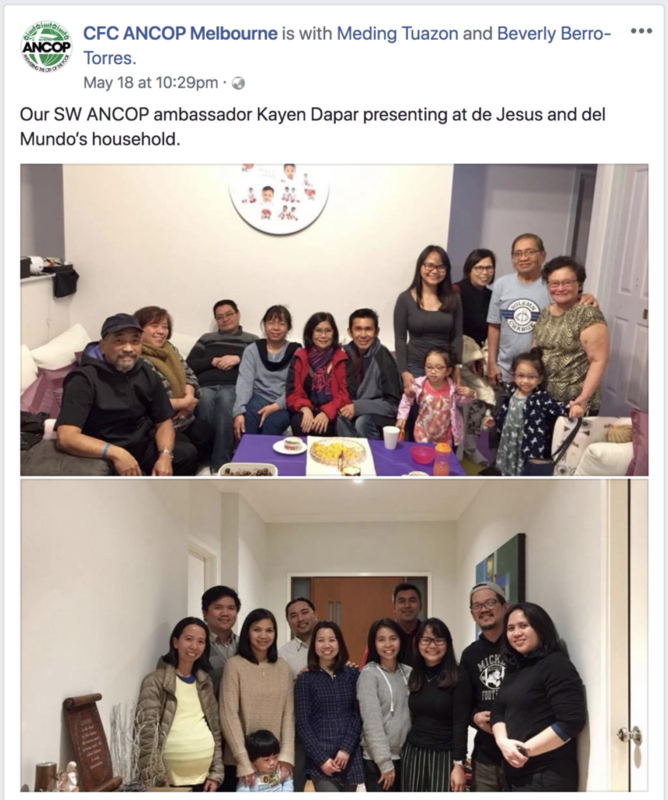 With due respect, I do not believe that is apt or necessary. 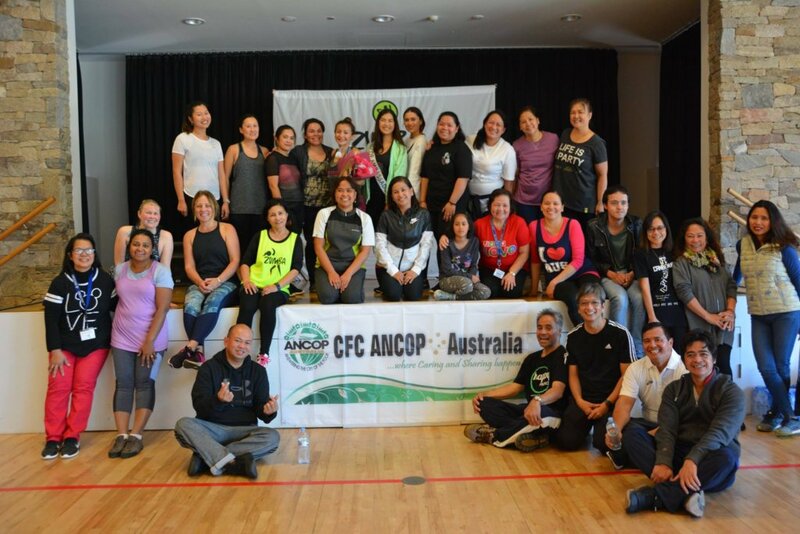 The continuing accomplishments of CFC ANCOP are already unquestionably impressive and, to me personally, humbling. 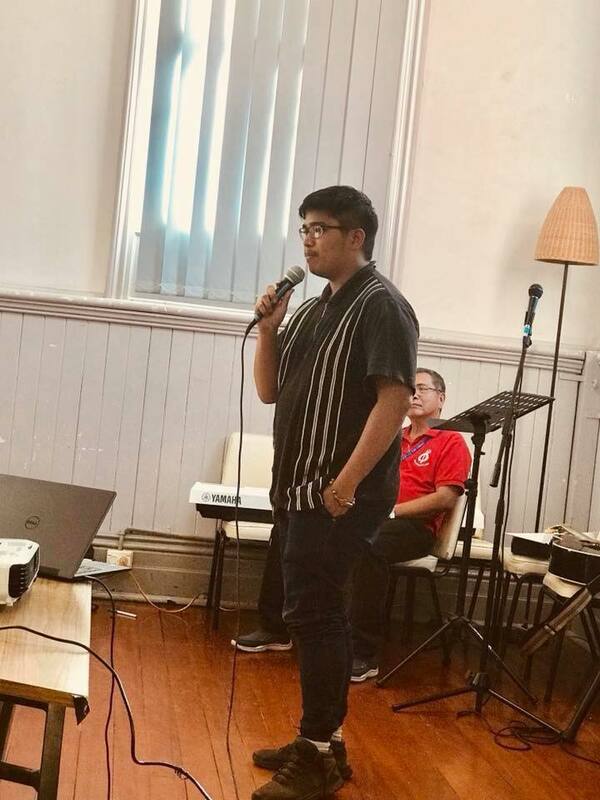 Far be it from me, a newcomer to this land and to your company, to lecture on what you already do so very well. 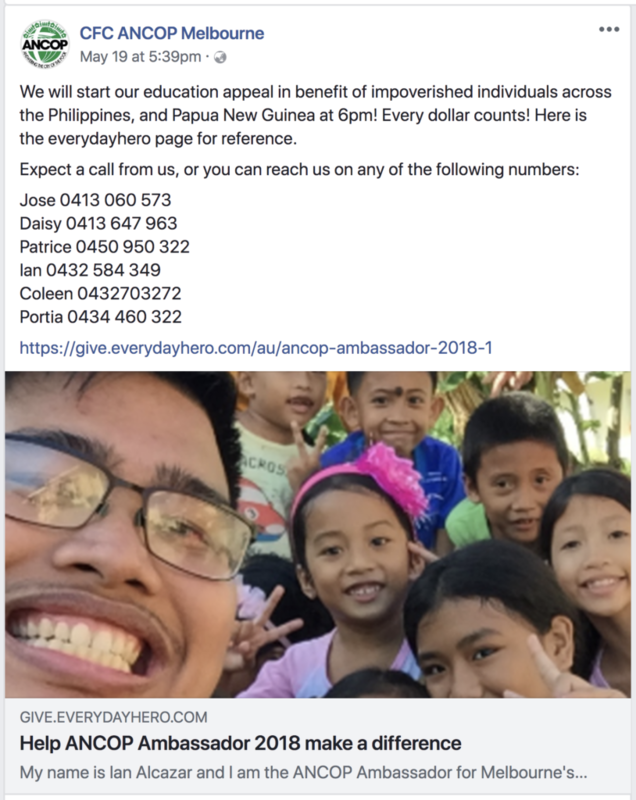 It is self-evident from your work and achievements that you are a special brand of people, one that has righteous ideals, an unwavering commitment to service and sacrifice, genuine selflessness, and the skills and can-do spirit to actually make a difference. 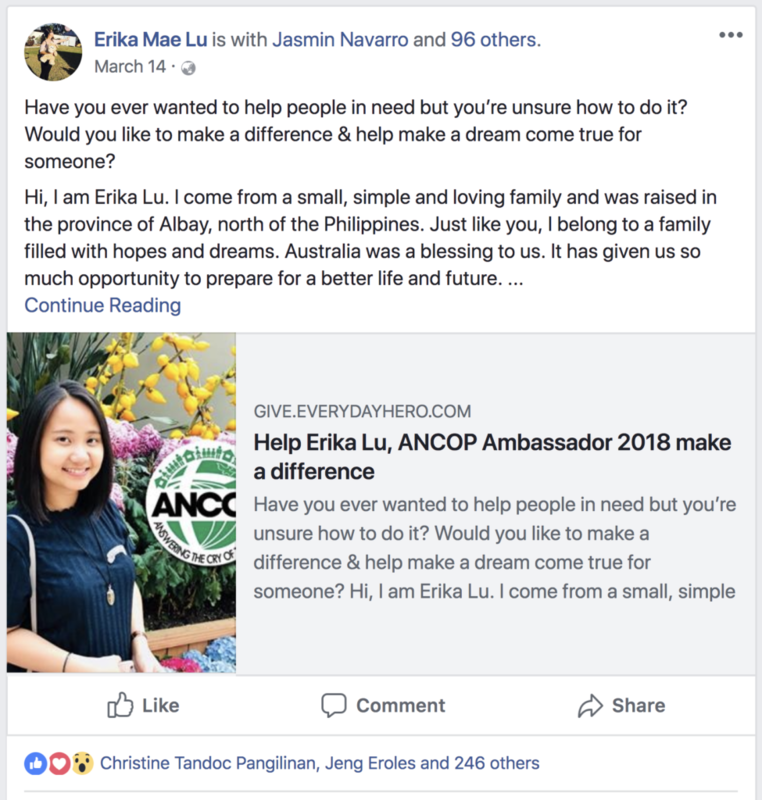 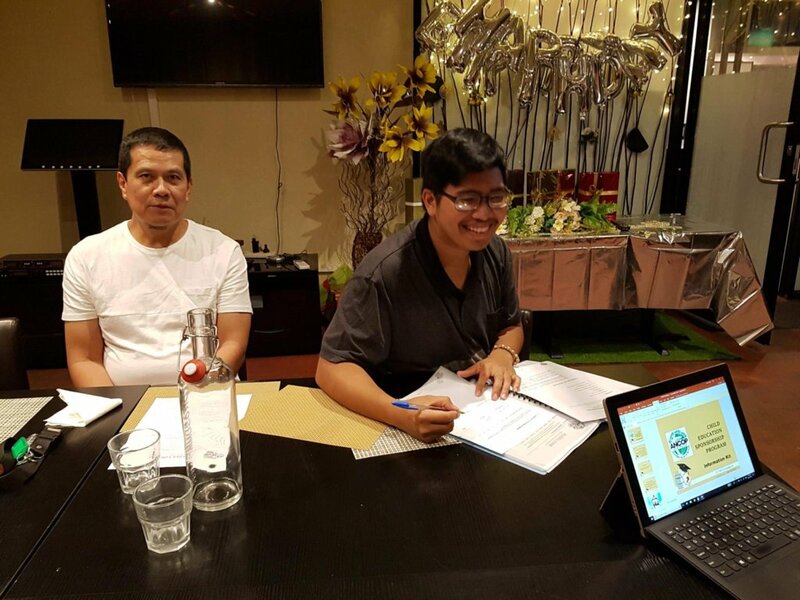 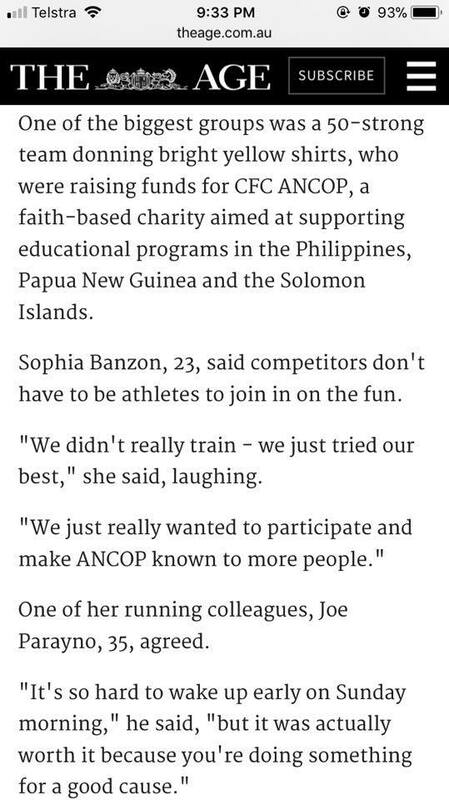 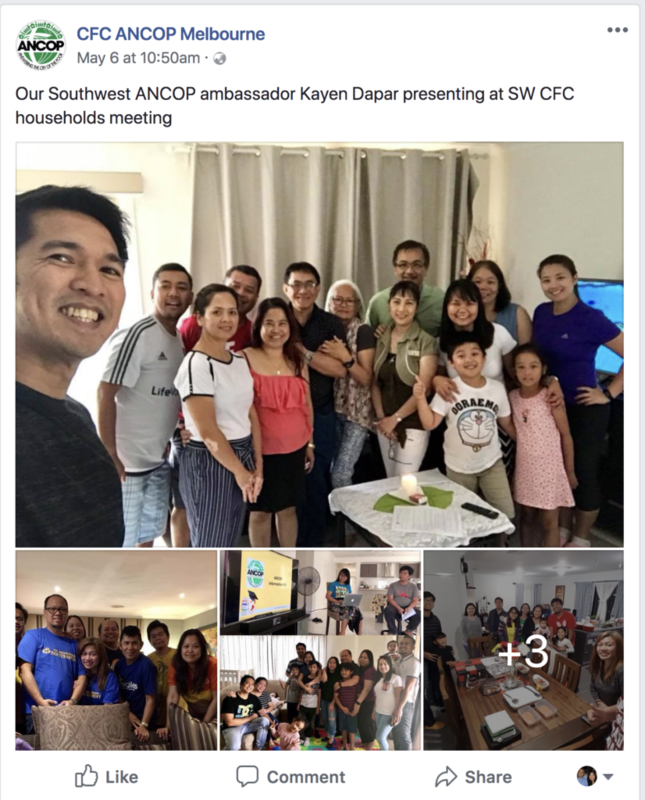 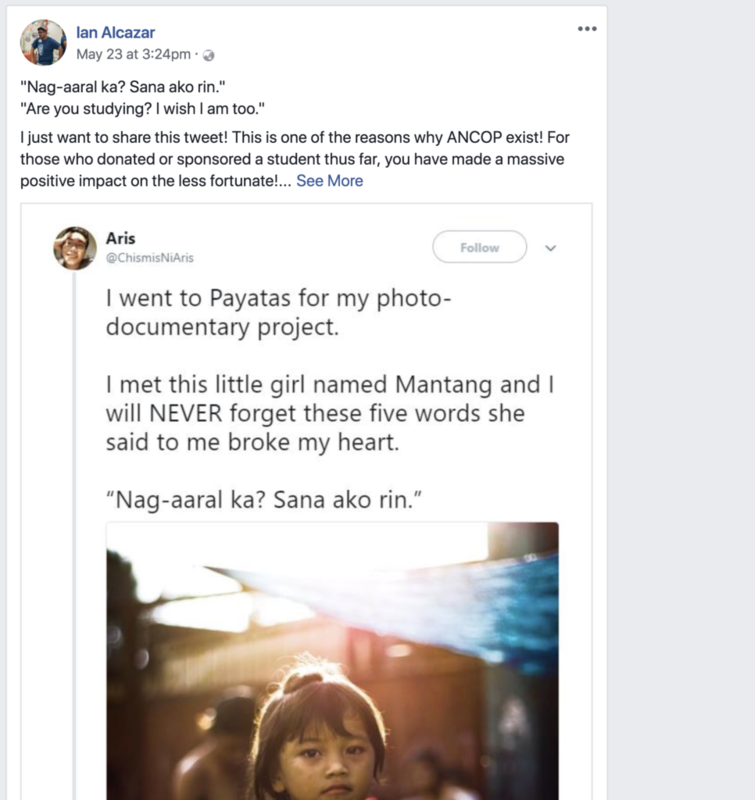 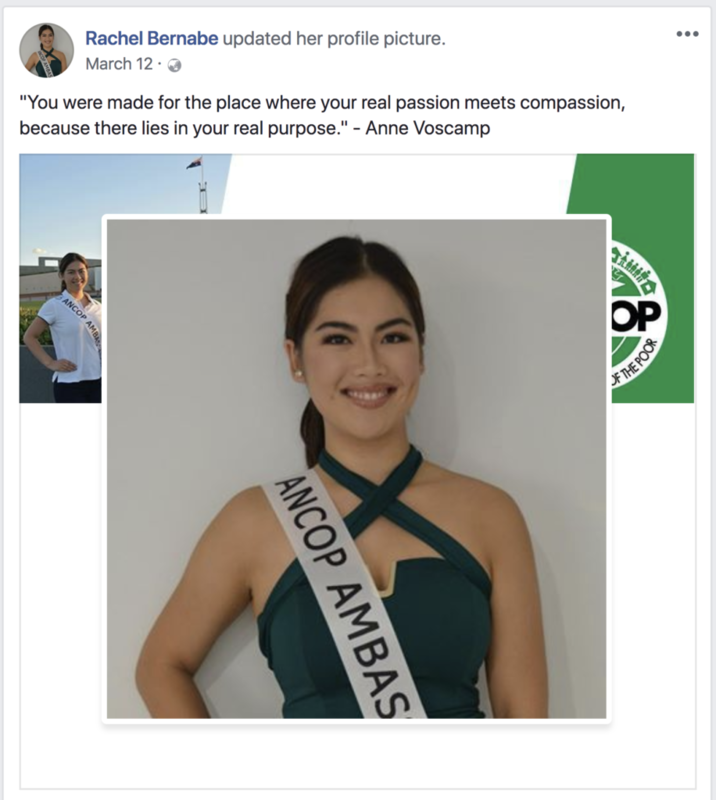 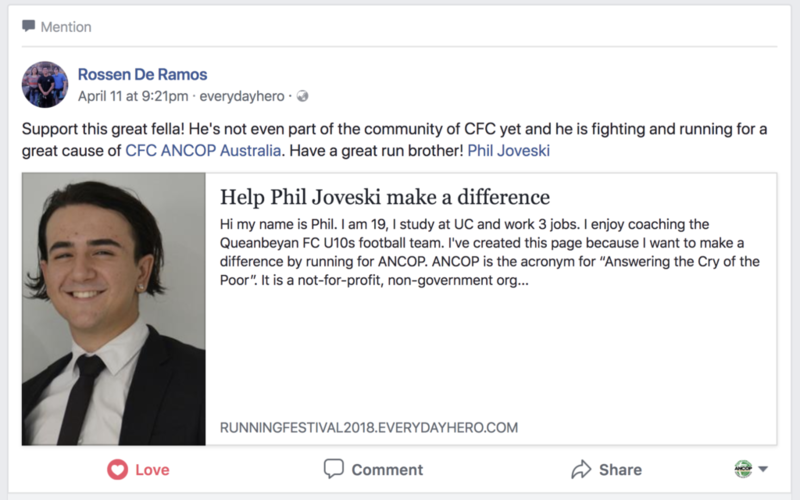 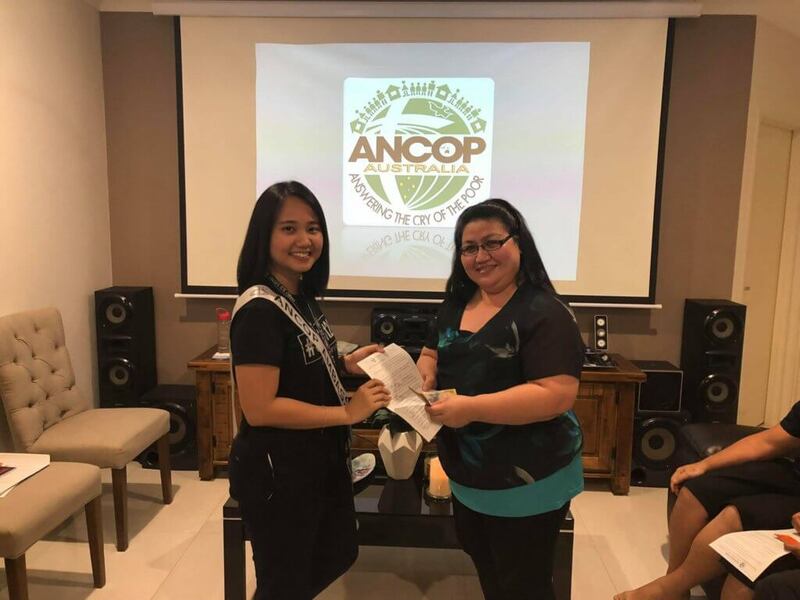 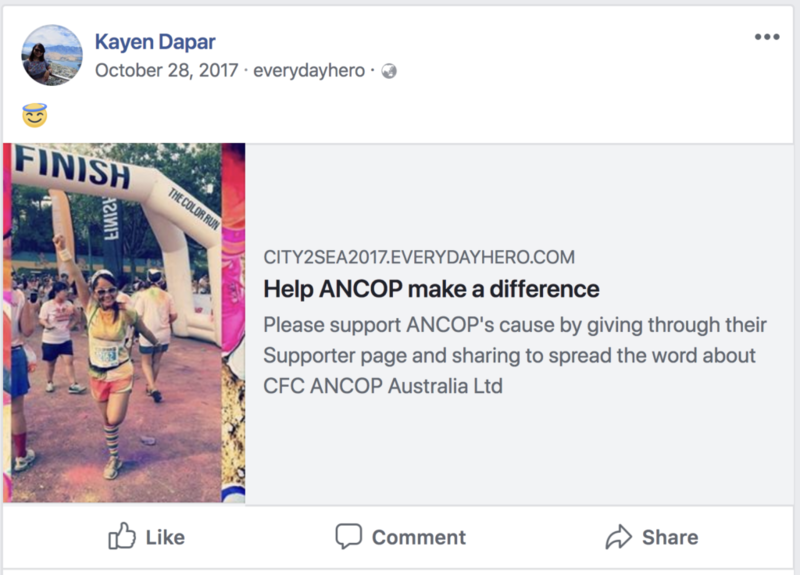 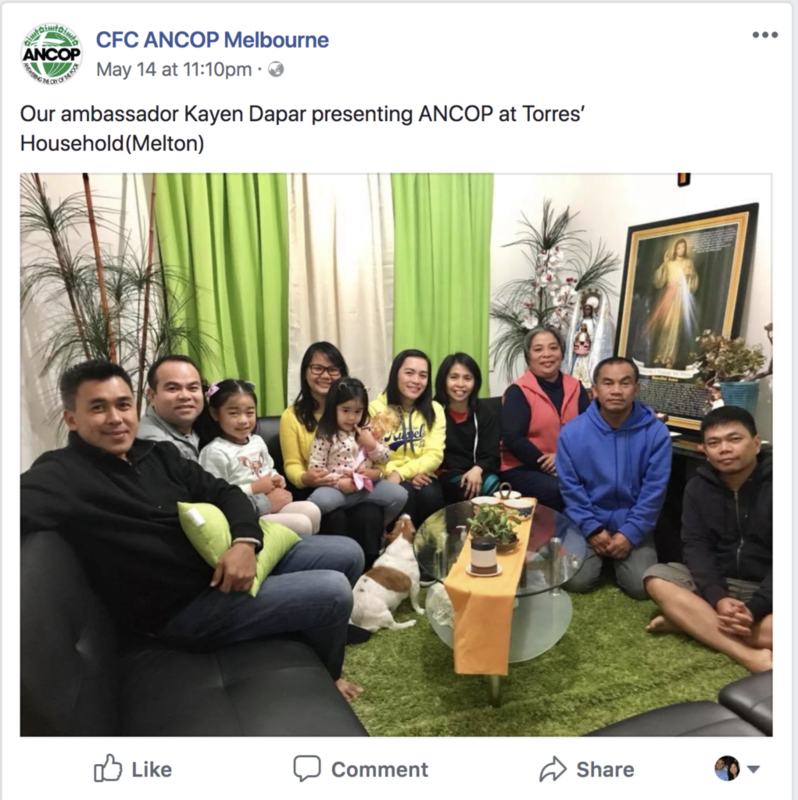 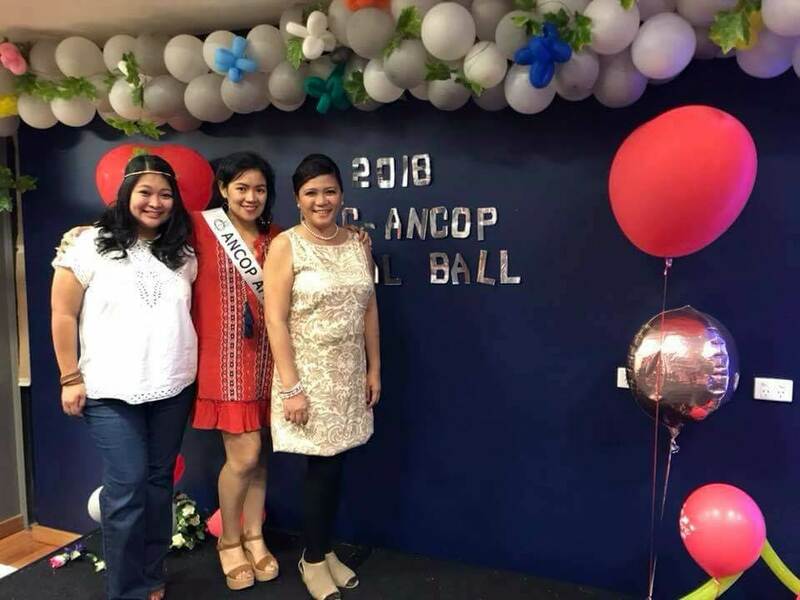 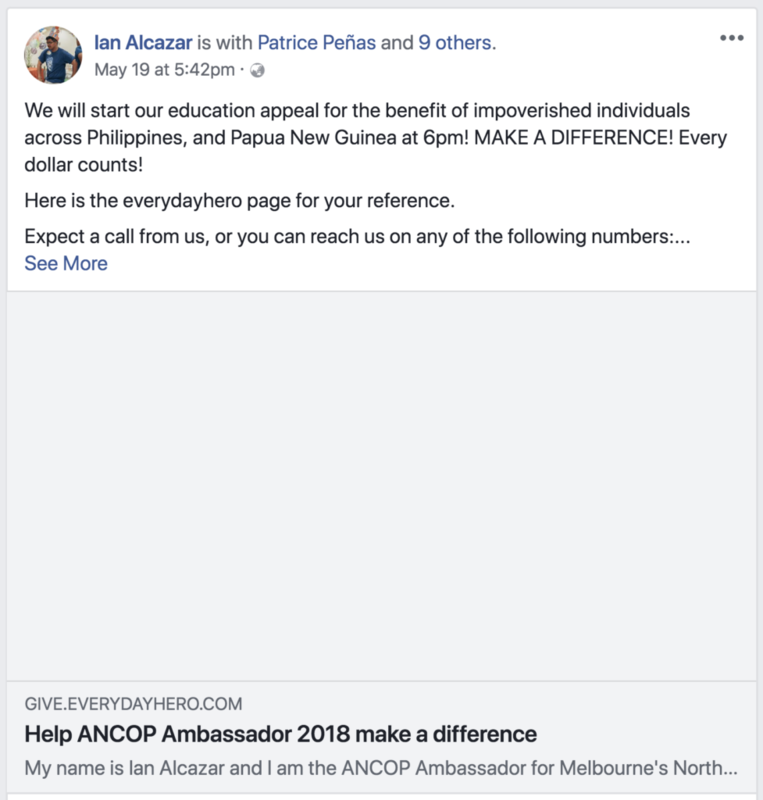 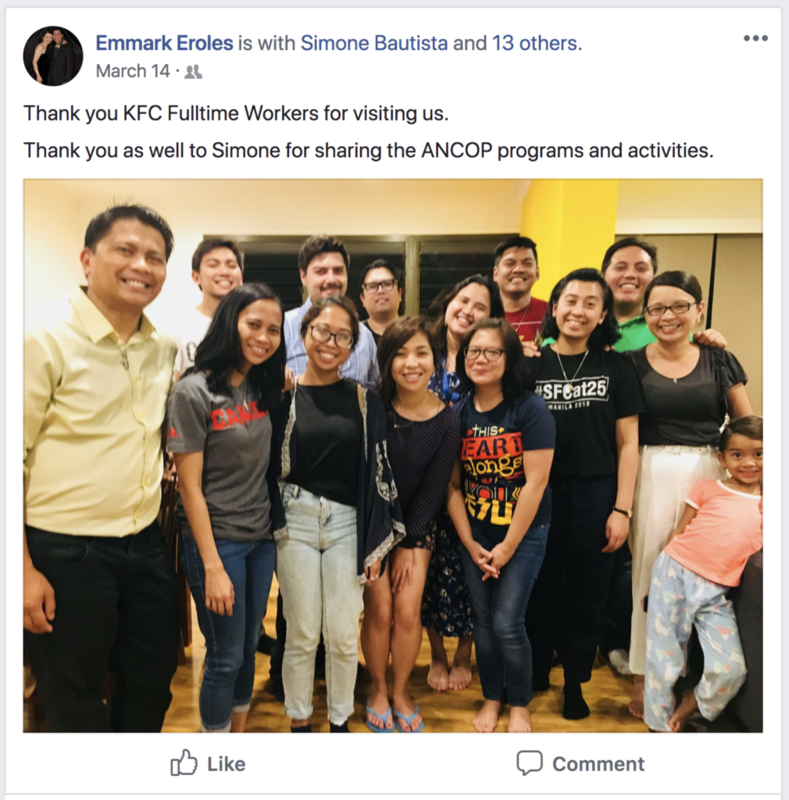 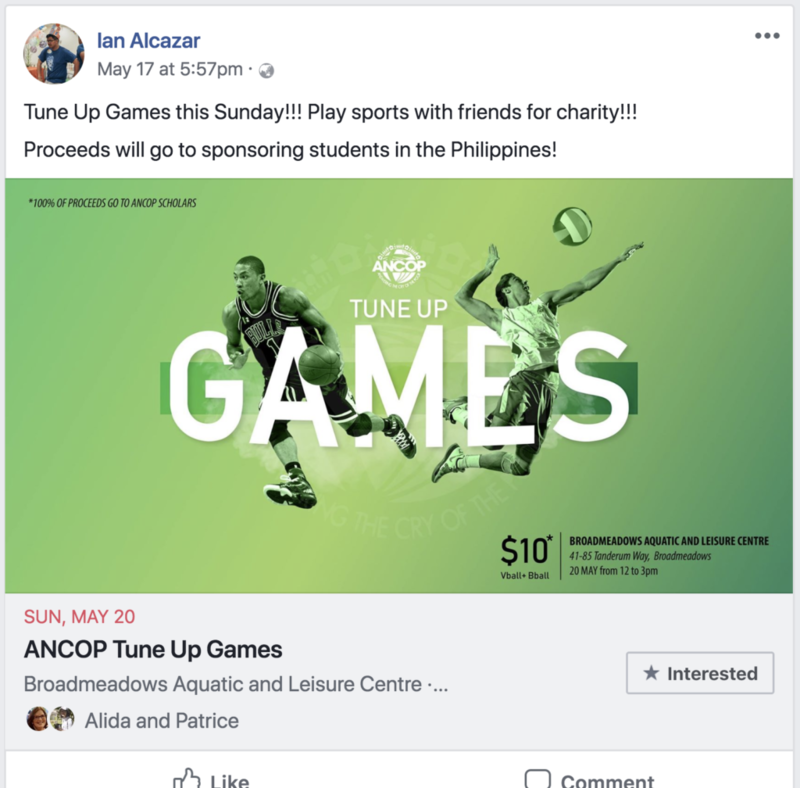 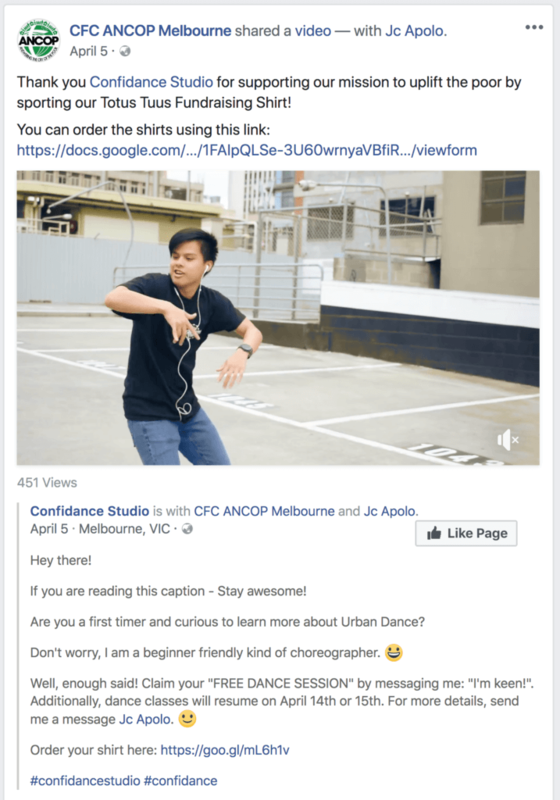 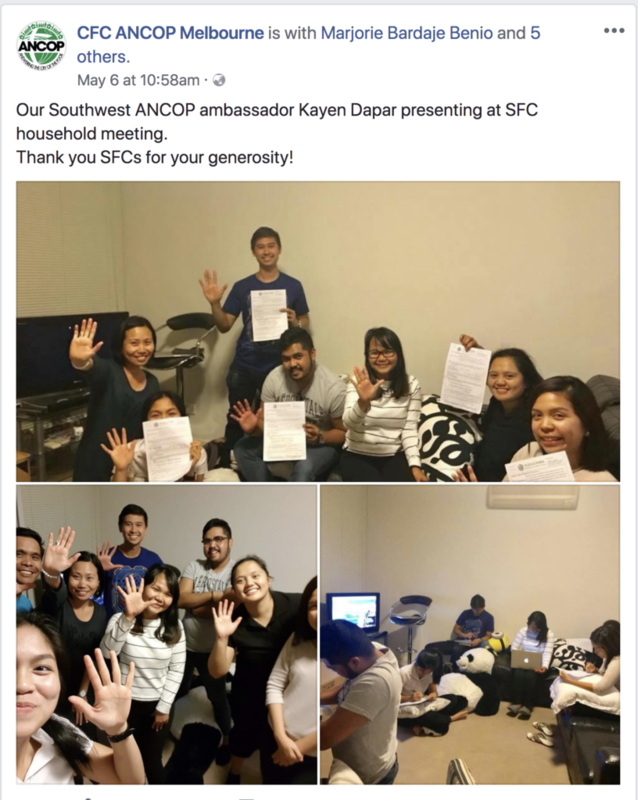 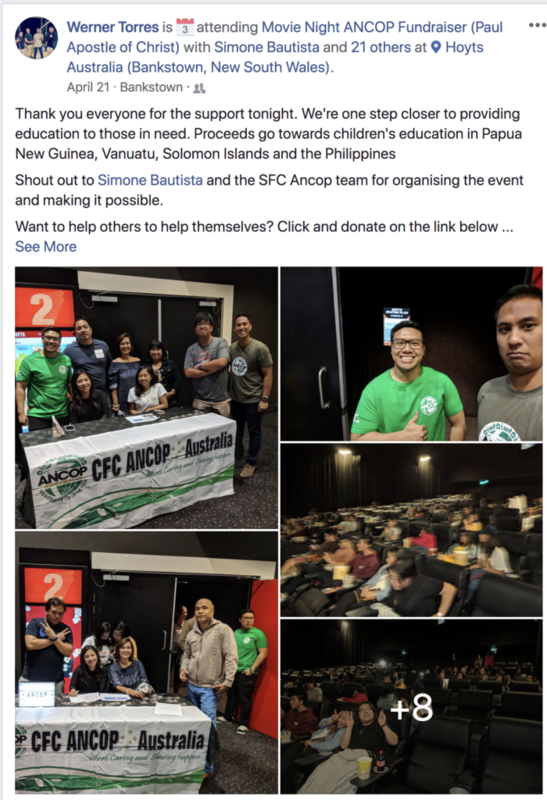 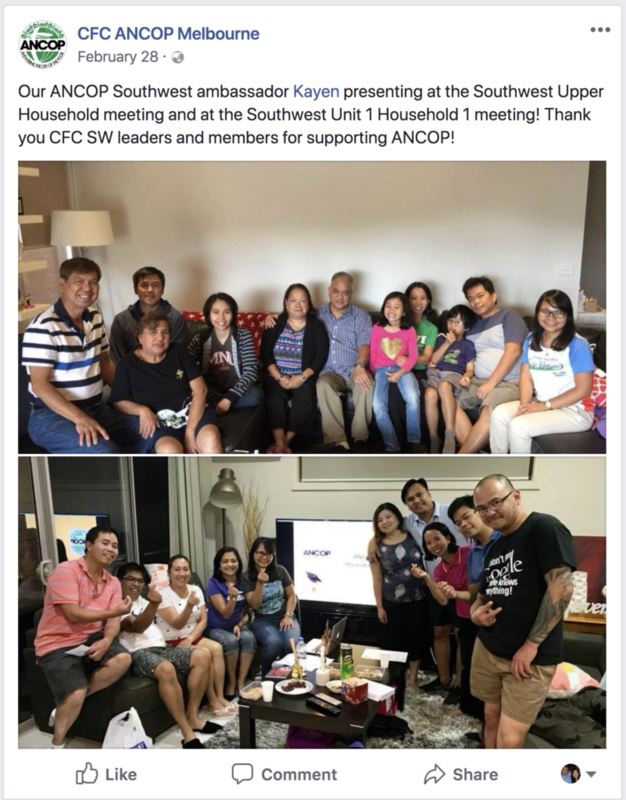 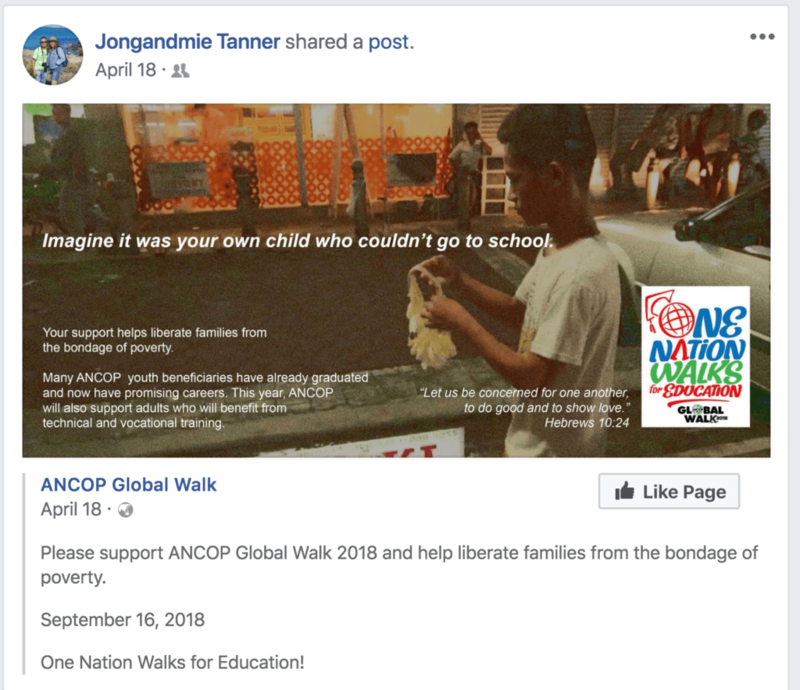 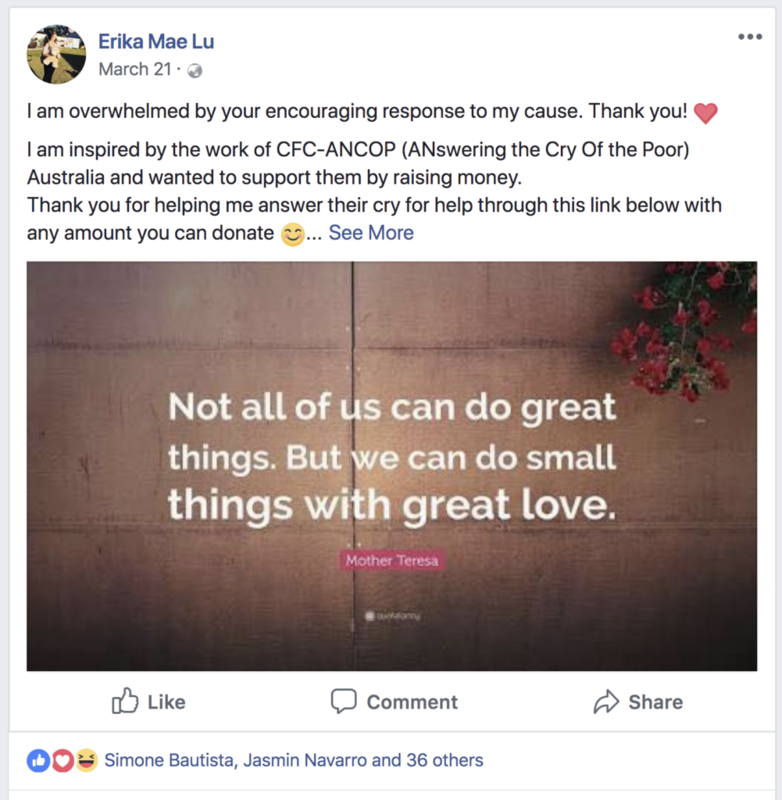 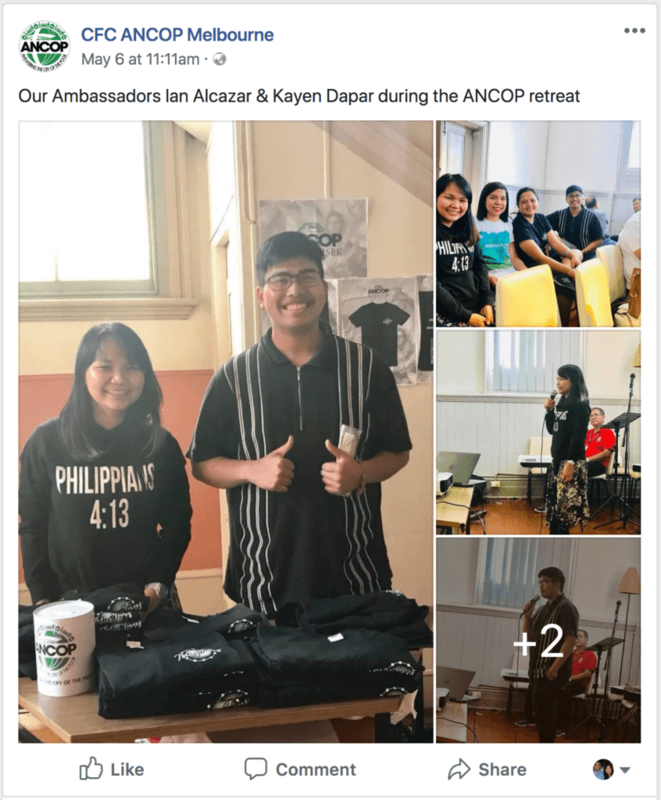 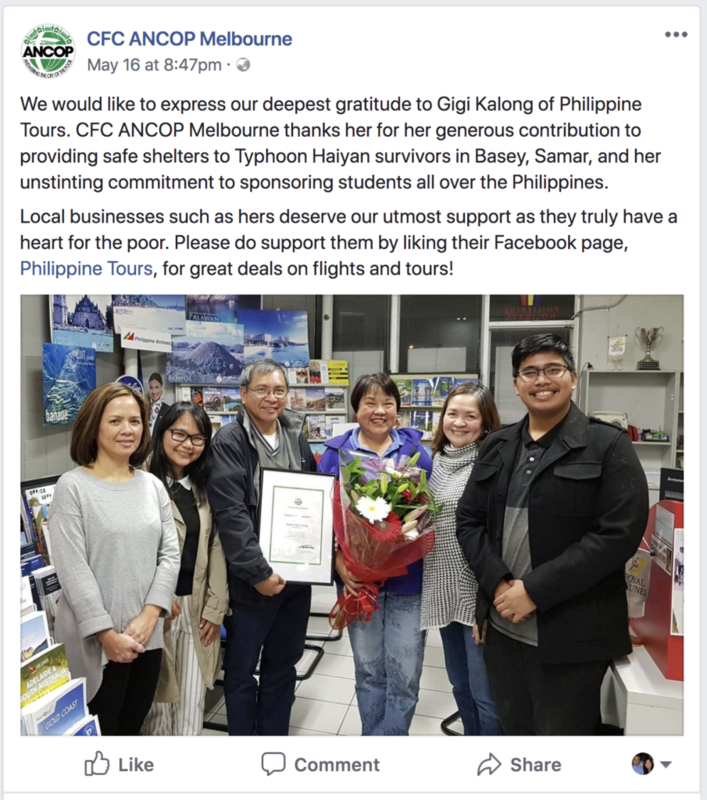 If anything, I would just respectfully invite and welcome the support of CFC ANCOP in various areas of cooperation with the Philippine Consulate, in activities where institutions such as ours which are founded on leadership, values and service can be of most help to the public and to the nation. 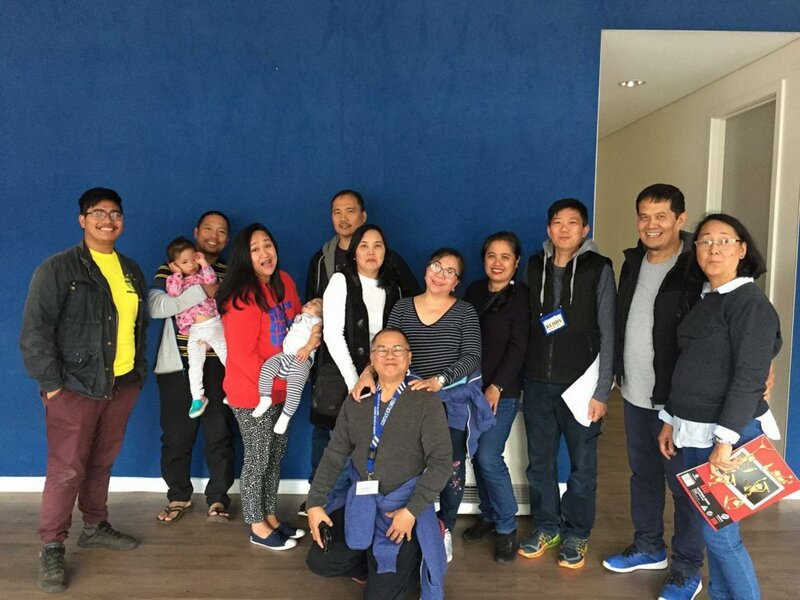 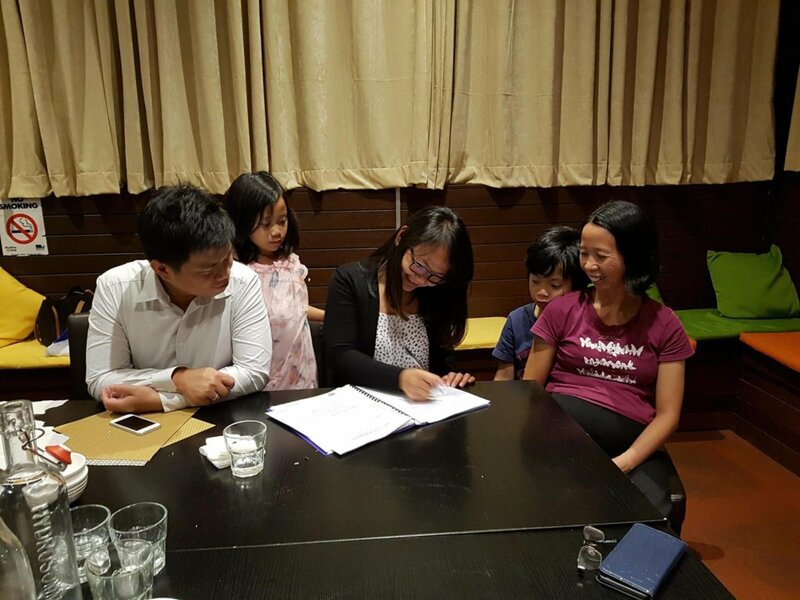 The Consulate, for instance, has numerous dialogues and programs relating to labour, migration and education to make as many people as possible aware of their rights and opportunities. 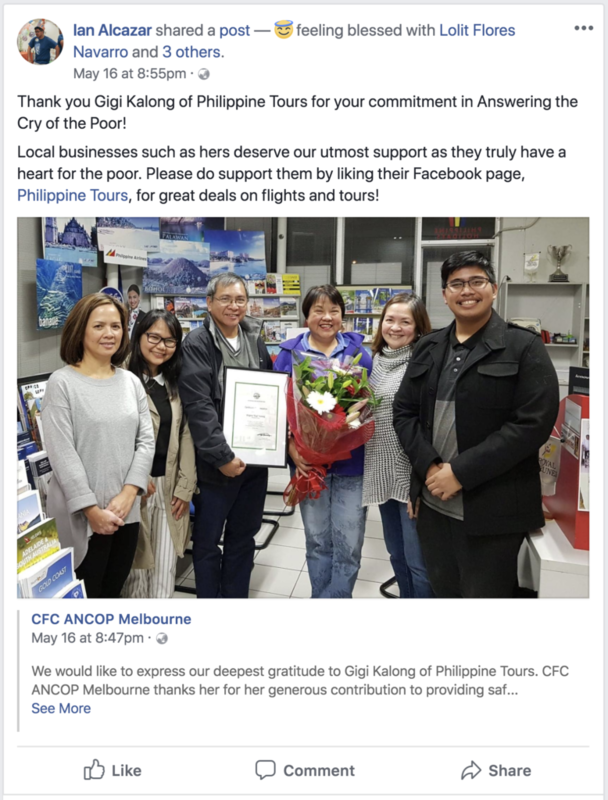 We have broad ranging trade, tourism and investment fora that look to drive people and communities towards a virtuous cycle of progress and prosperity. 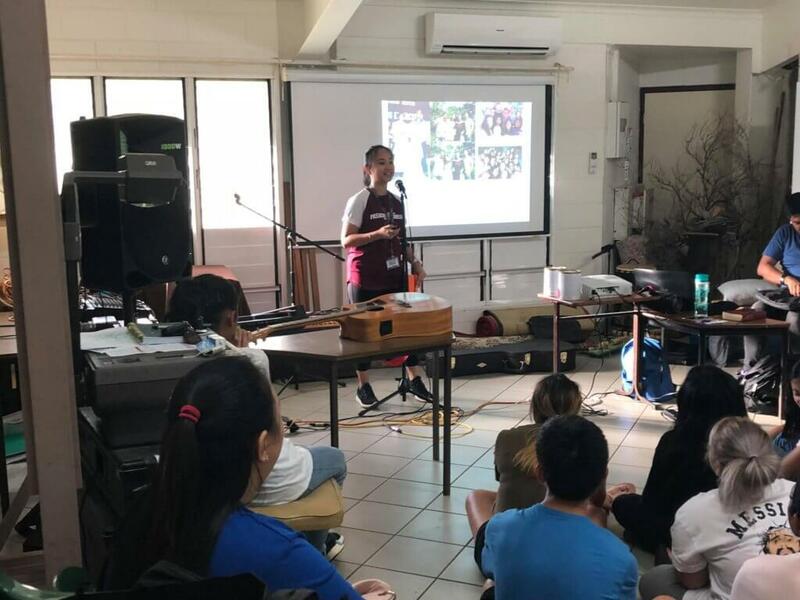 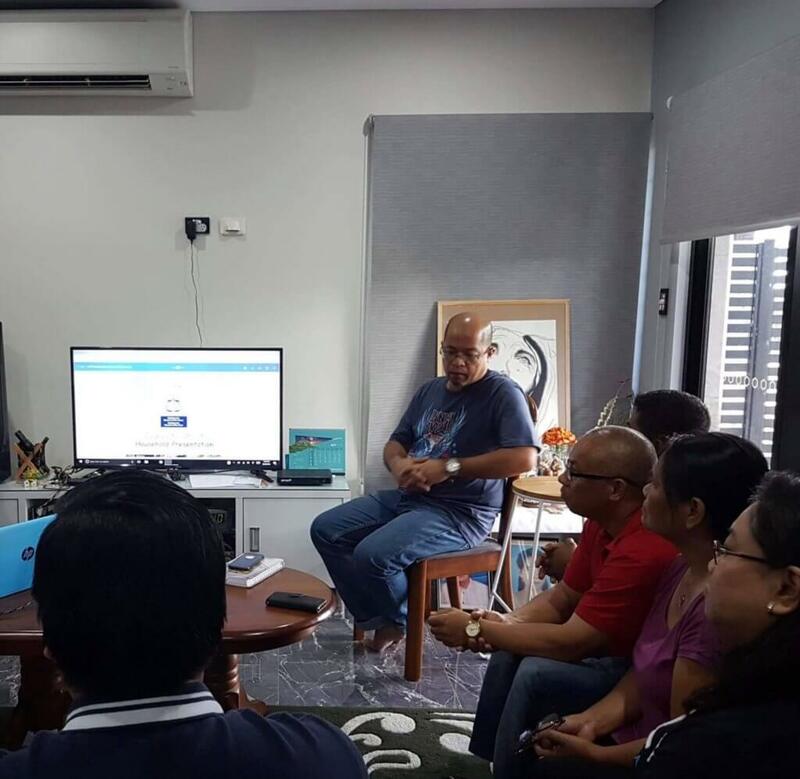 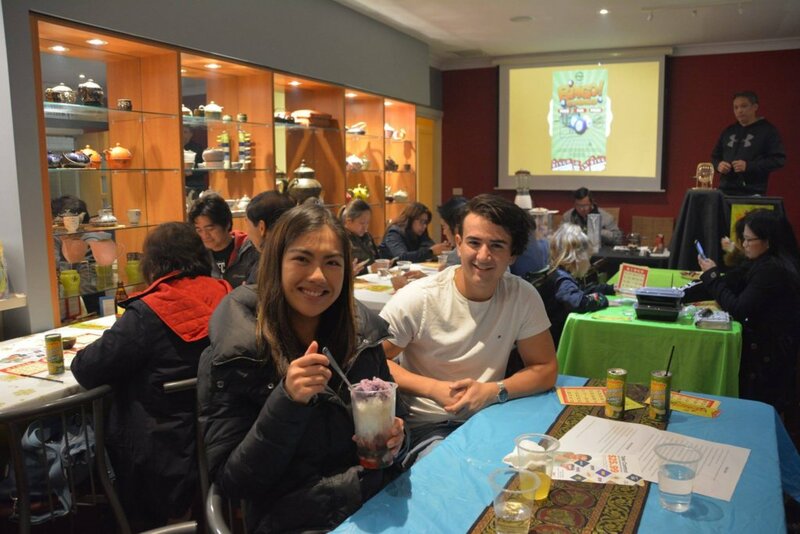 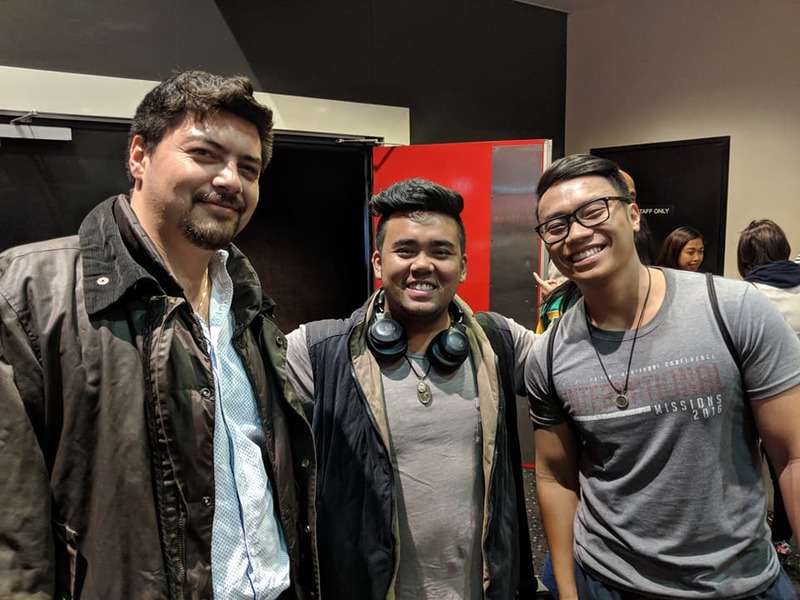 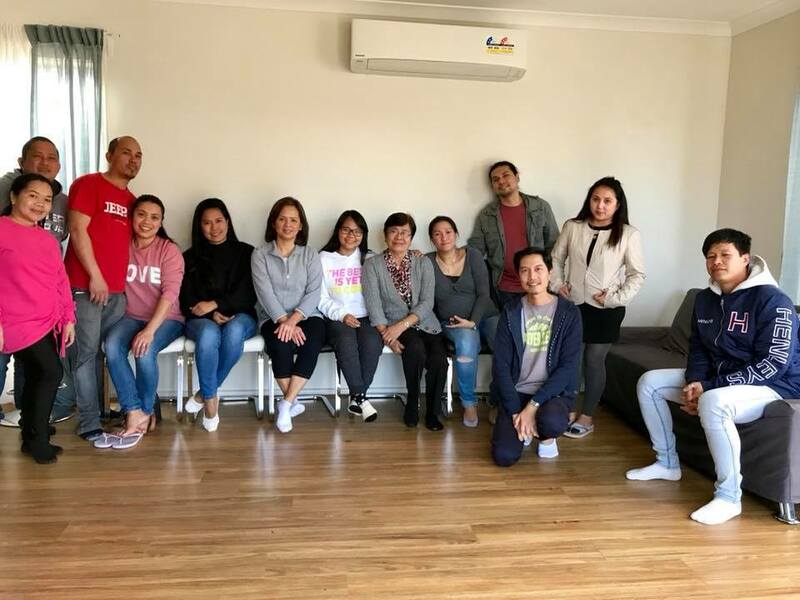 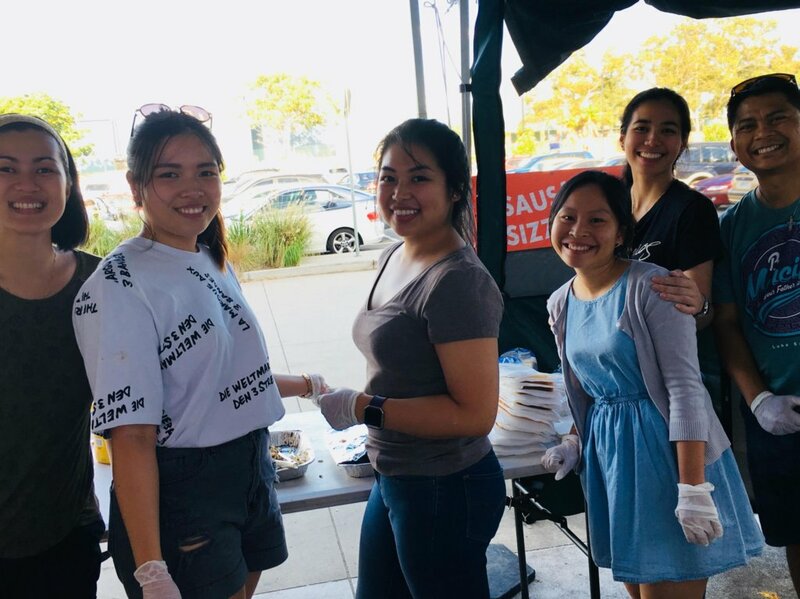 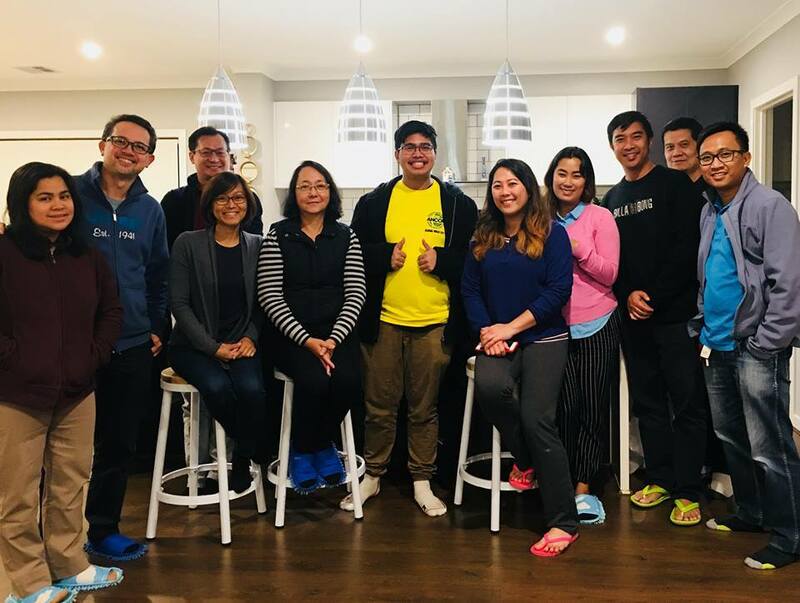 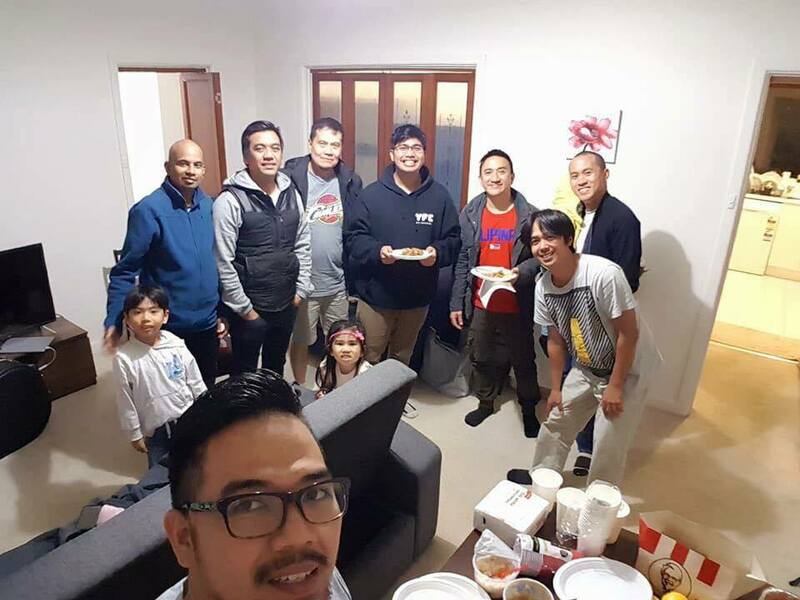 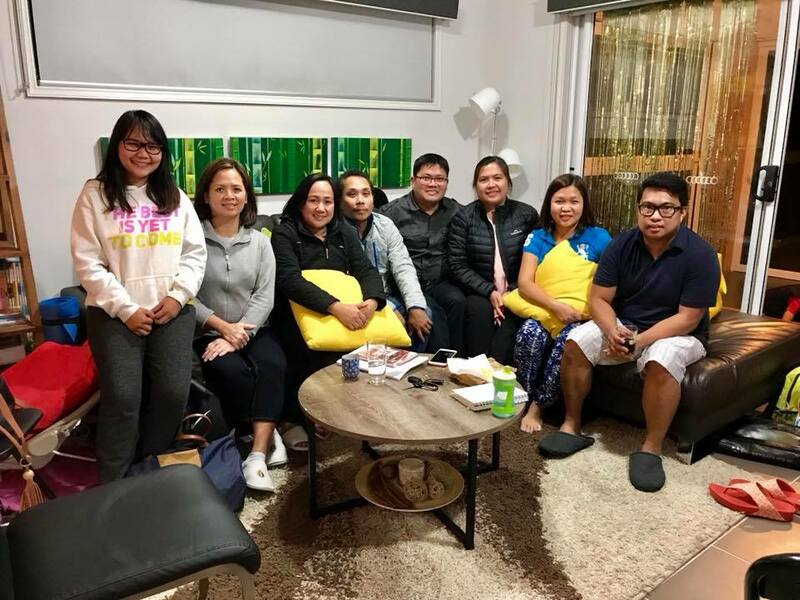 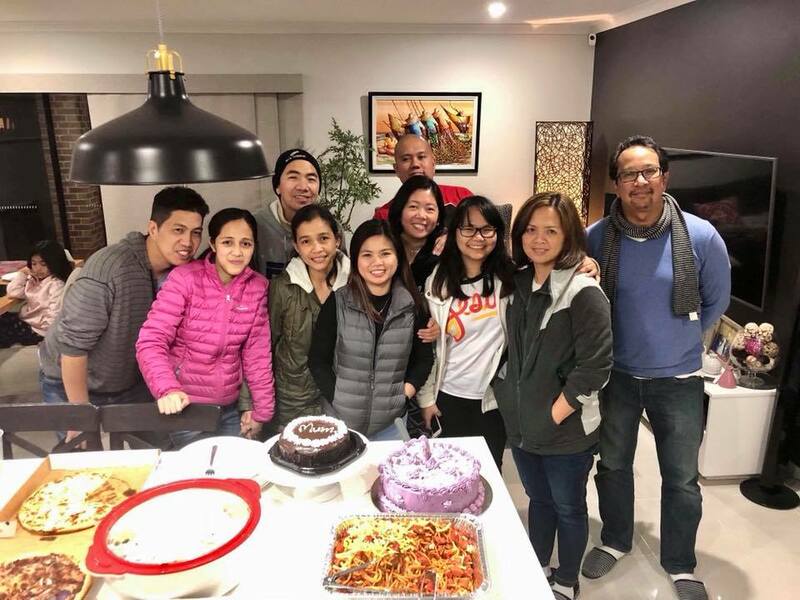 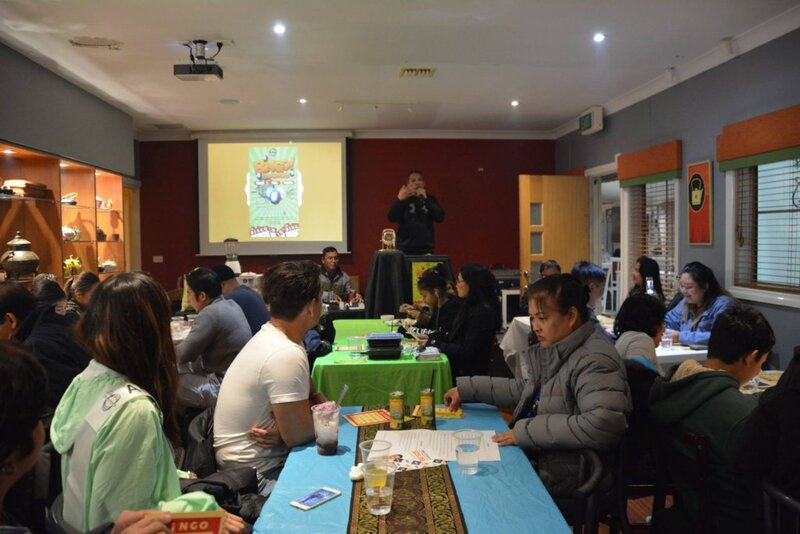 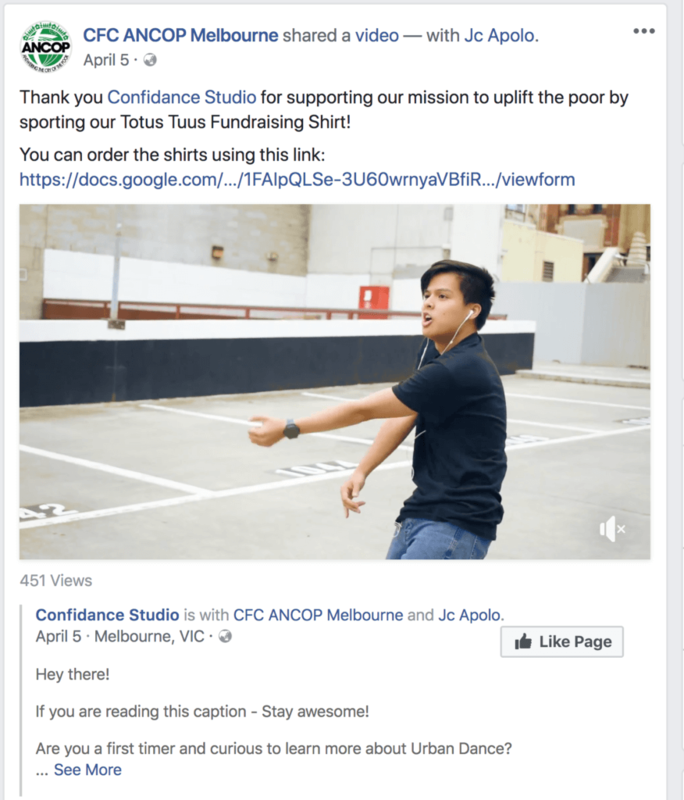 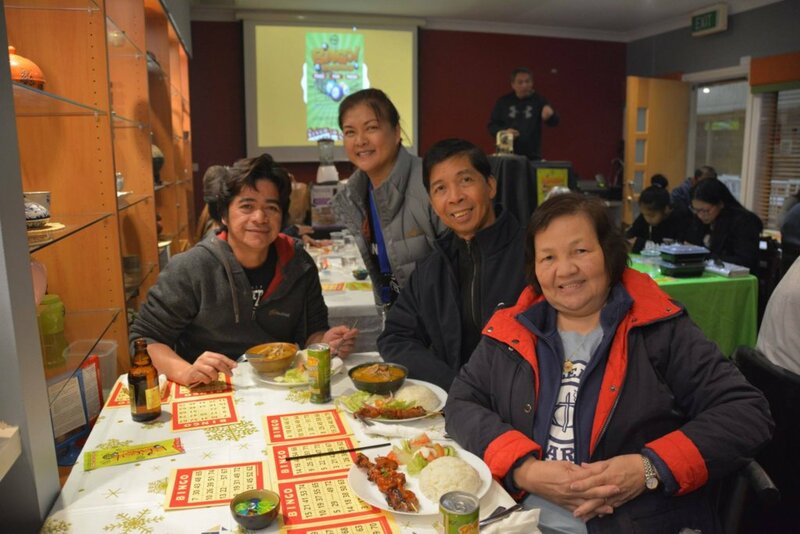 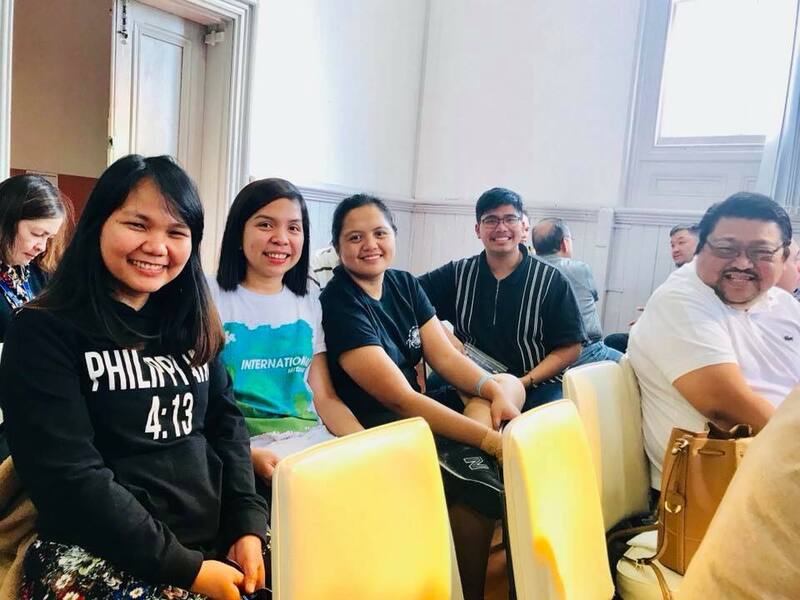 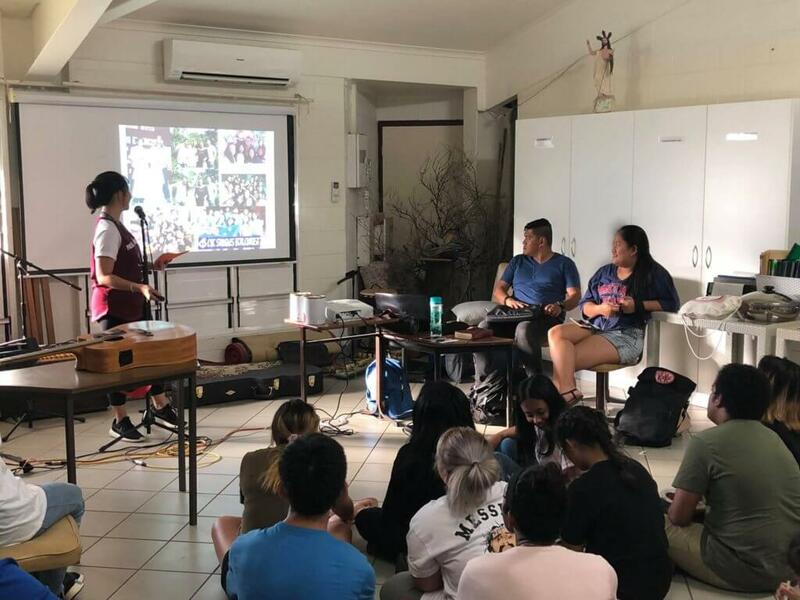 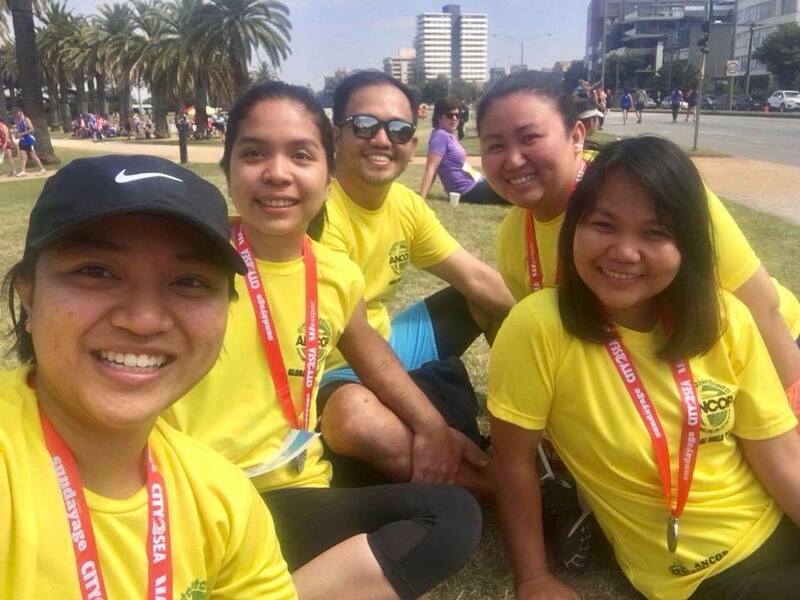 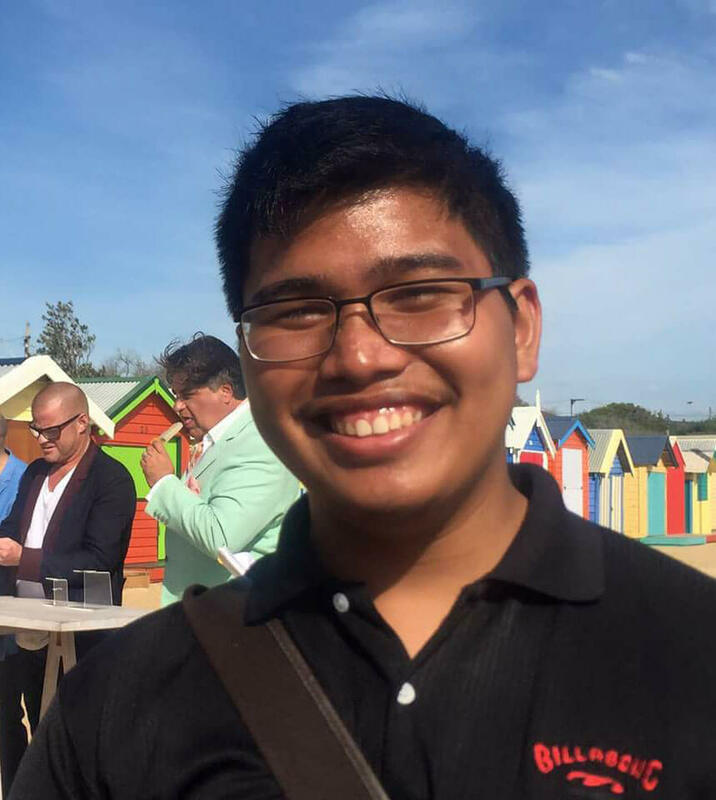 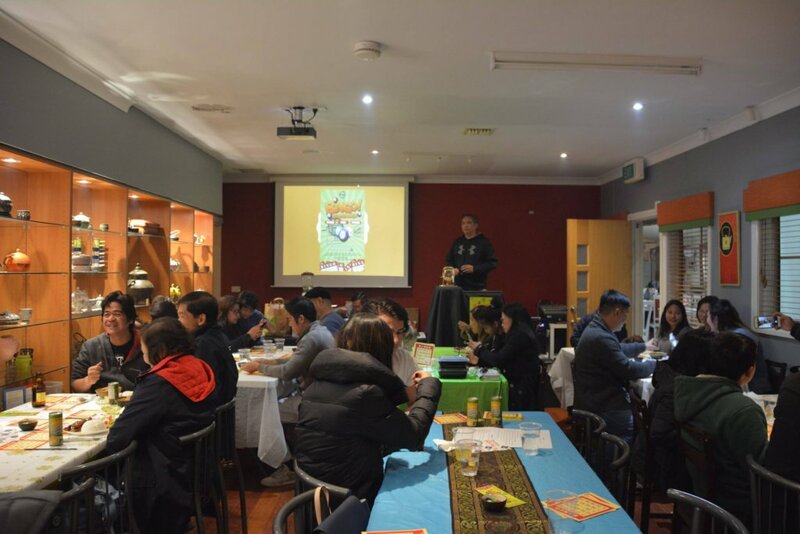 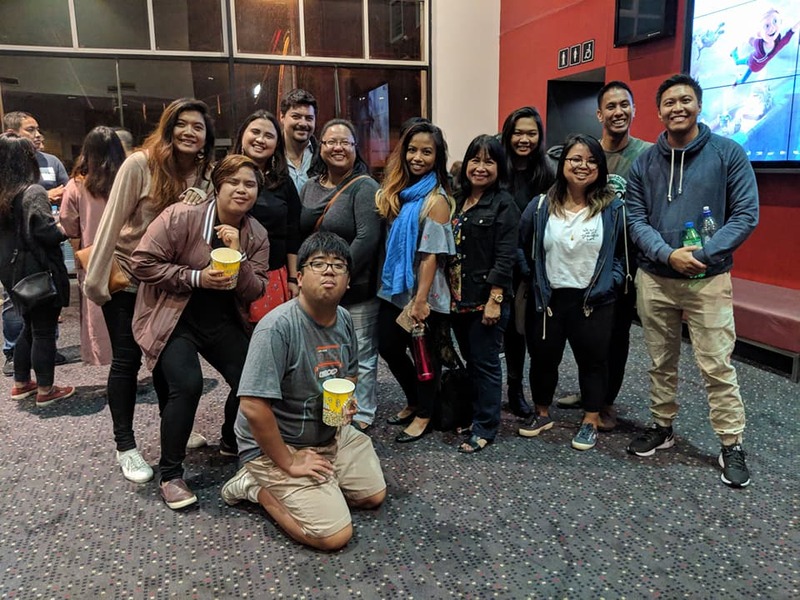 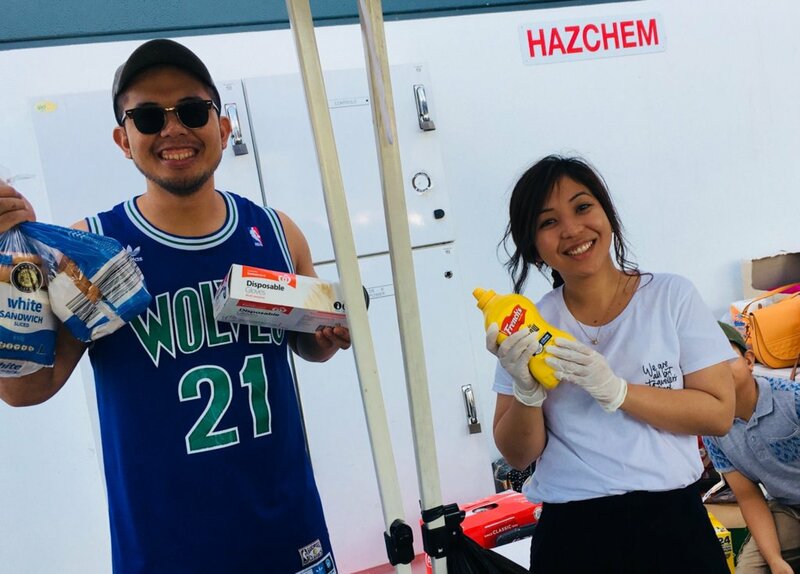 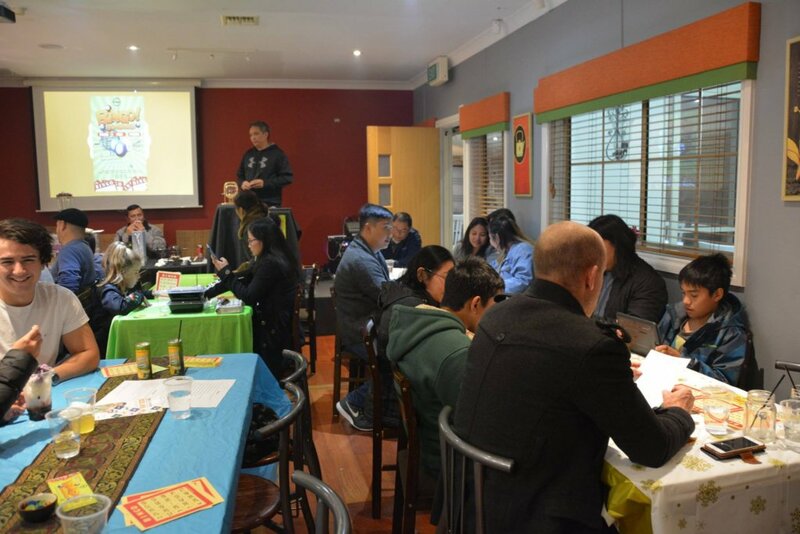 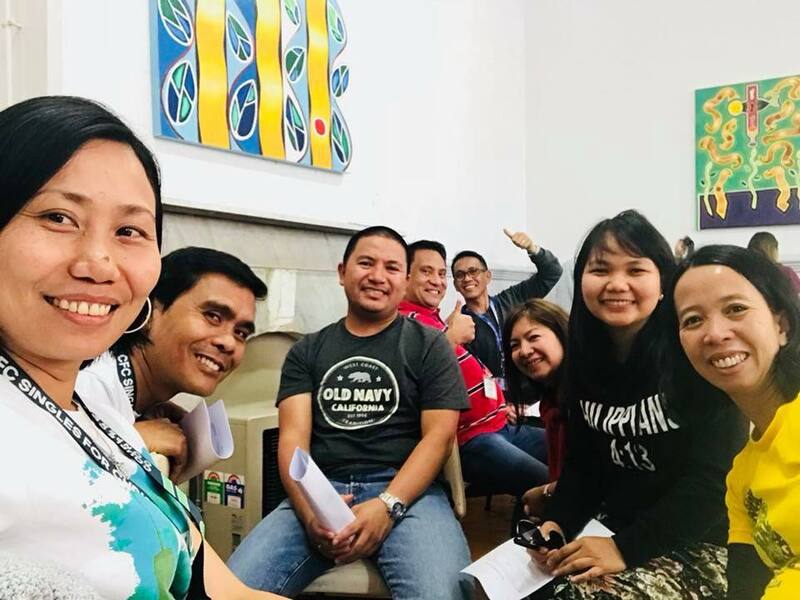 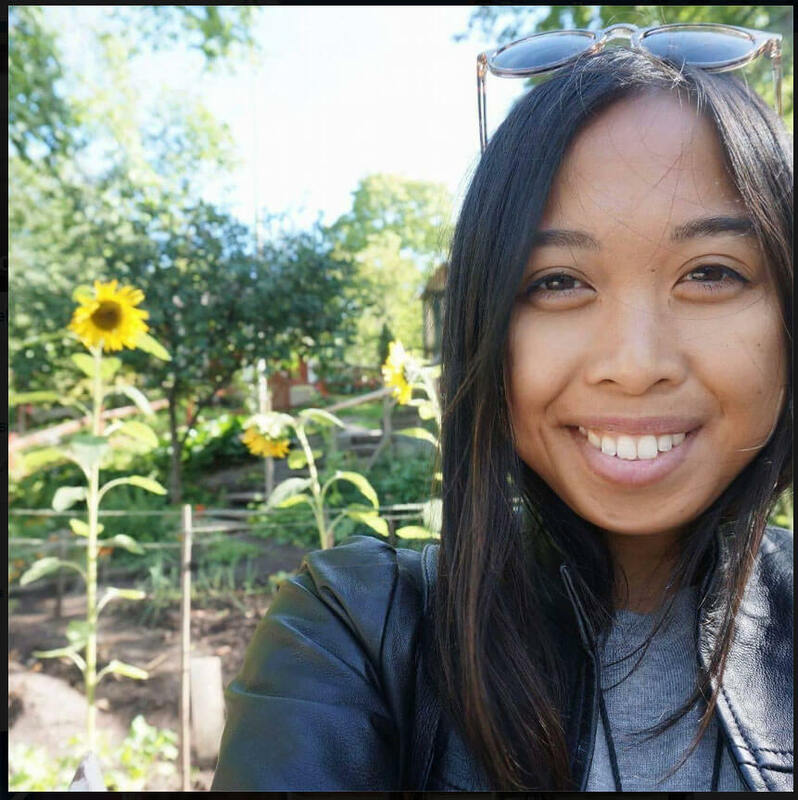 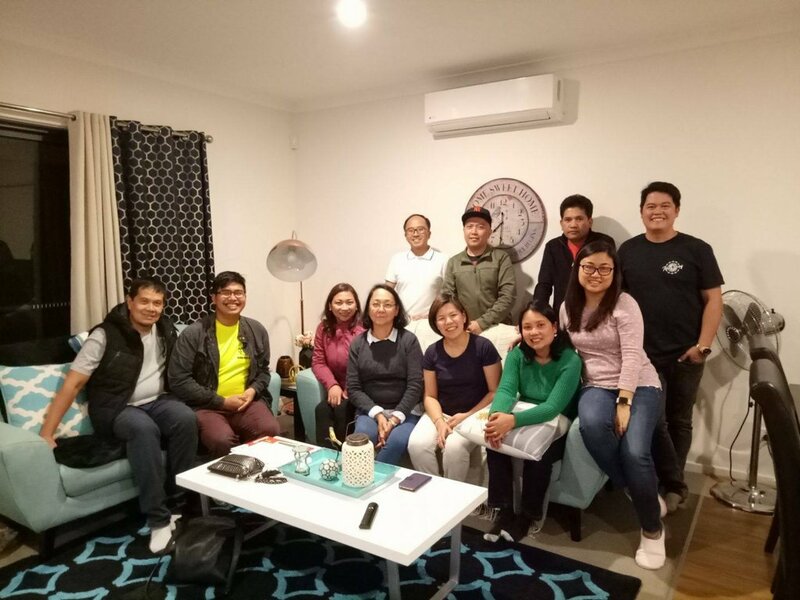 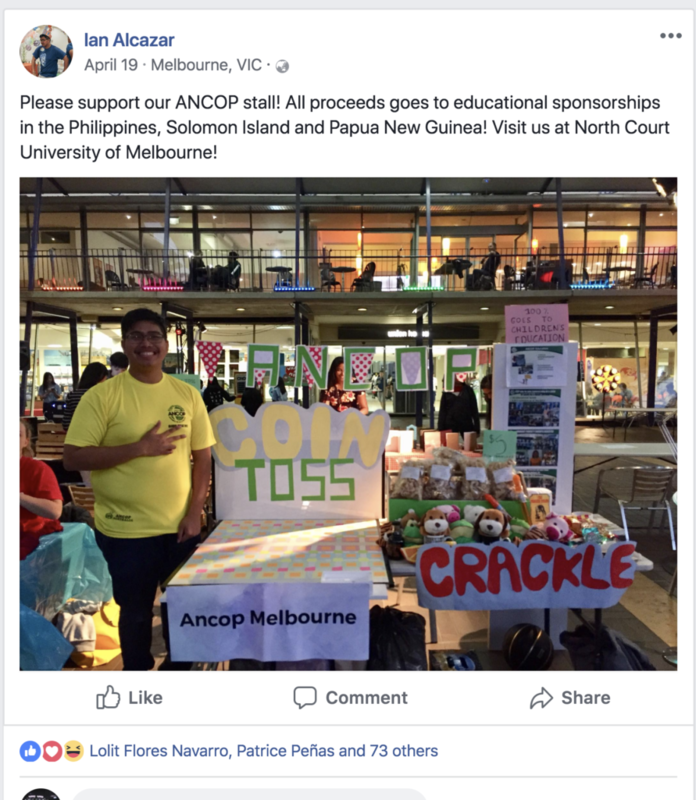 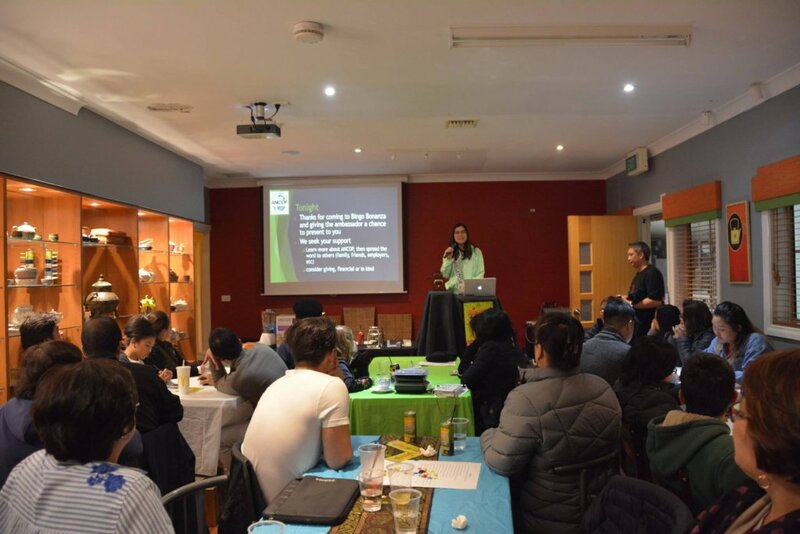 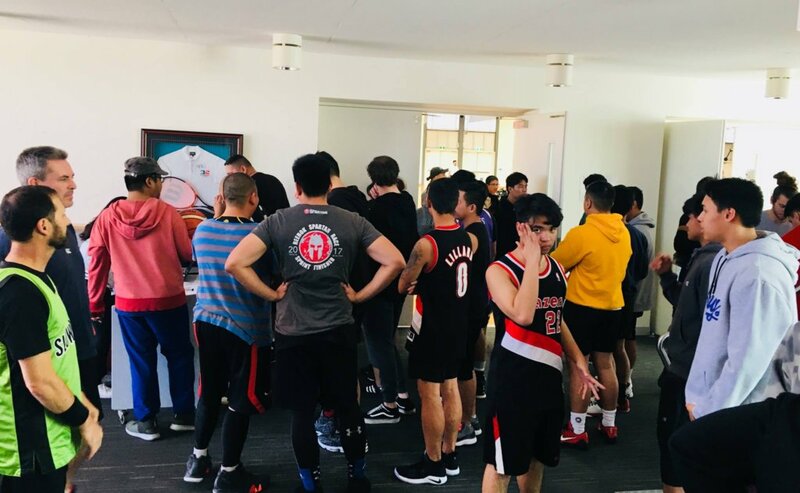 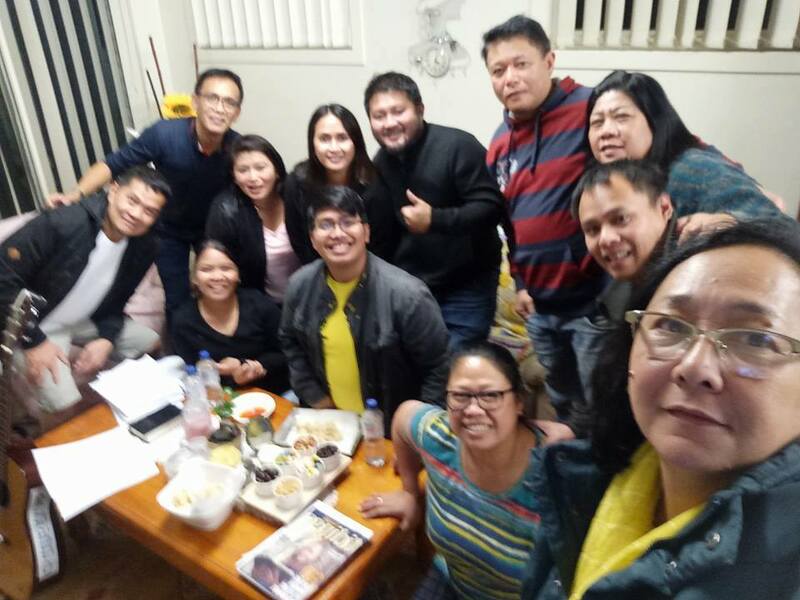 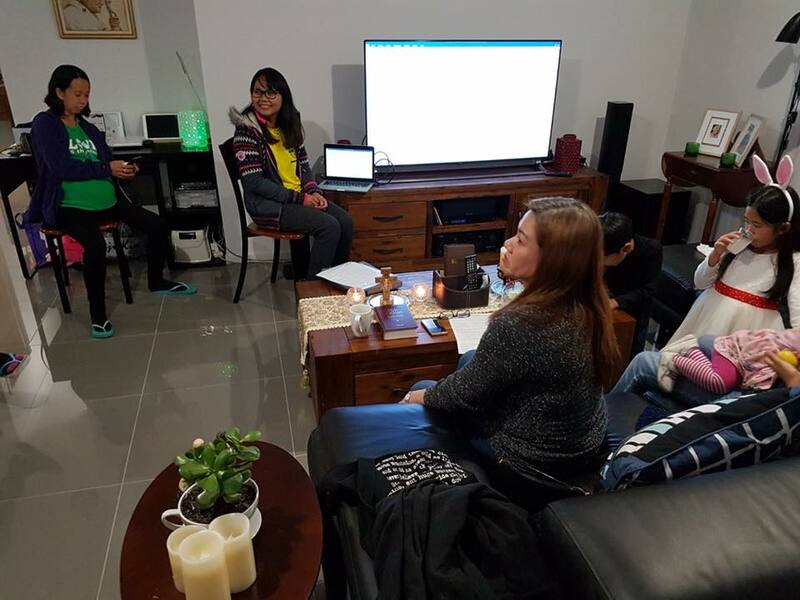 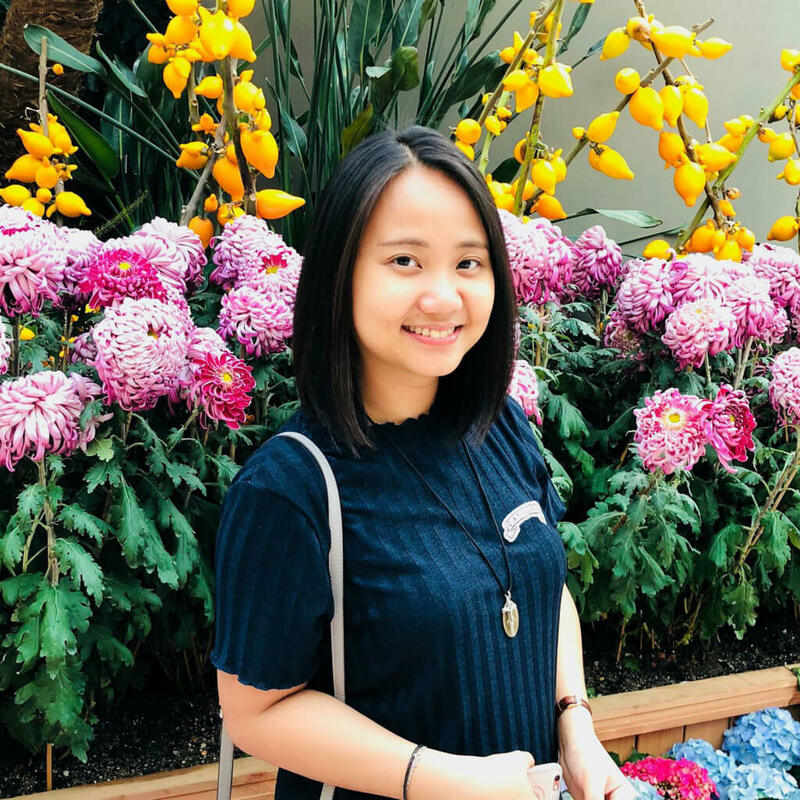 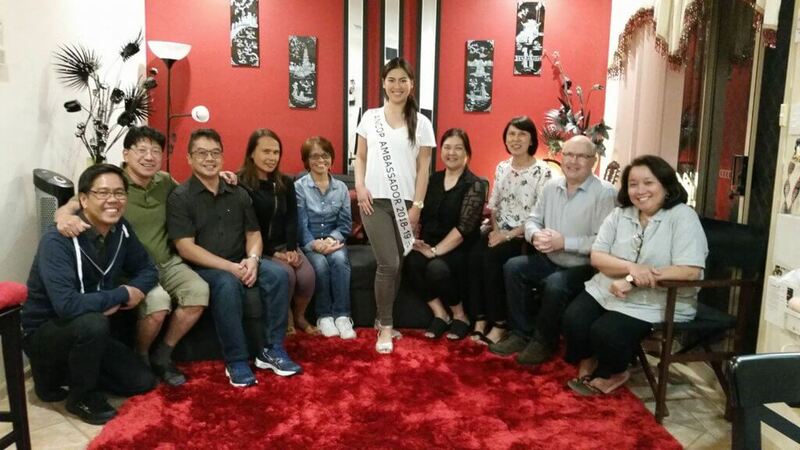 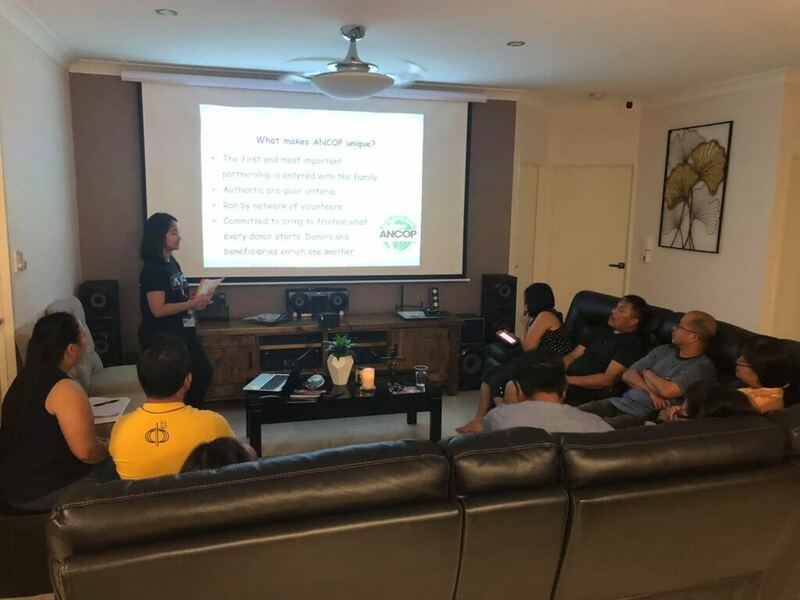 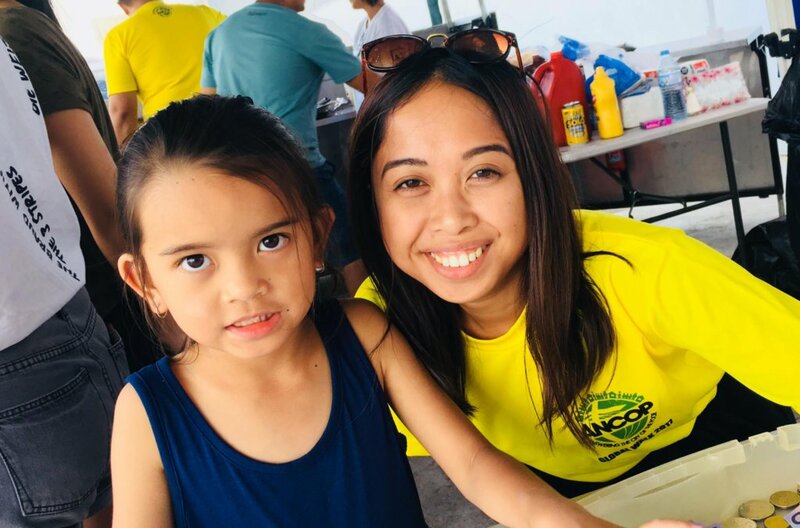 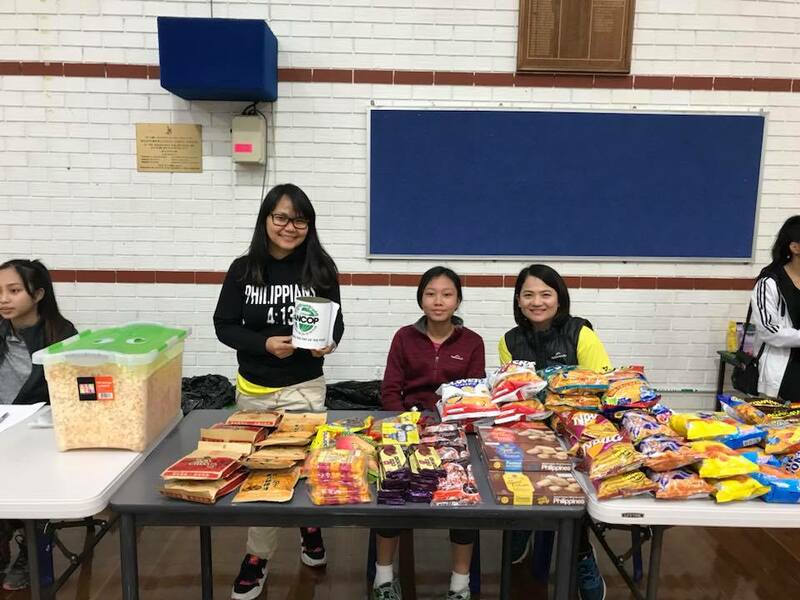 The Consulate likewise has extensive linkages with Filipino-Australian cultural and youth organizations in order to preserve and promote our rich and profound heritage, traditions, beliefs and principles. 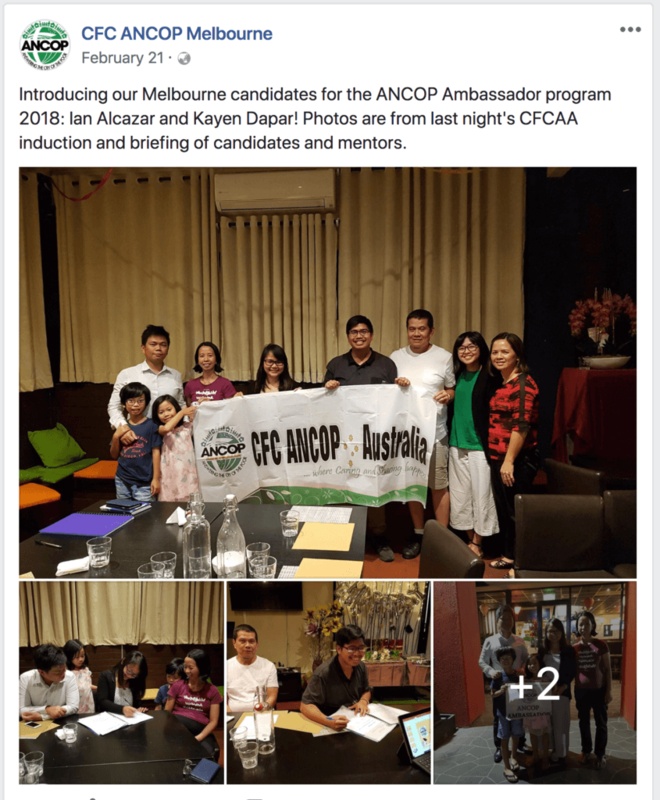 We have continuing campaigns for Citizenship Re-Acquisition and for Overseas Voting, to maximize the rights and privileges available to Filipinos, and to afford them a greater voice in the future of our country and countrymen. 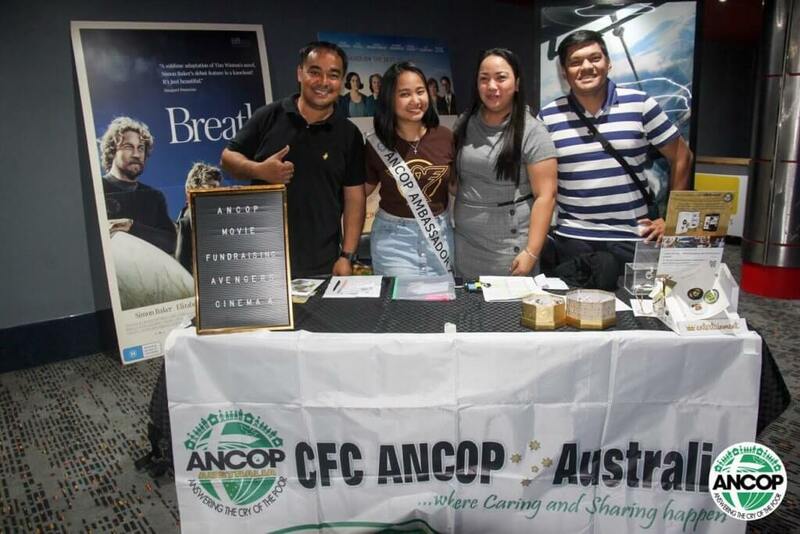 On all these fronts, the Philippine Consulate and CFC ANCOP would make great natural partners. 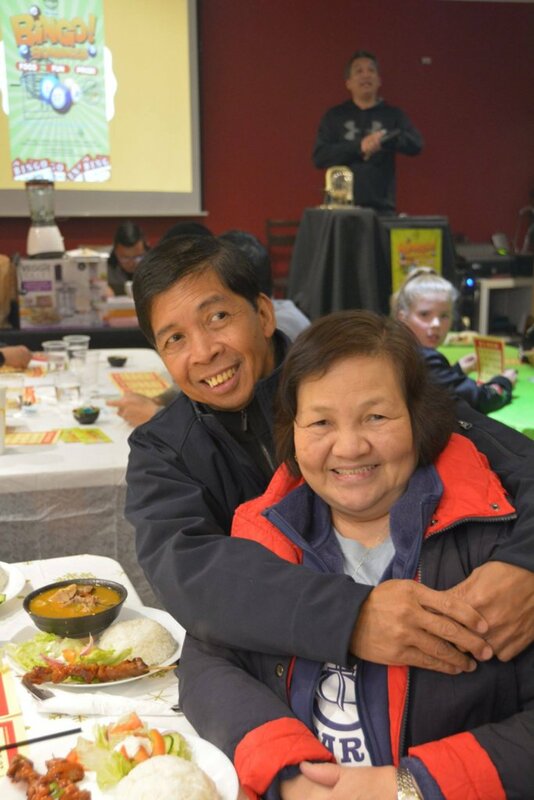 Again, you have already demonstrated and established that you carry noble ideas and practical solutions. 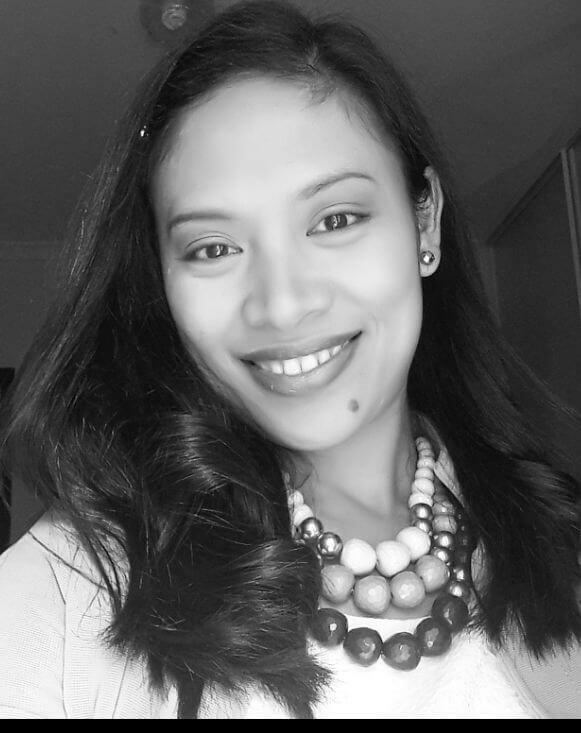 You’ve prayed over your endeavours, kept your intentions good, and acted meaningfully. 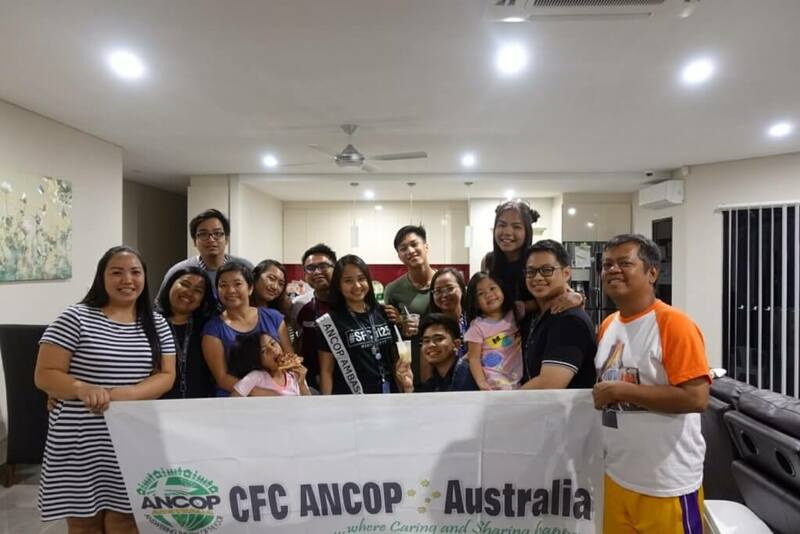 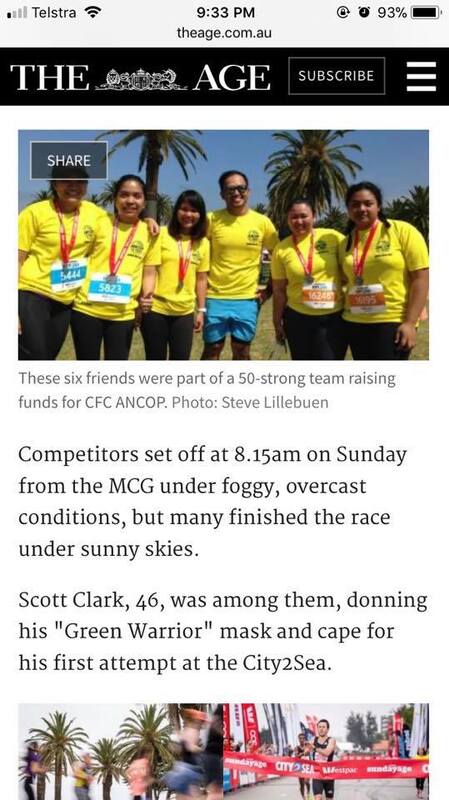 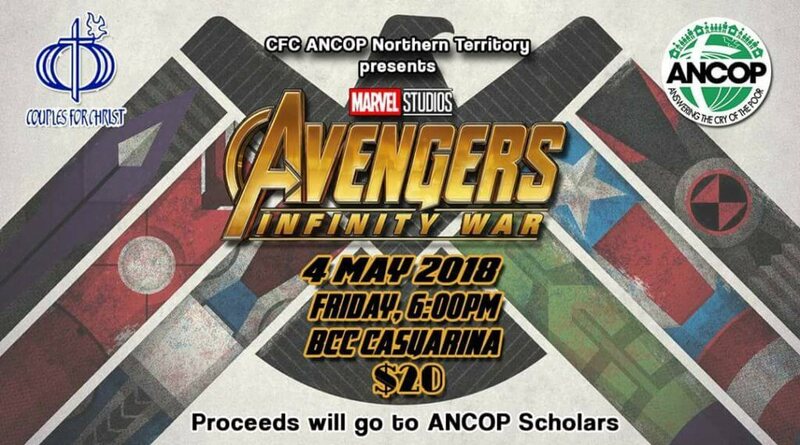 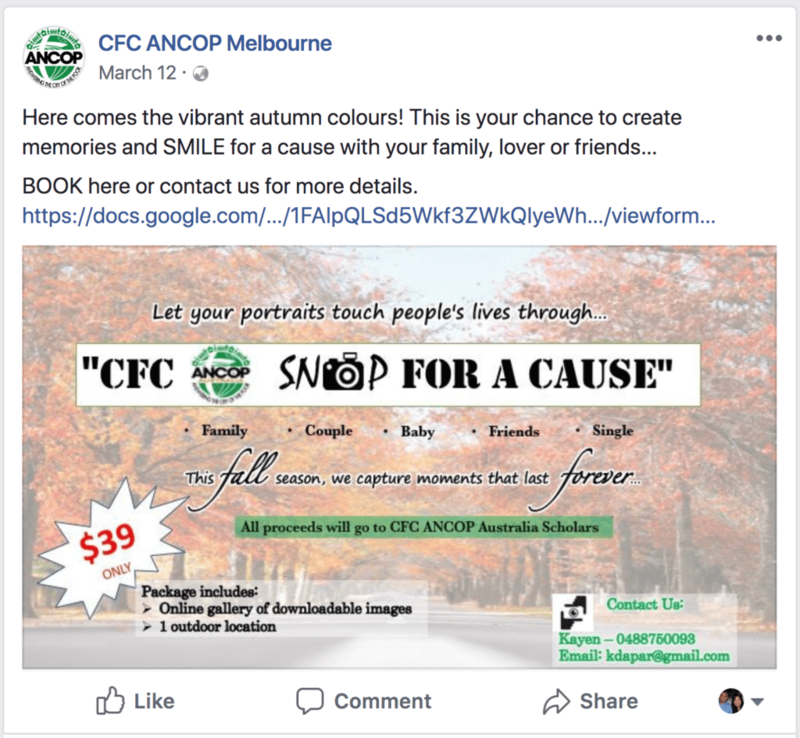 It would be an honour for the Consulate to work with CFC ANCOP, and it would be a privilege for us to exhort other groups and gatherings to emulate our endeavours. 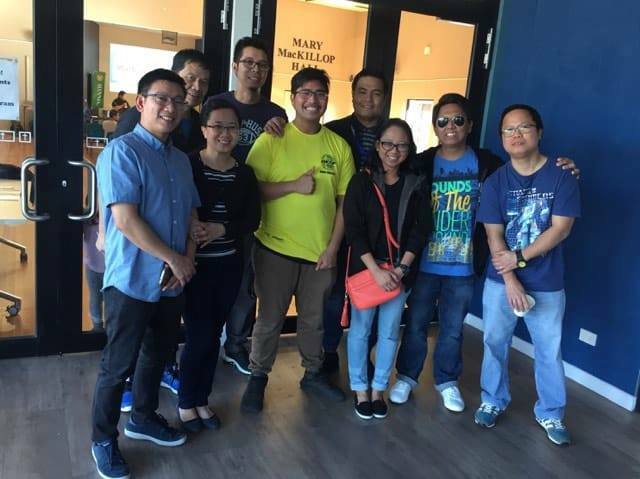 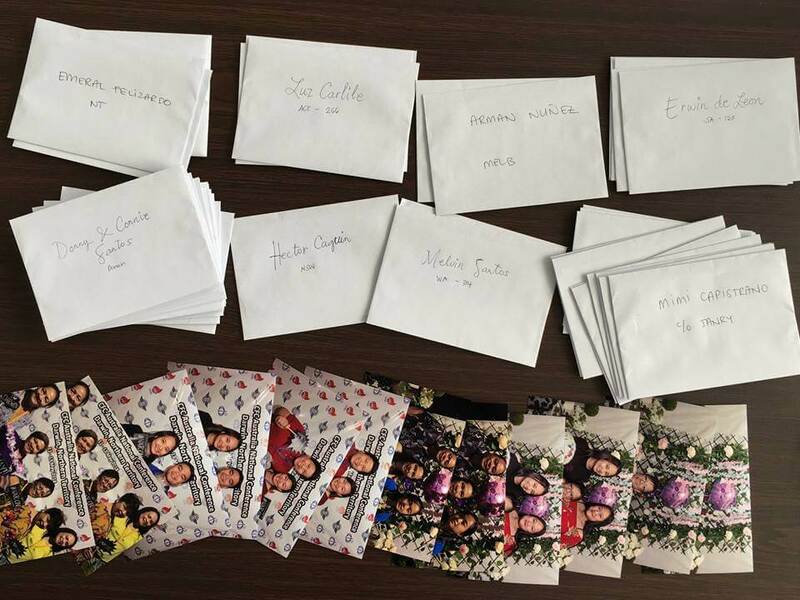 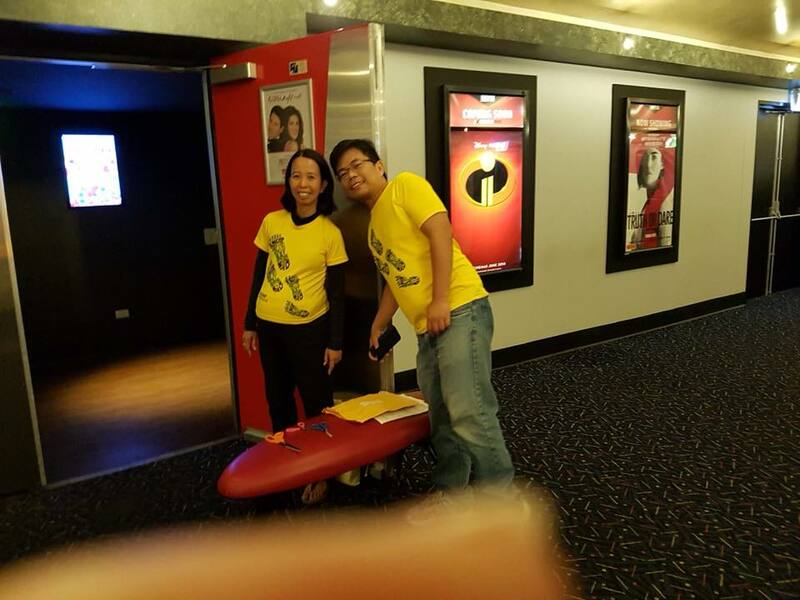 We at the Consulate are here to serve the Filipino and the Philippines. 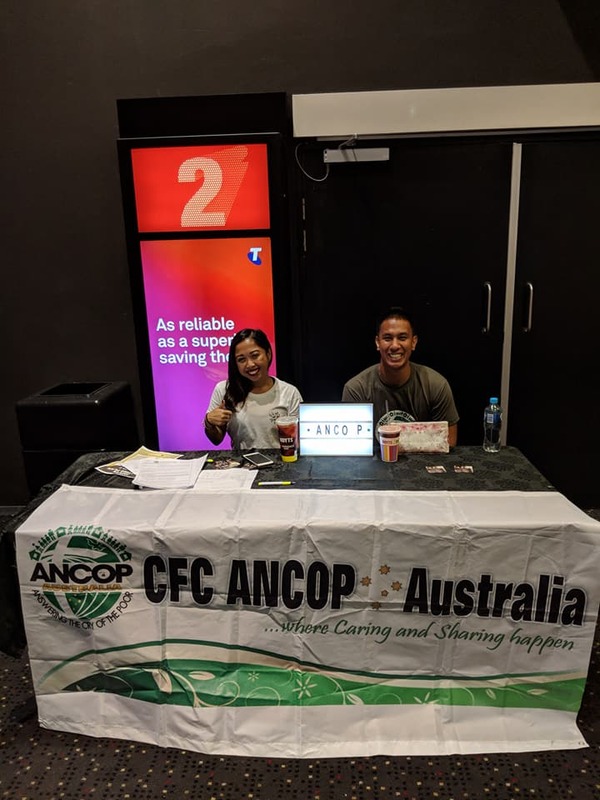 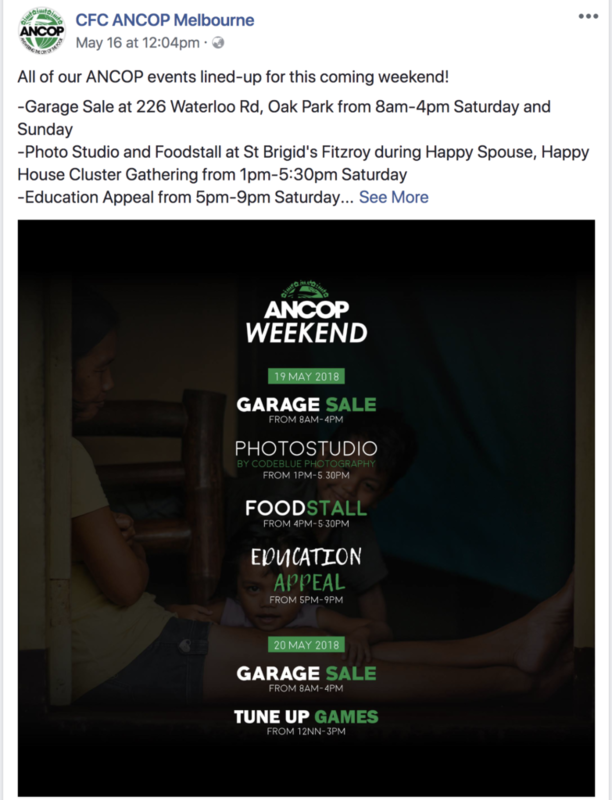 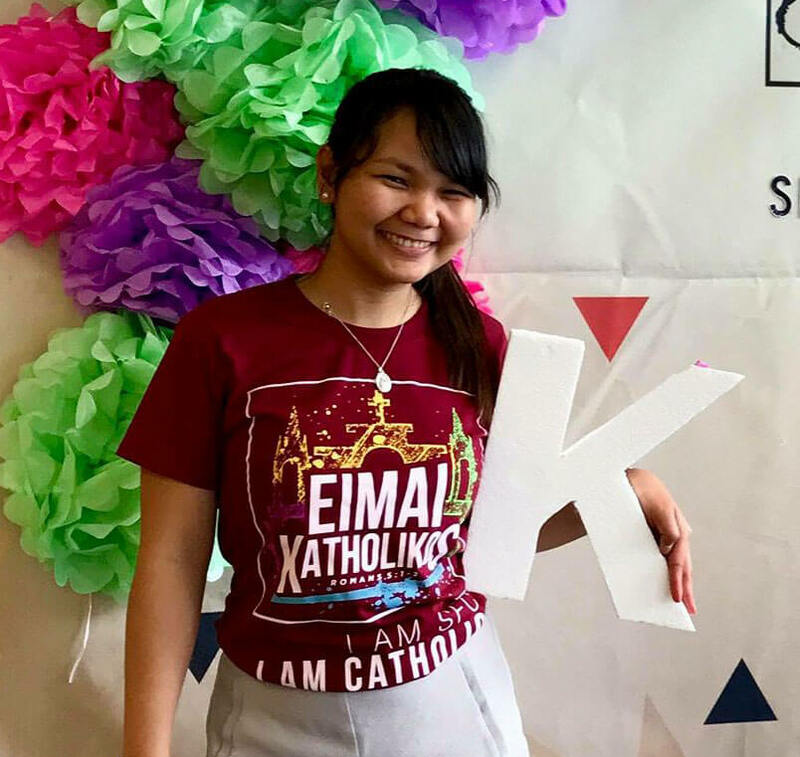 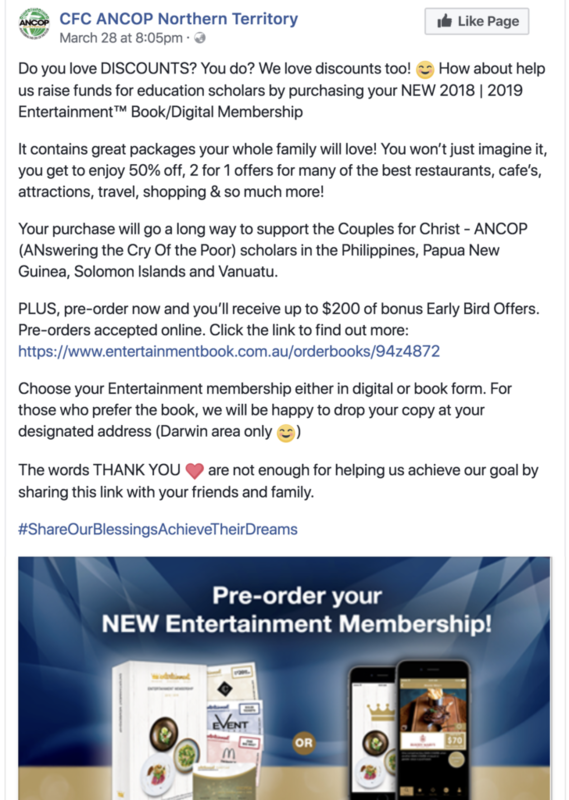 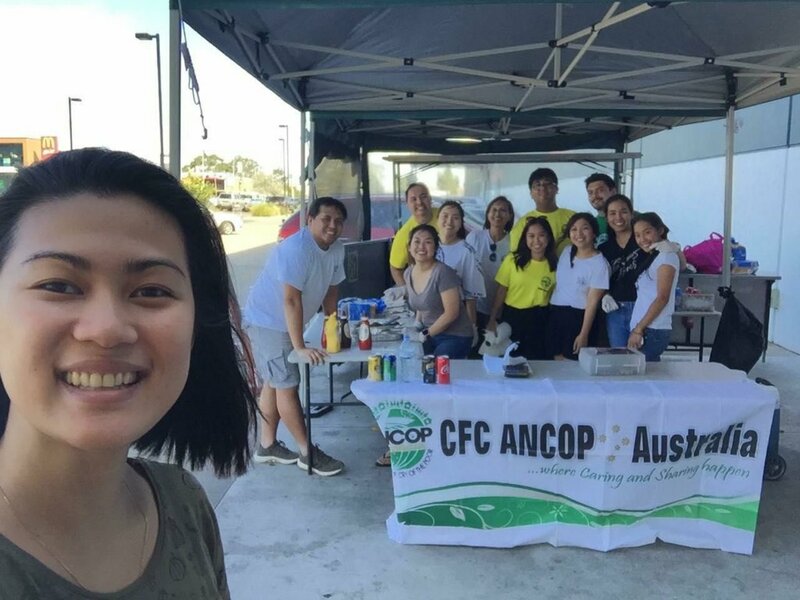 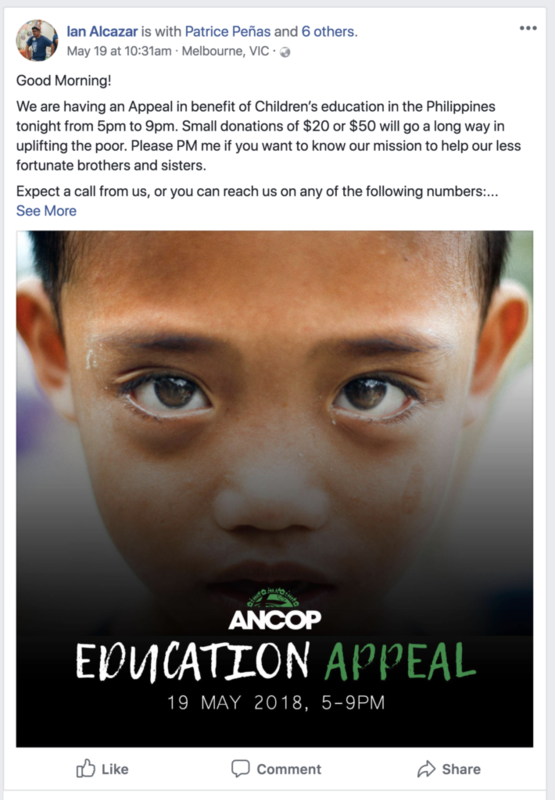 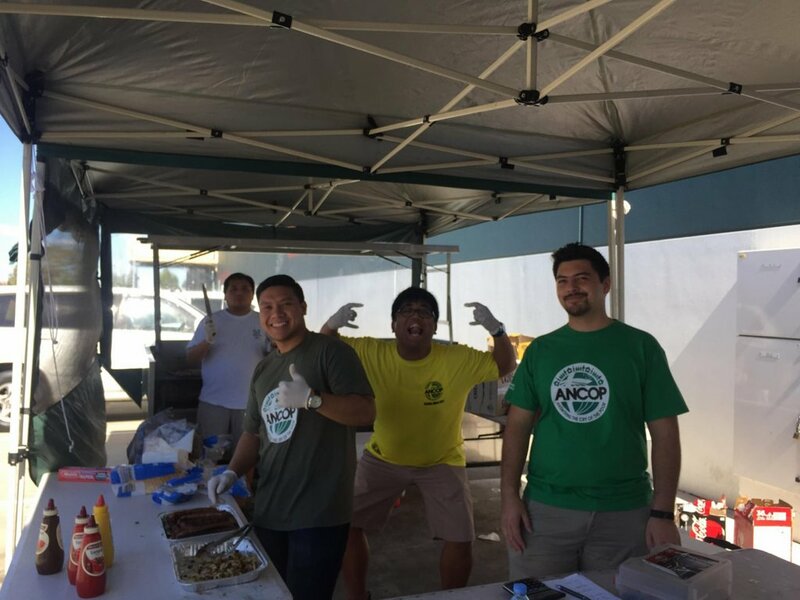 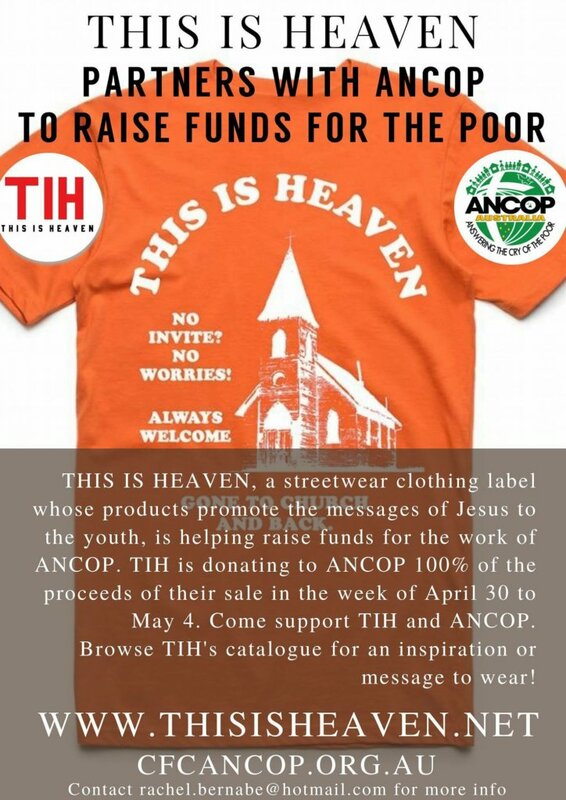 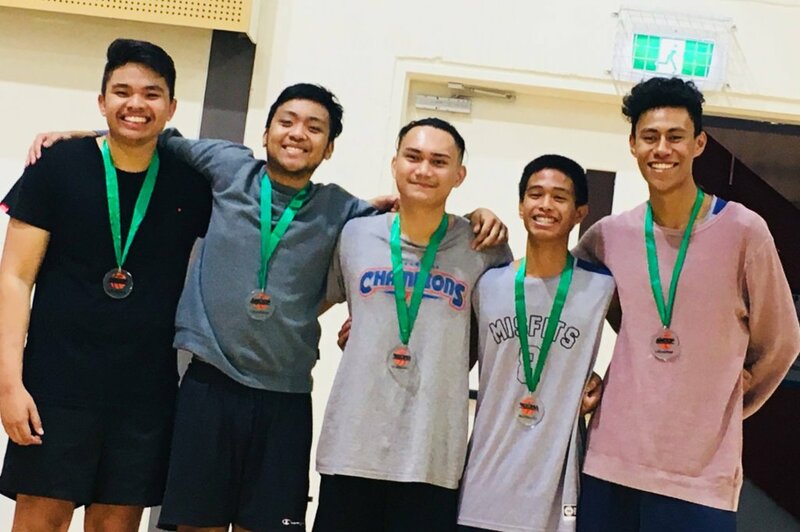 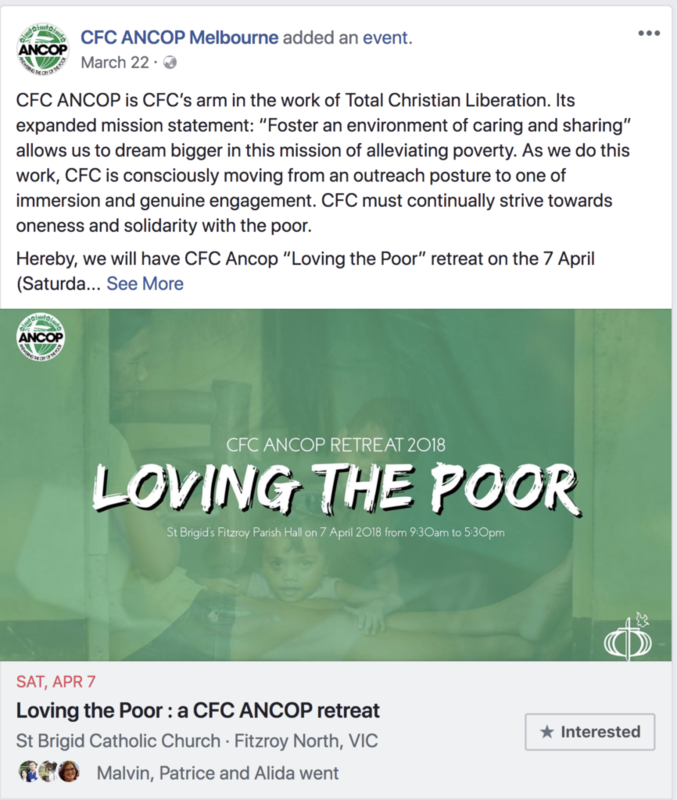 CFC ANCOP is here to serve God and our fellow man. 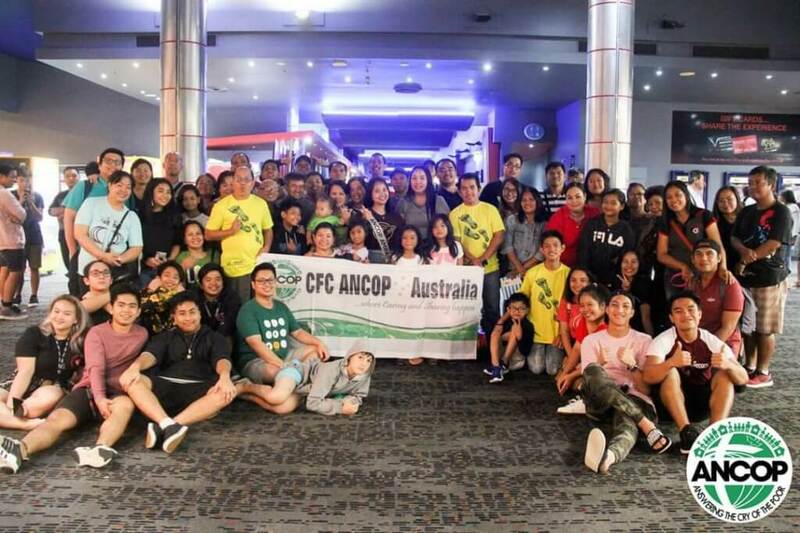 Together, we can bring an even higher level of joy, passion and devotion to Australia, and an overflow of happiness and satisfaction that spans the Philippines and the Pacific. 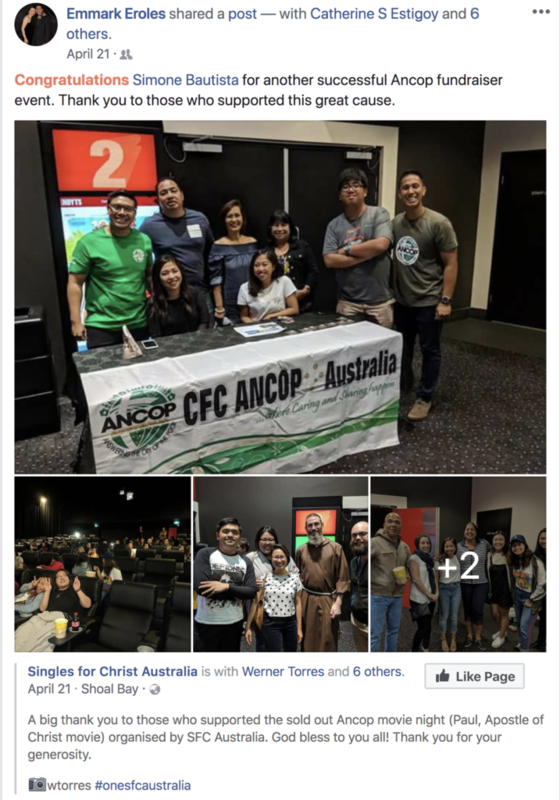 God bless everyone here, God Bless CFC ANCOP. 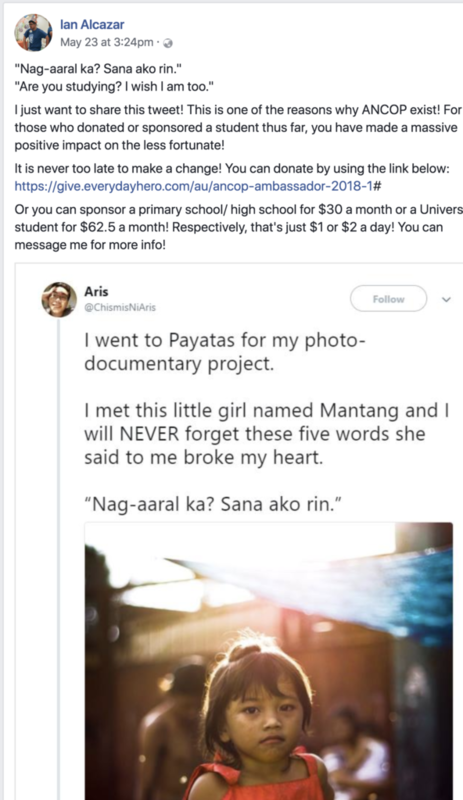 Mabuhay po tayong lahat! 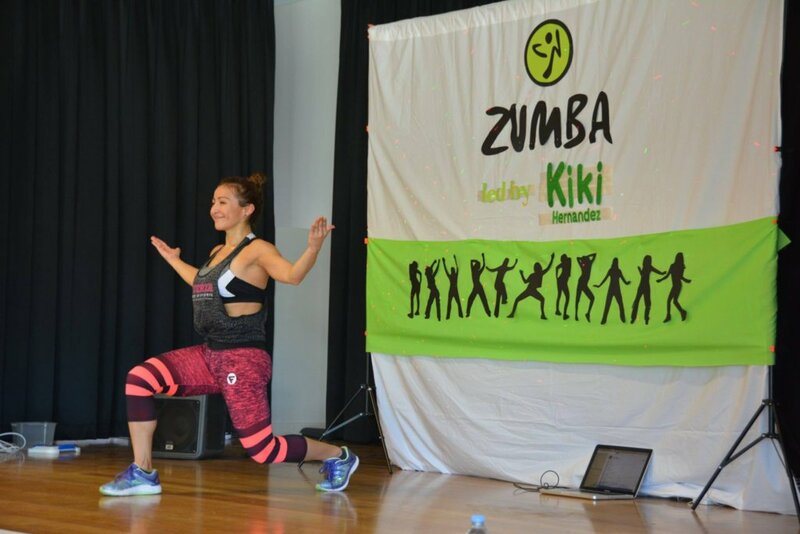 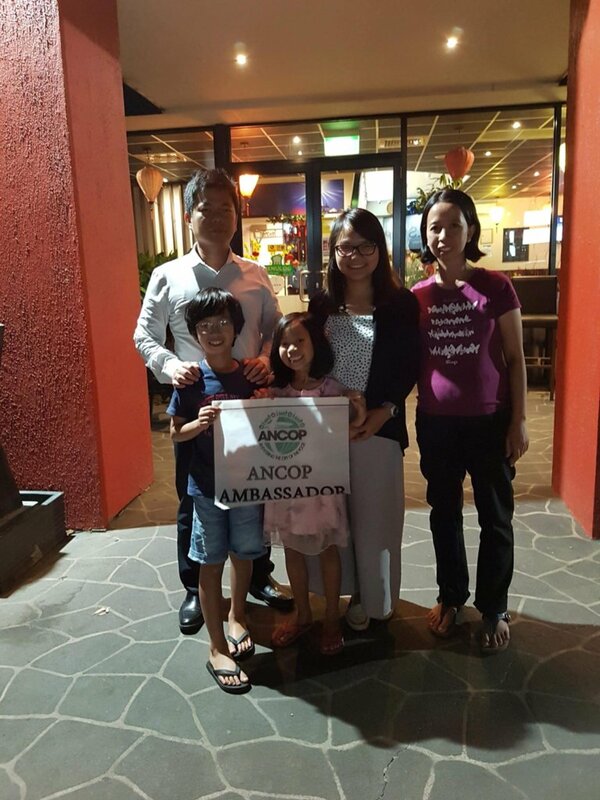 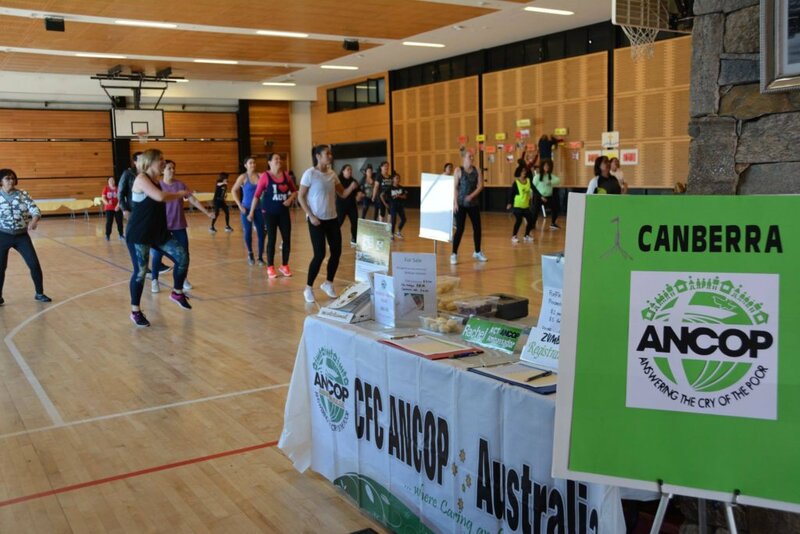 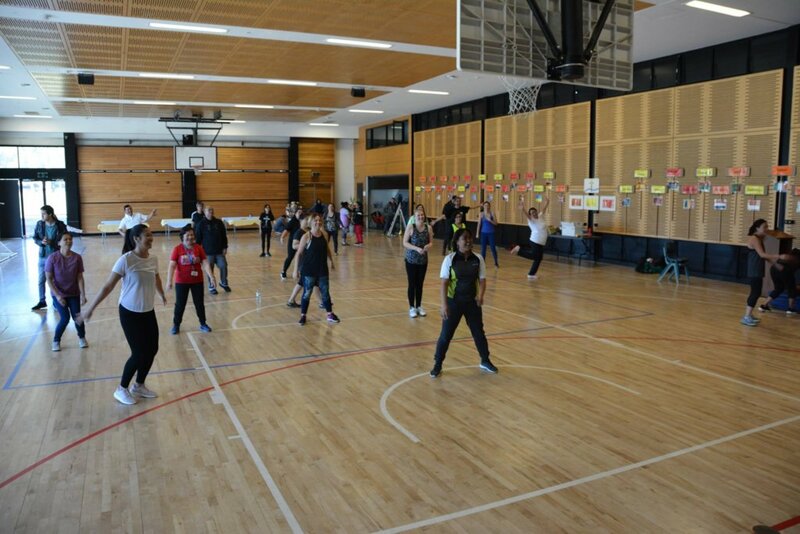 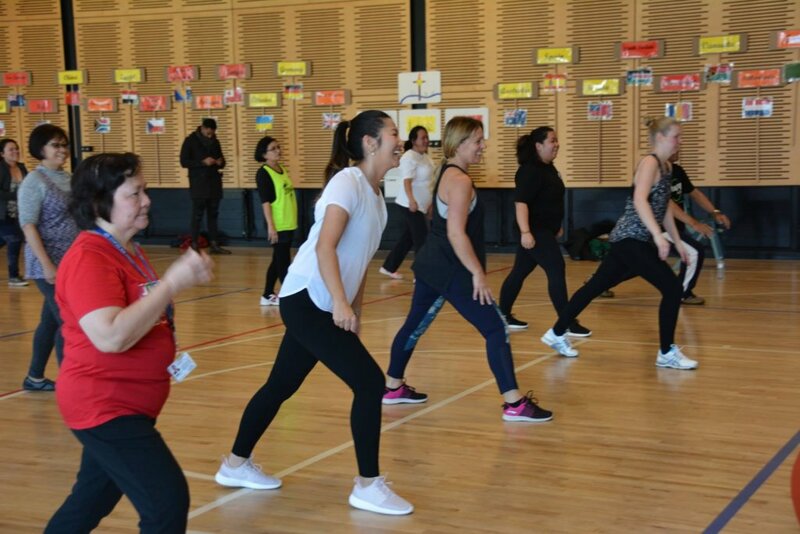 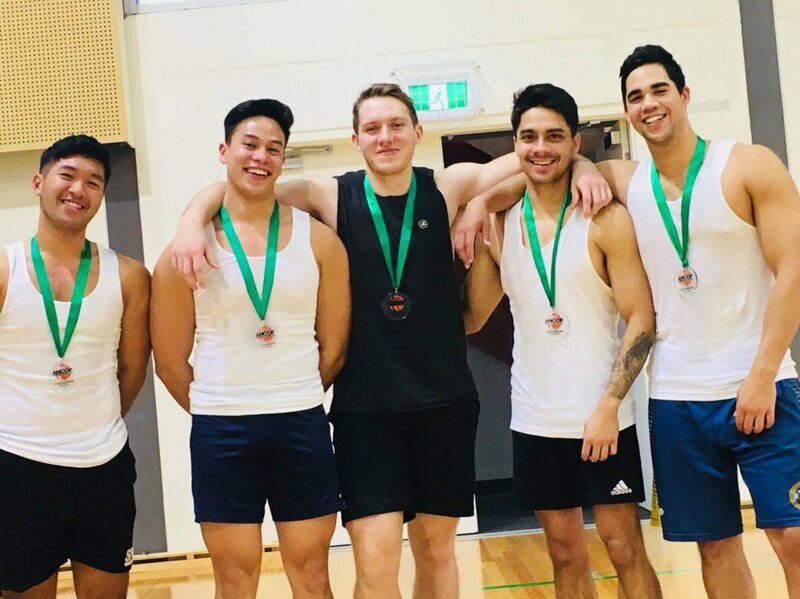 This year's Ambassador Launch Campaign will culminate on 26 May 2018 - when all 2018-19 ANCOP Ambassadors all over Australia gather together in Sydney to celebrate the fruits of their hard work and honour everyone who supported ANCOP through this program.